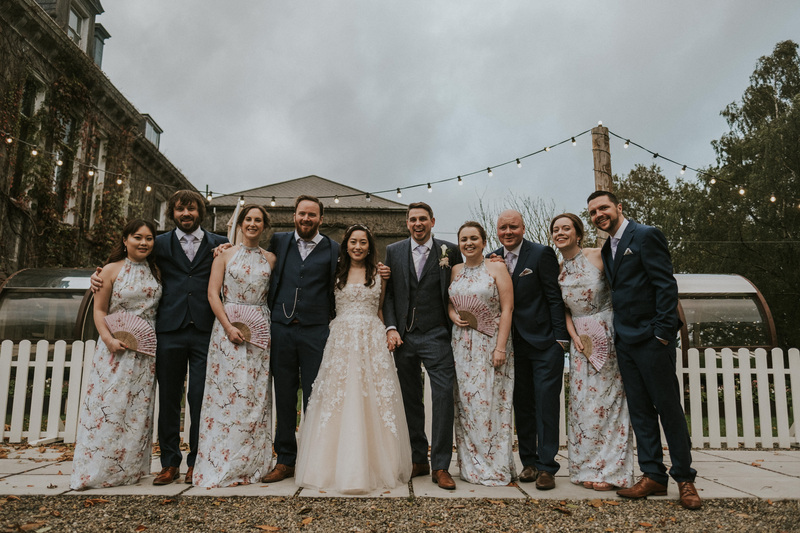 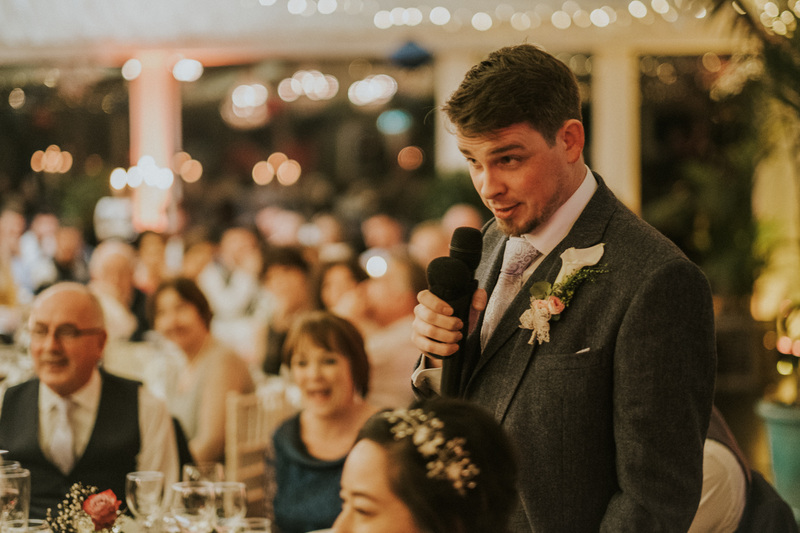 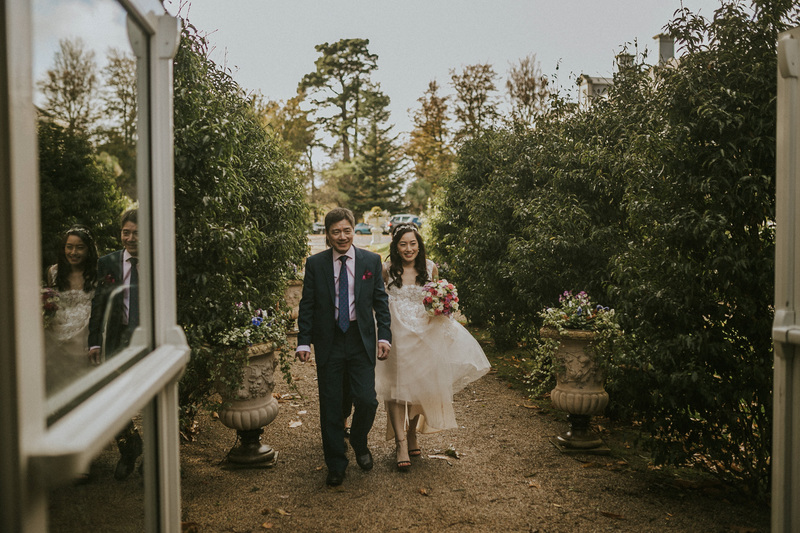 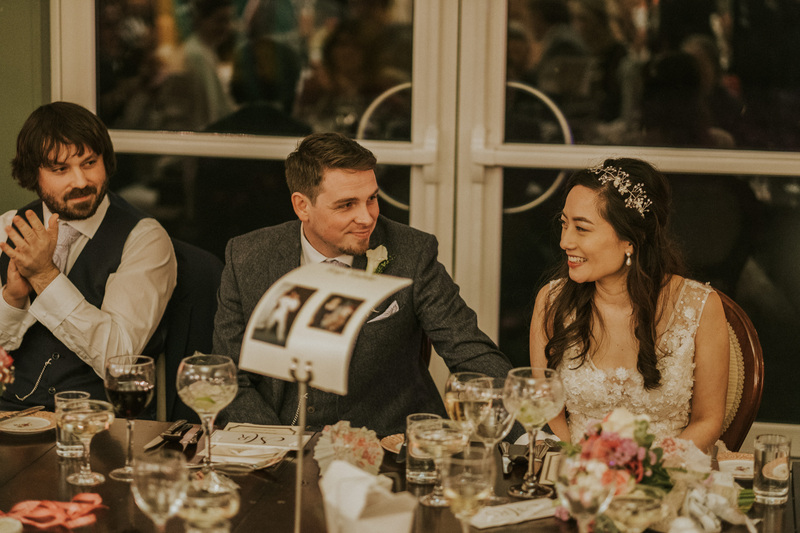 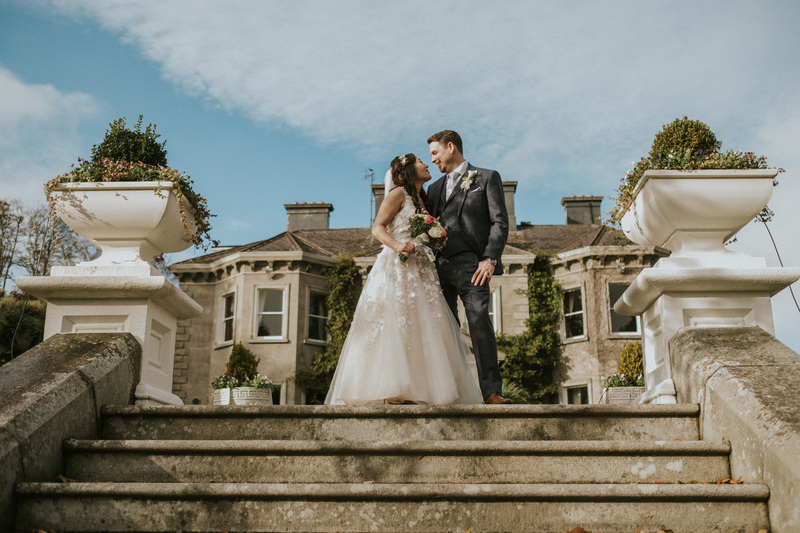 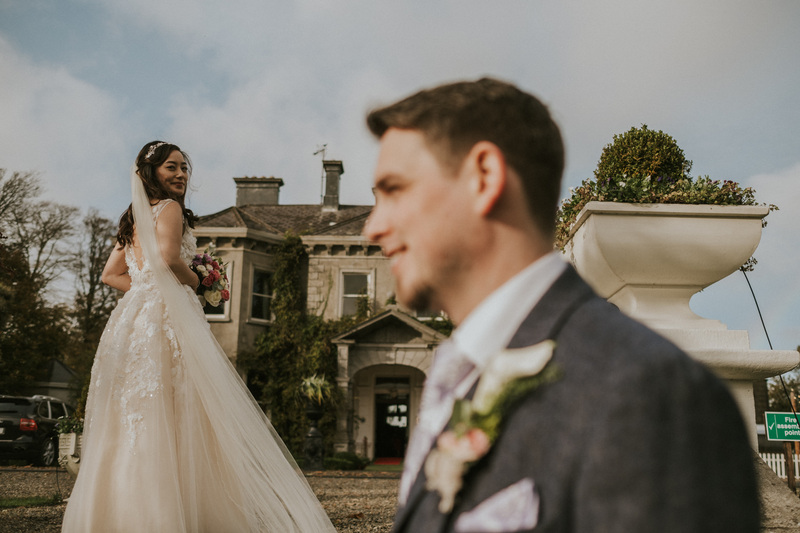 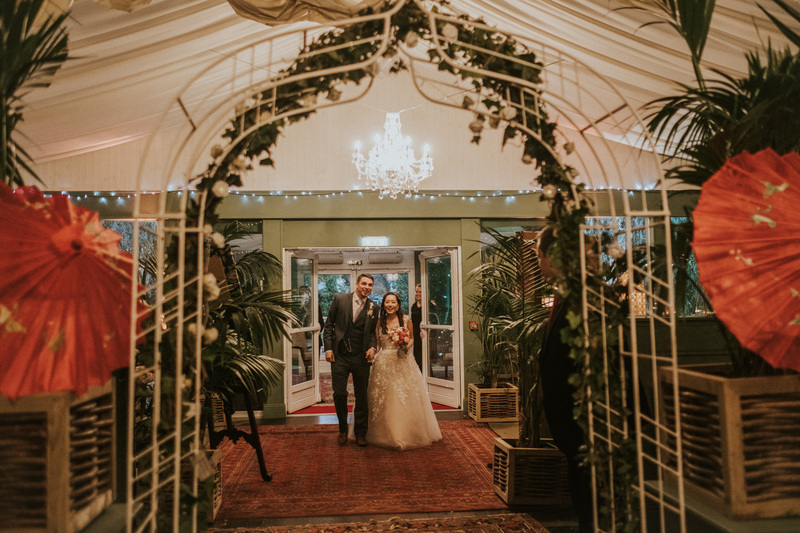 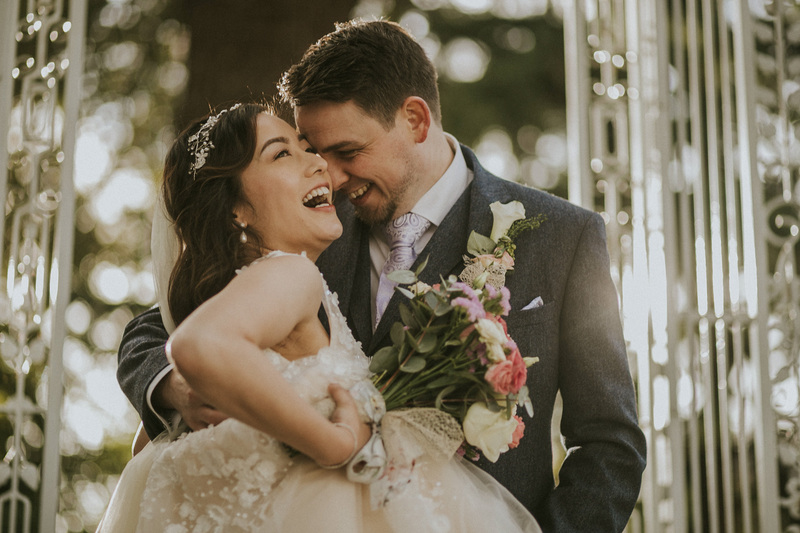 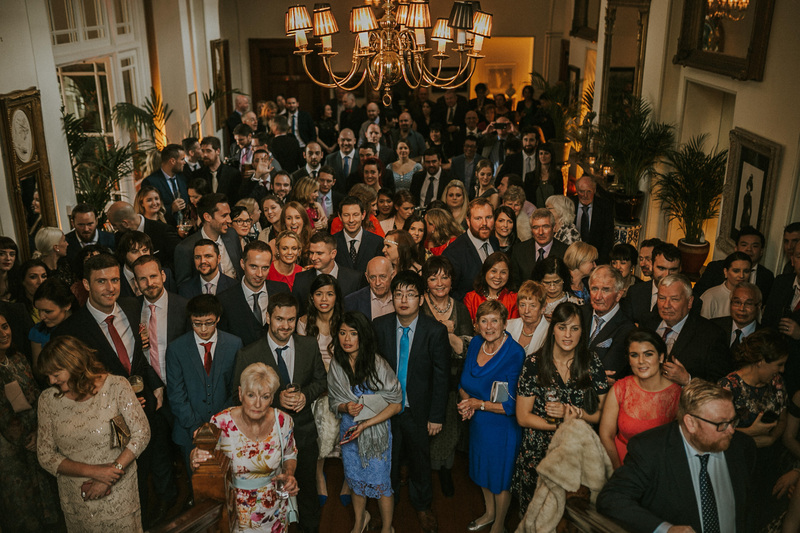 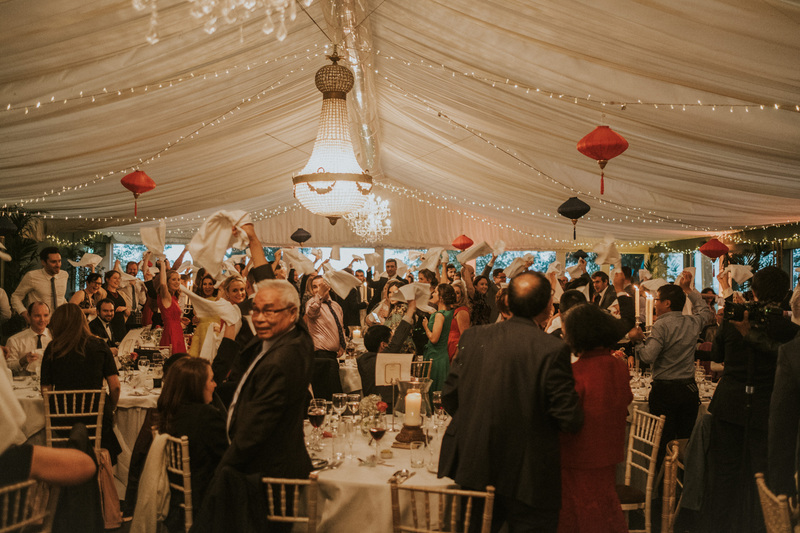 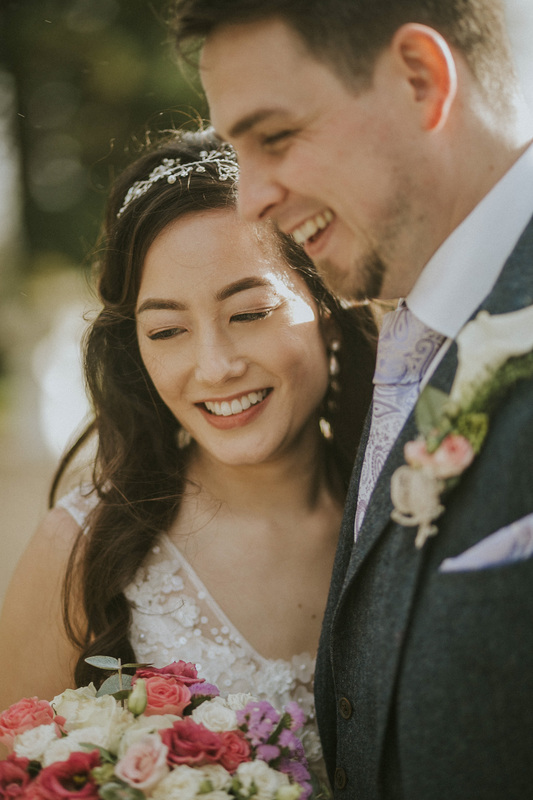 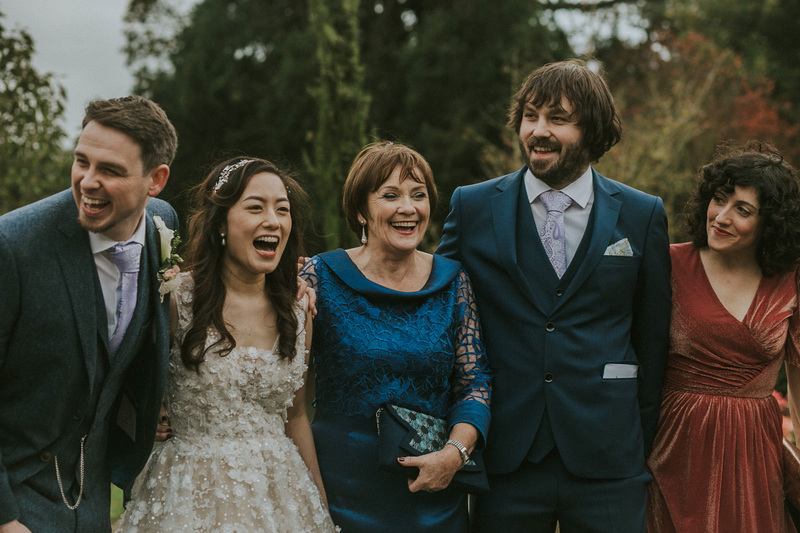 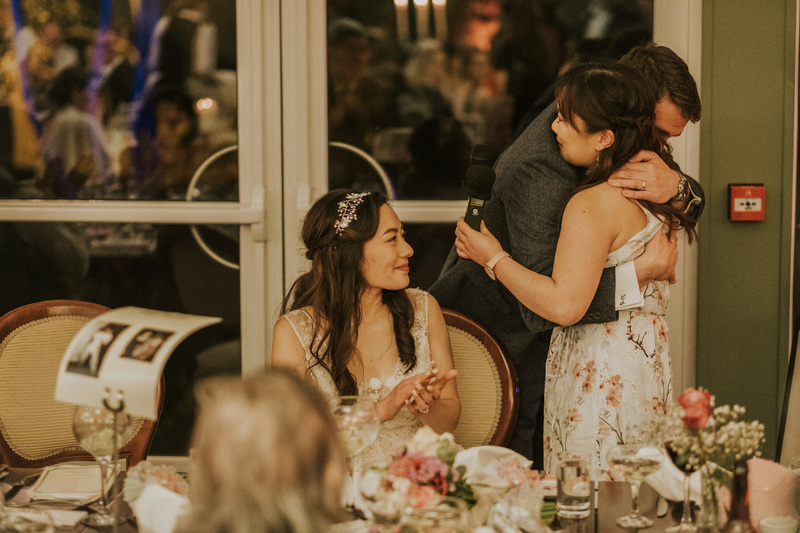 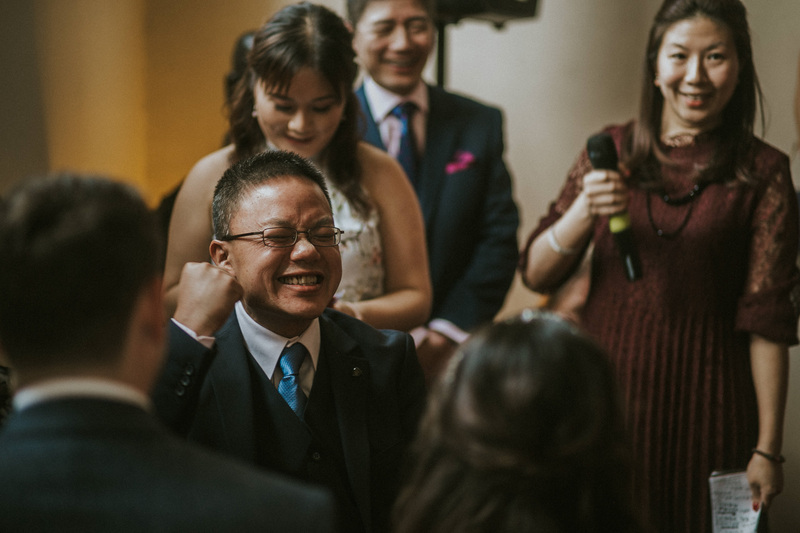 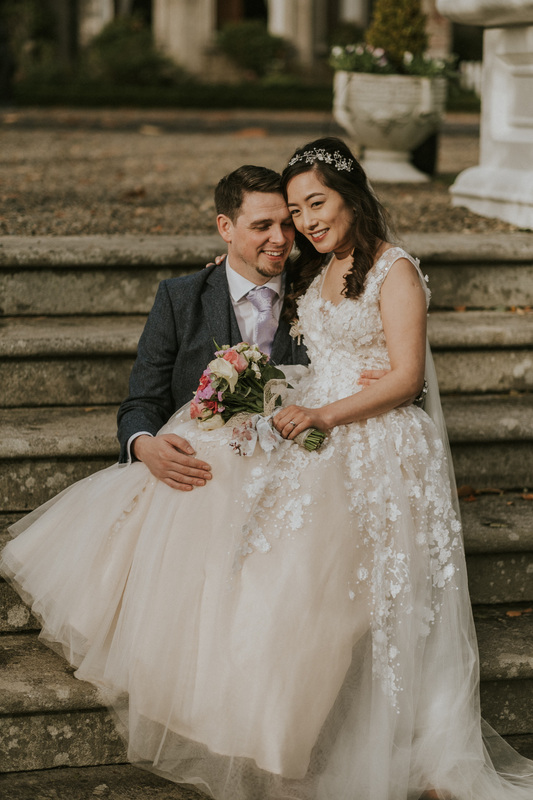 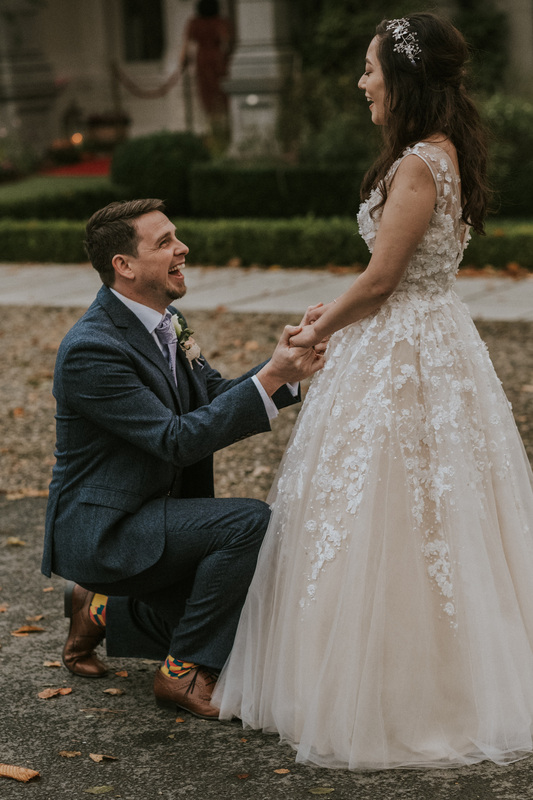 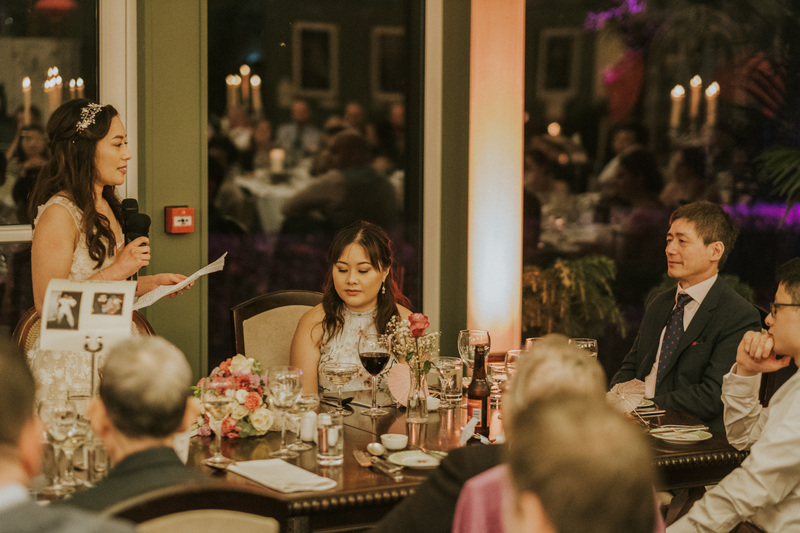 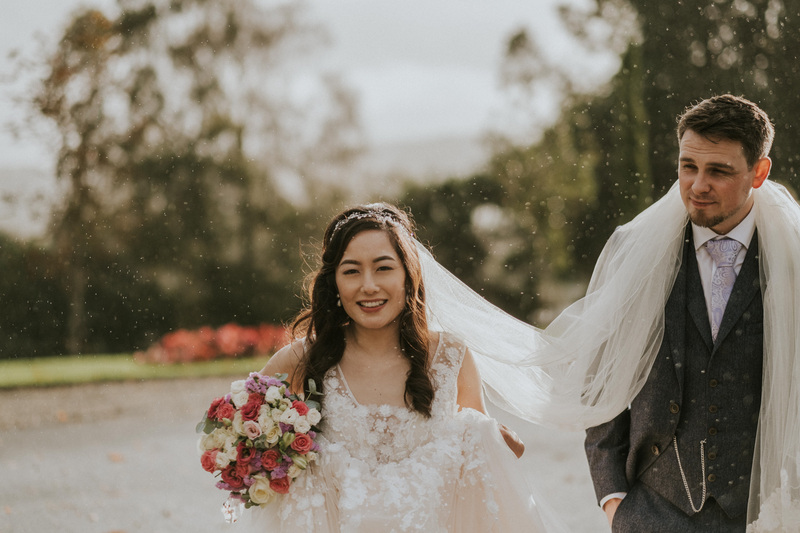 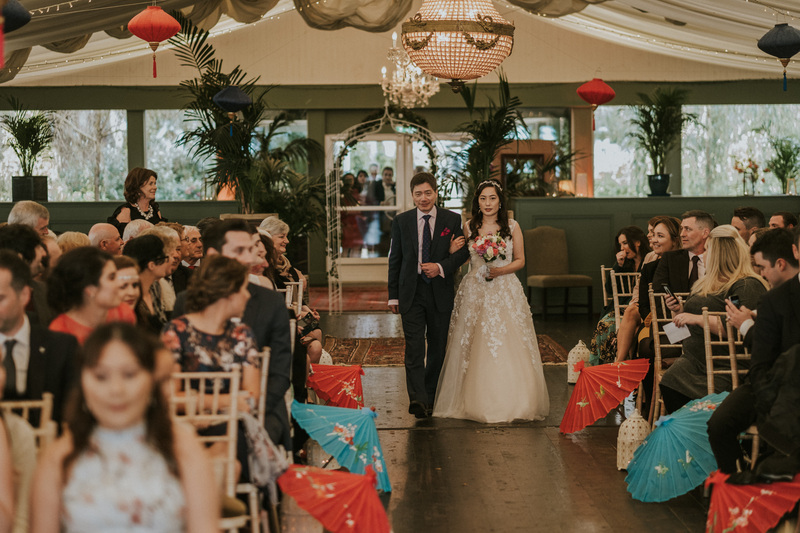 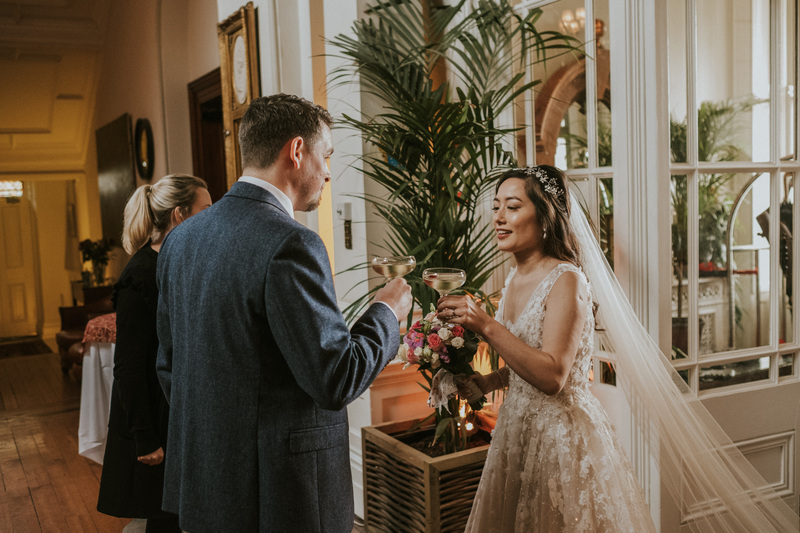 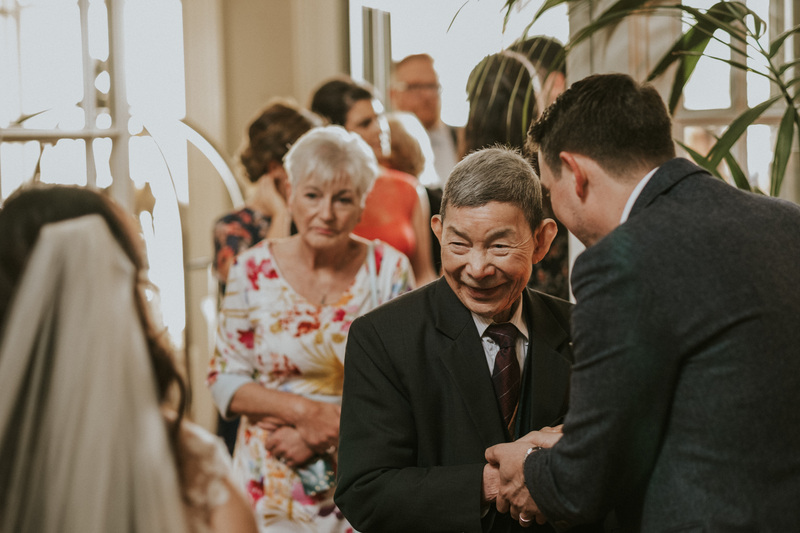 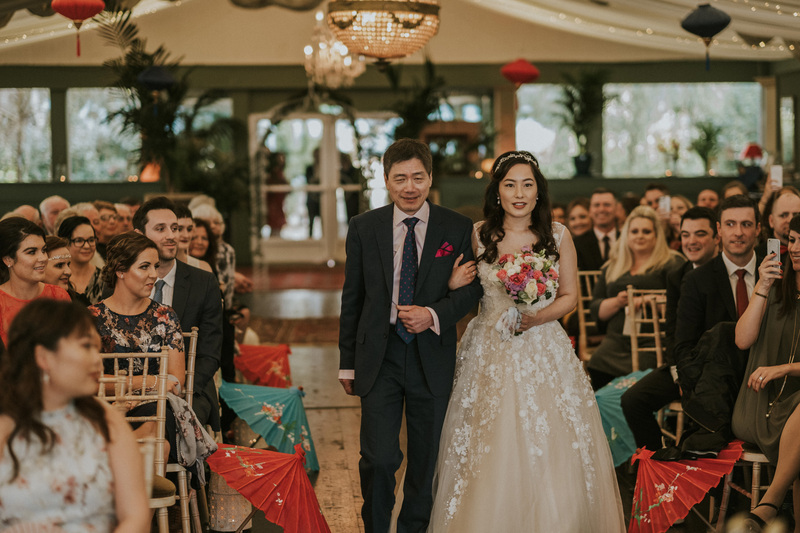 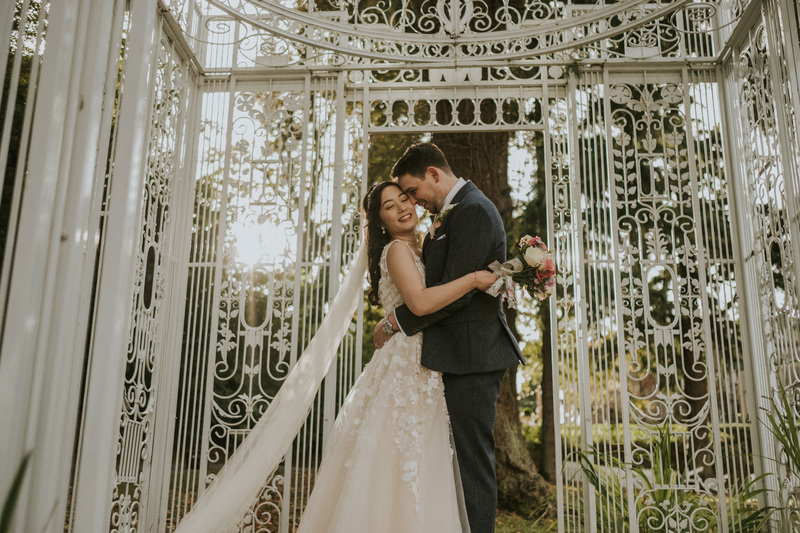 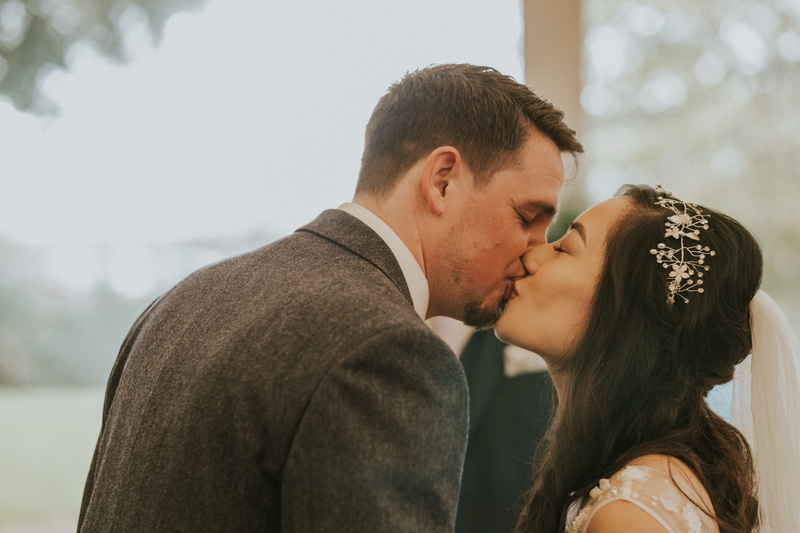 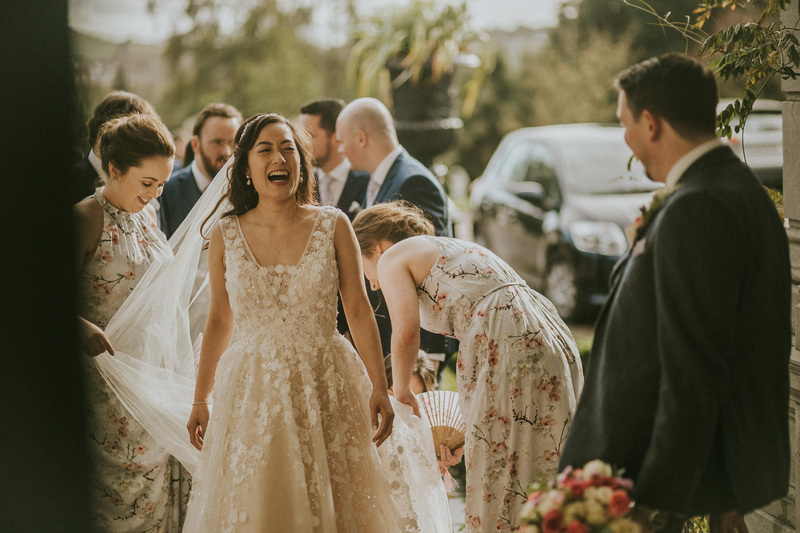 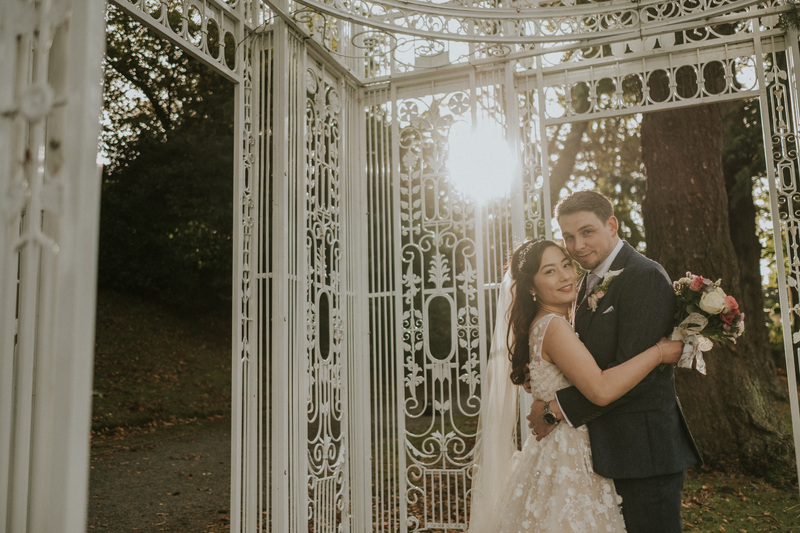 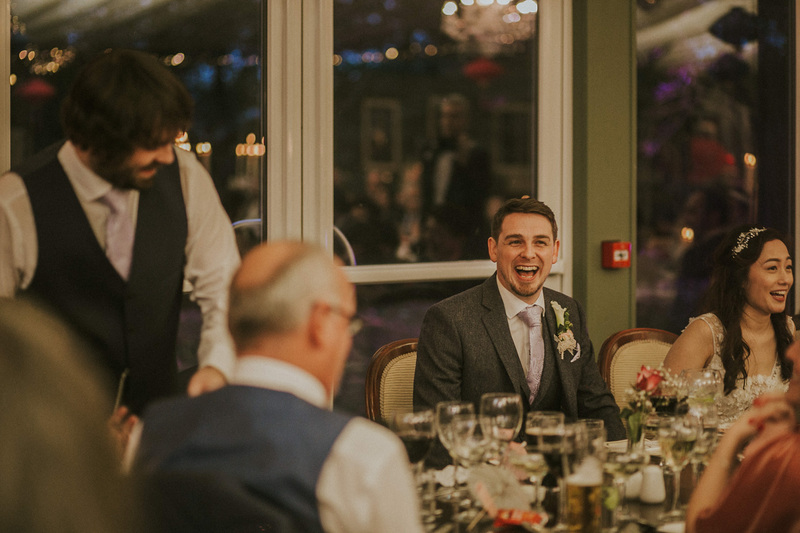 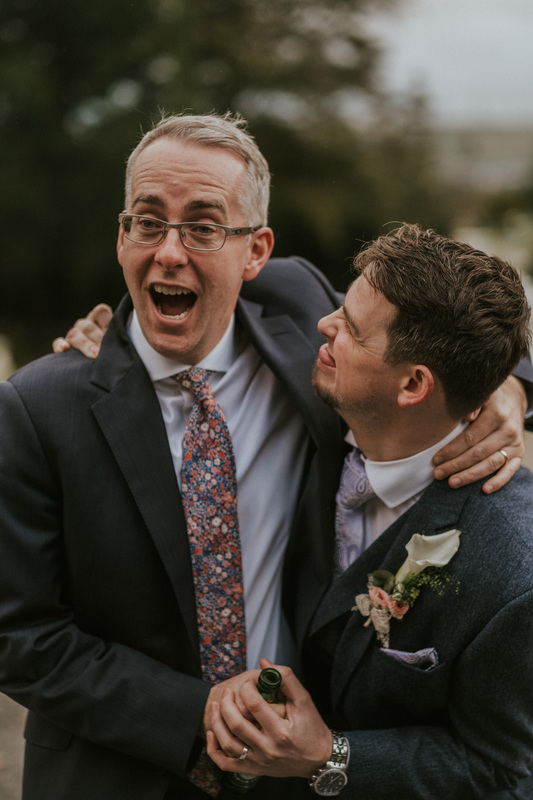 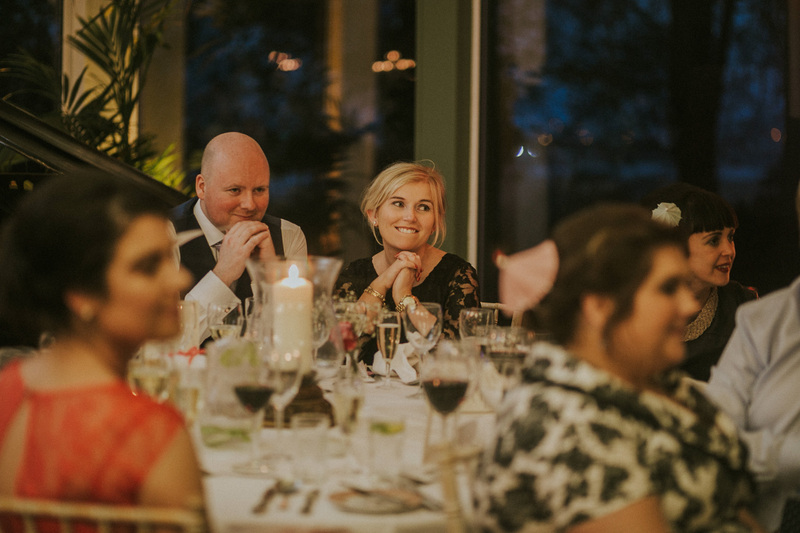 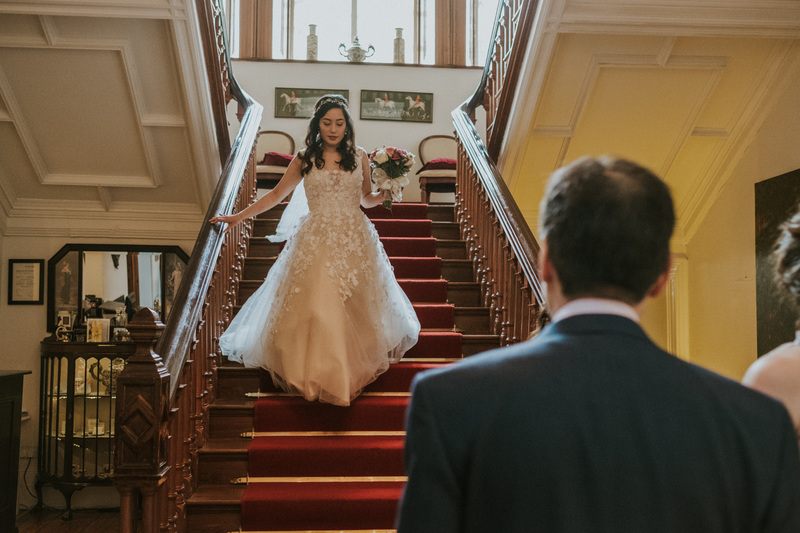 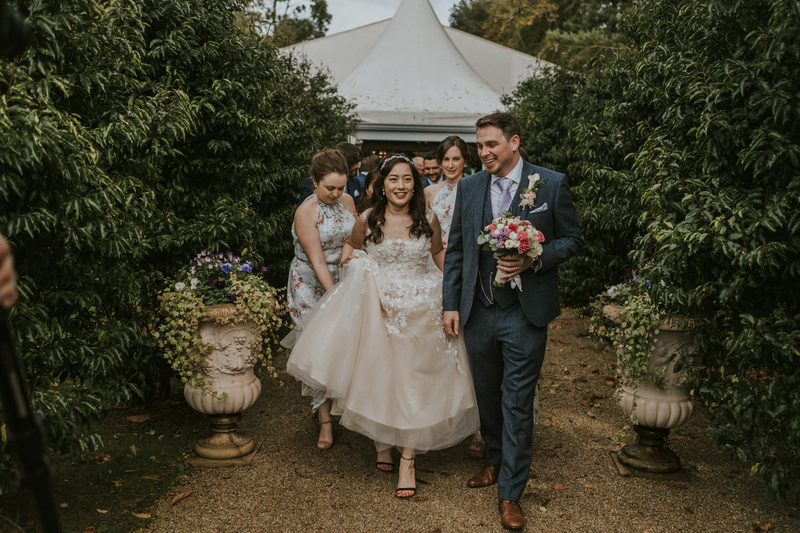 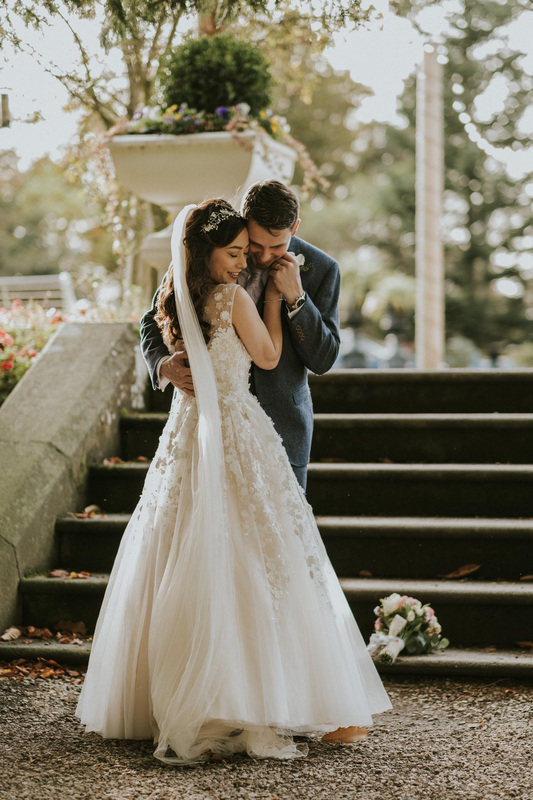 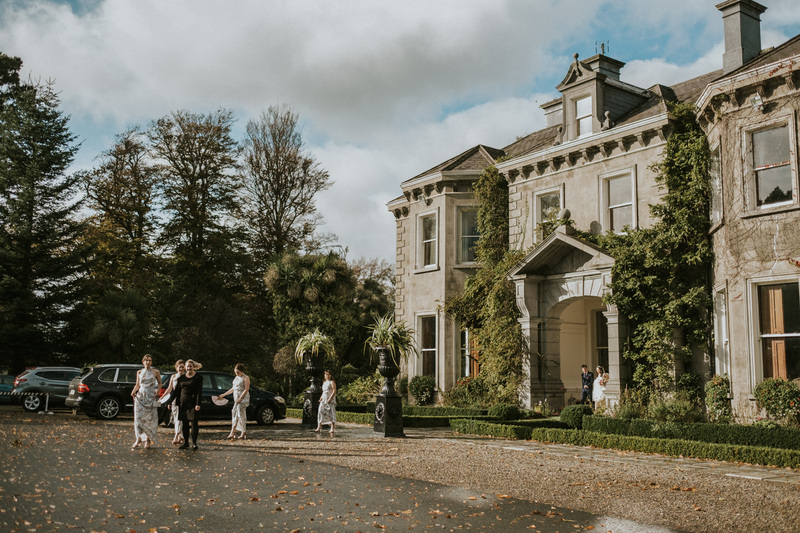 Bickay and Bazz’s China meets Ireland Tinakilly House Wedding was always going to be something special. 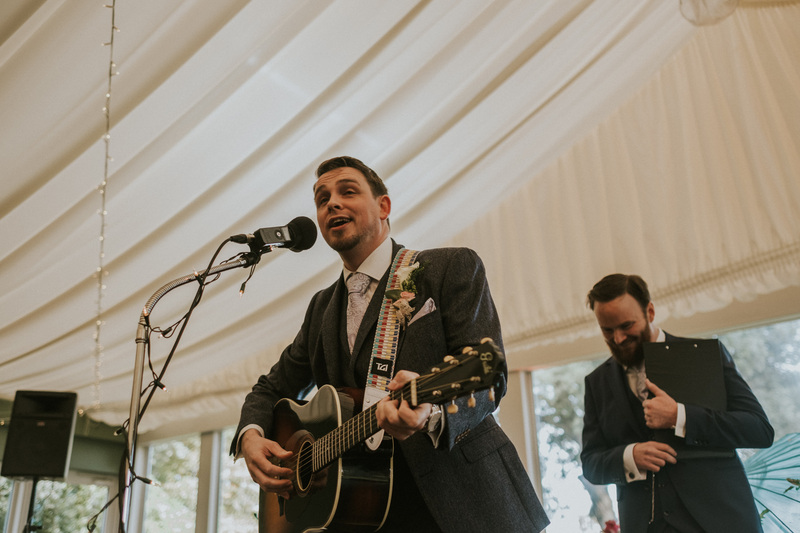 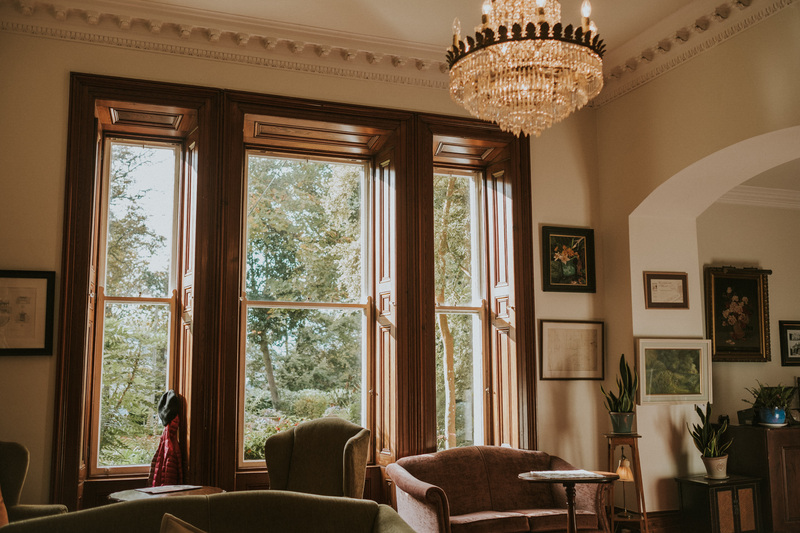 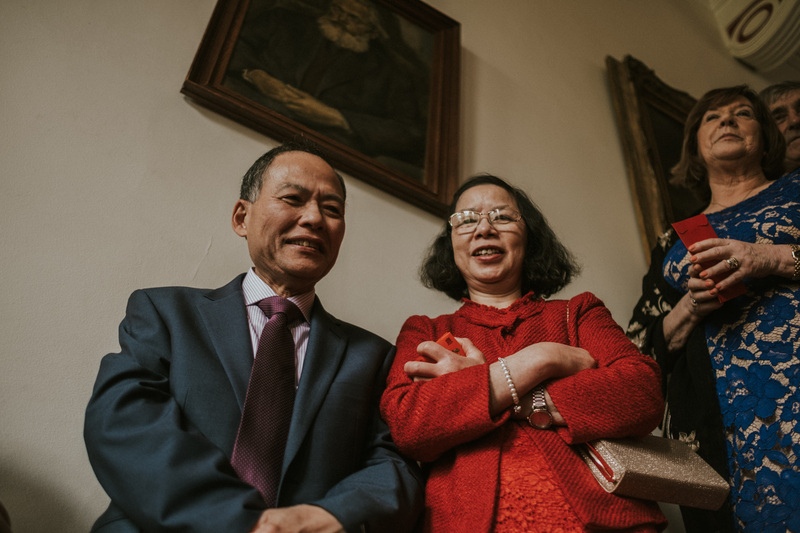 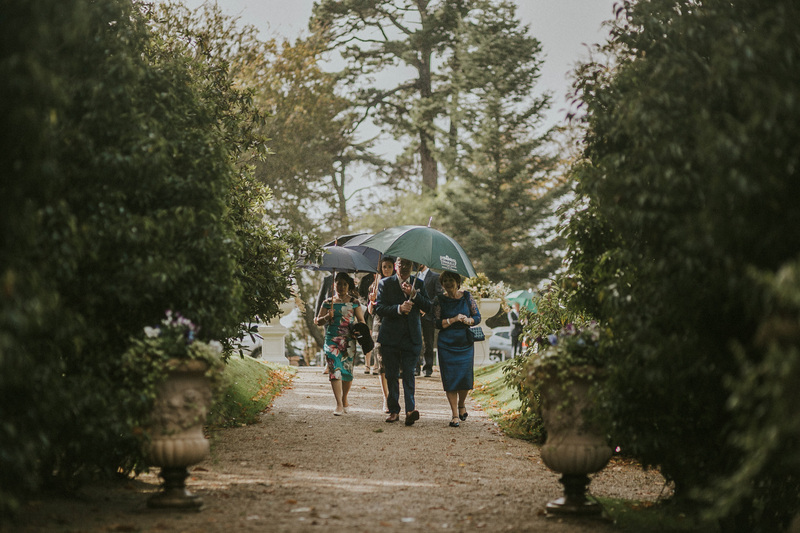 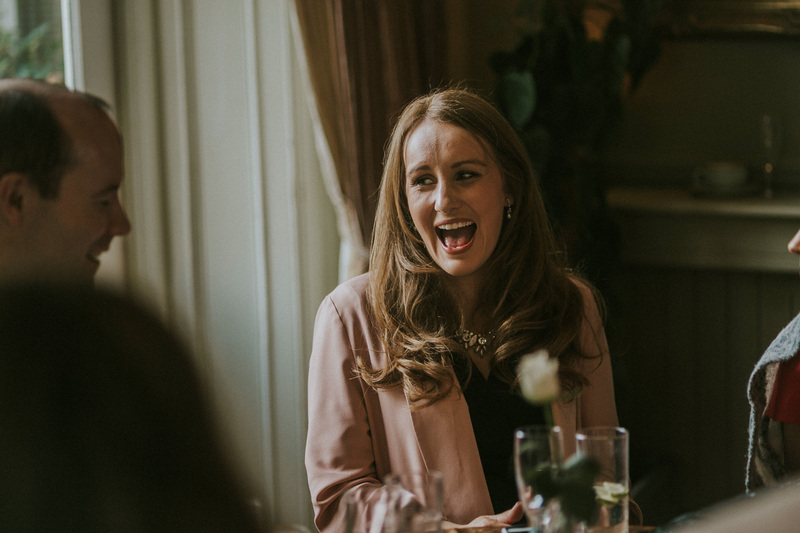 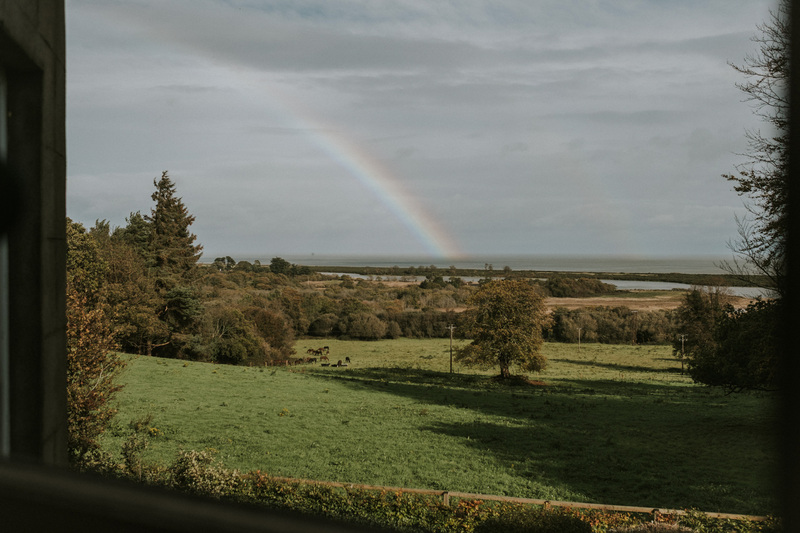 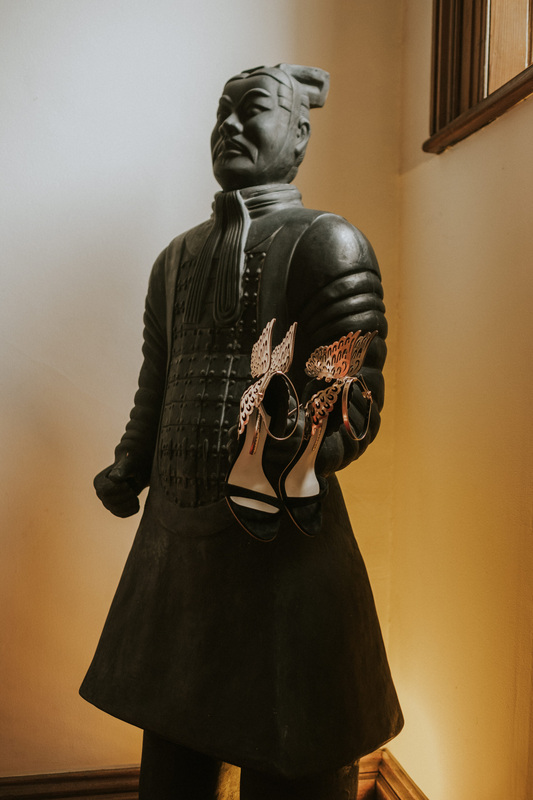 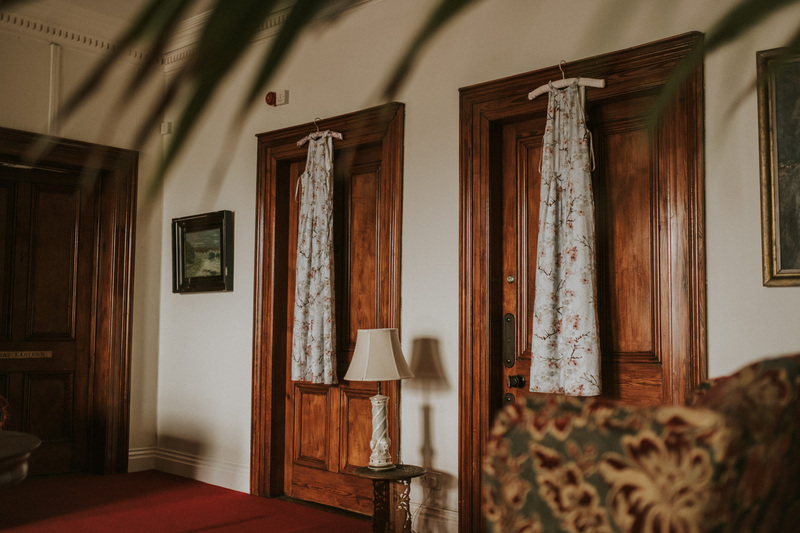 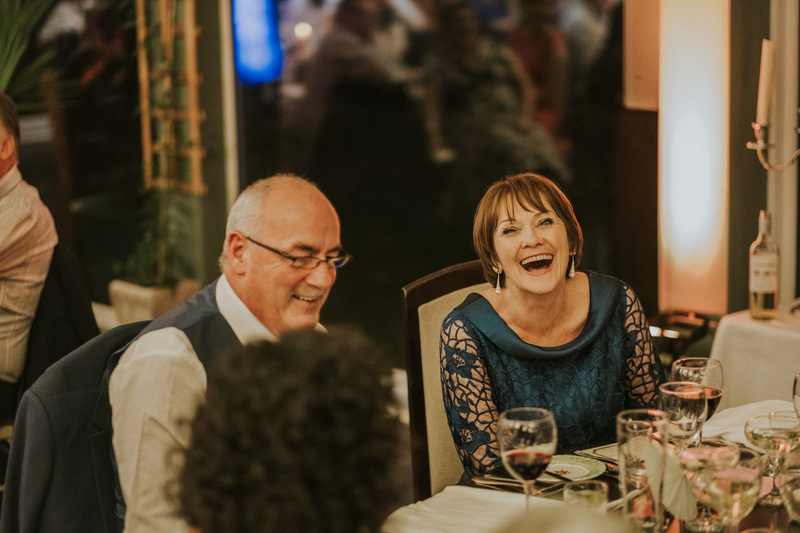 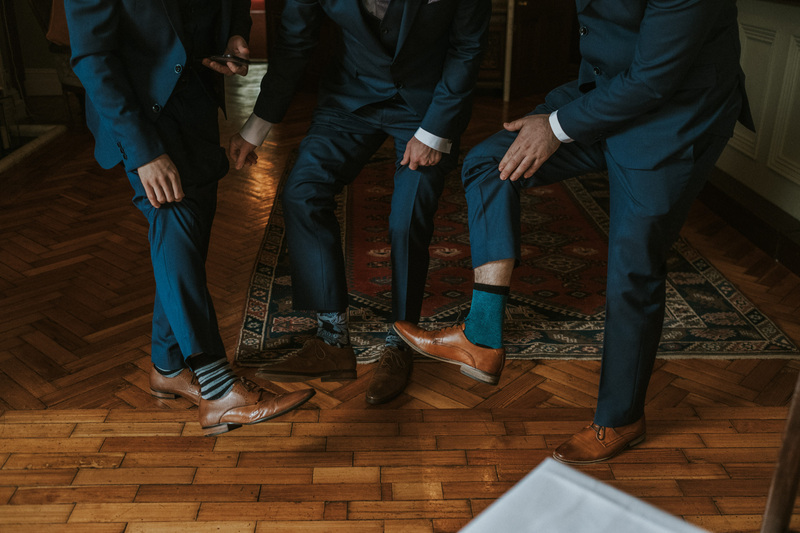 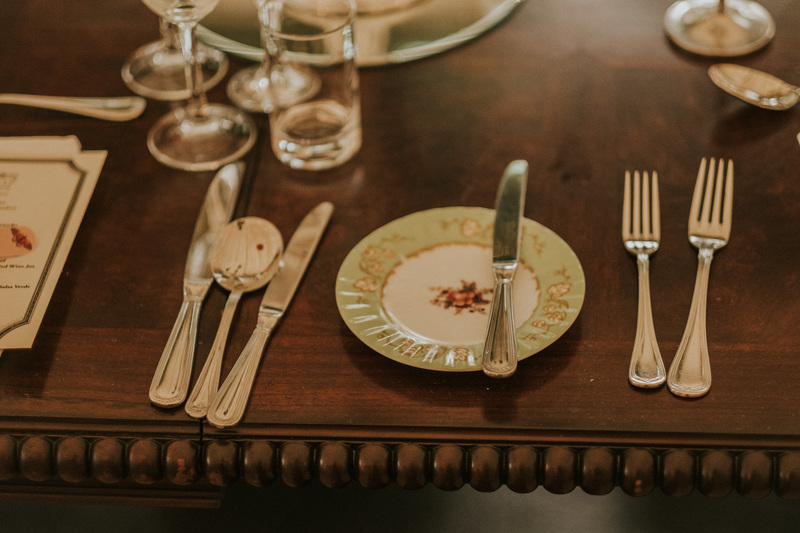 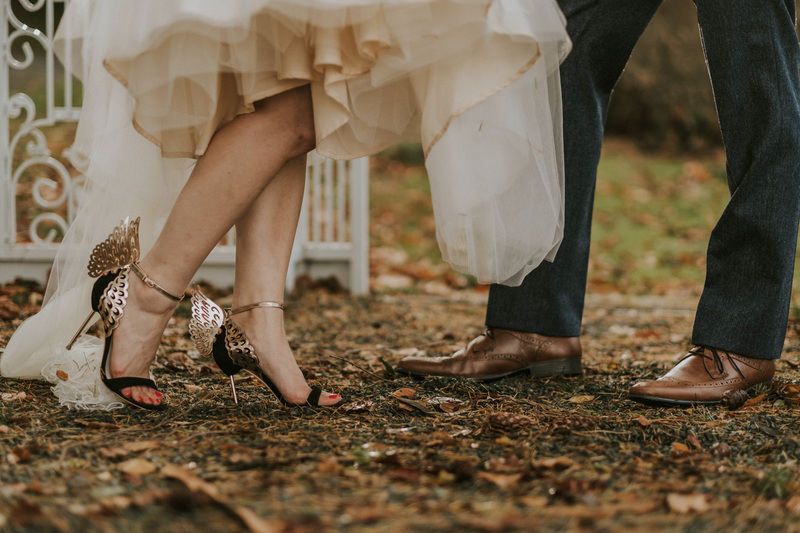 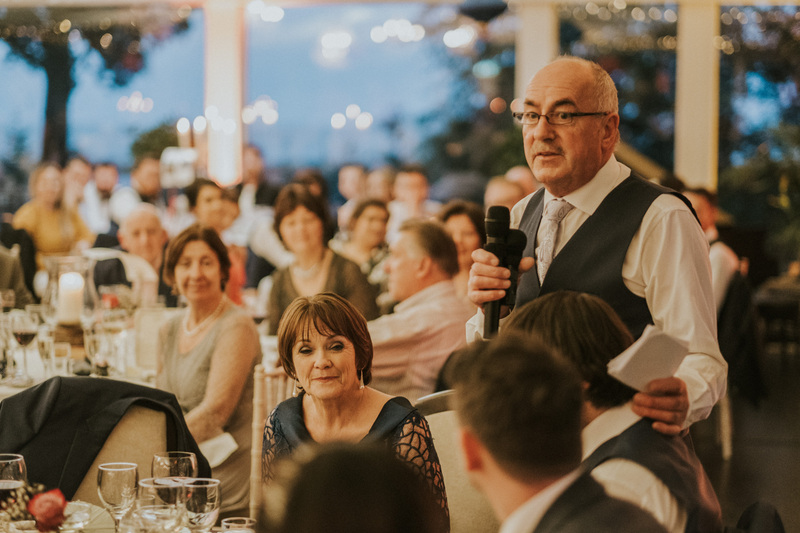 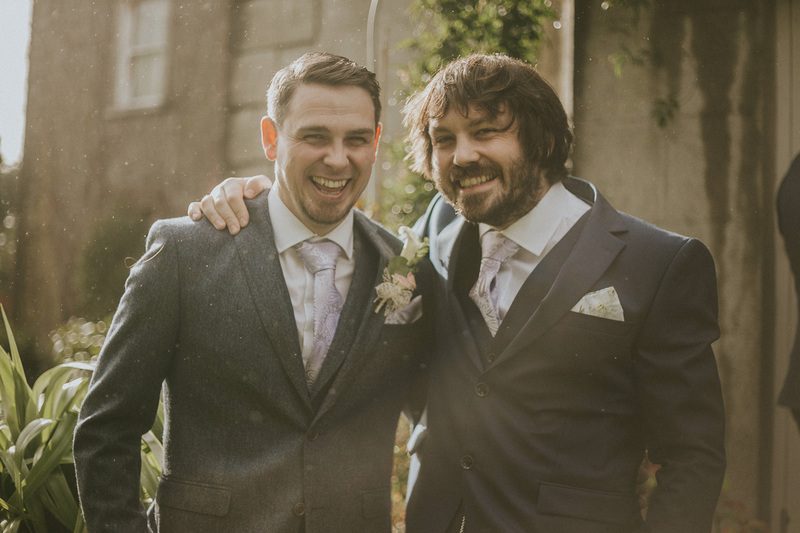 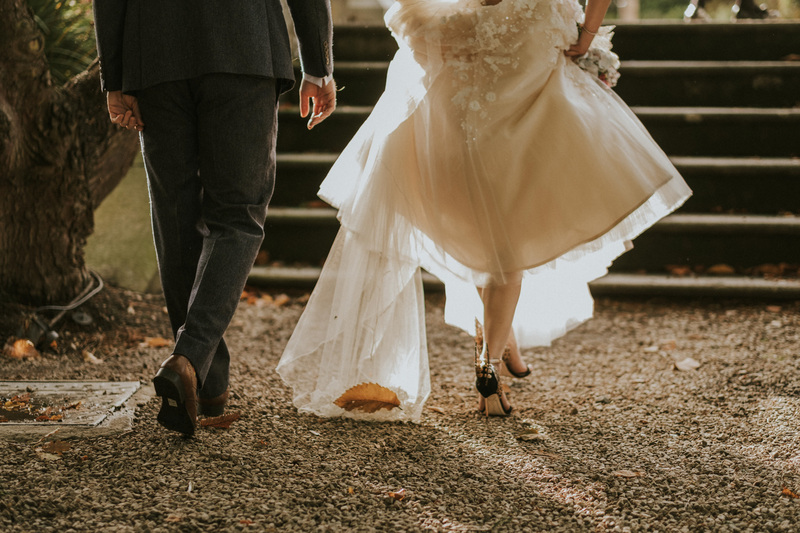 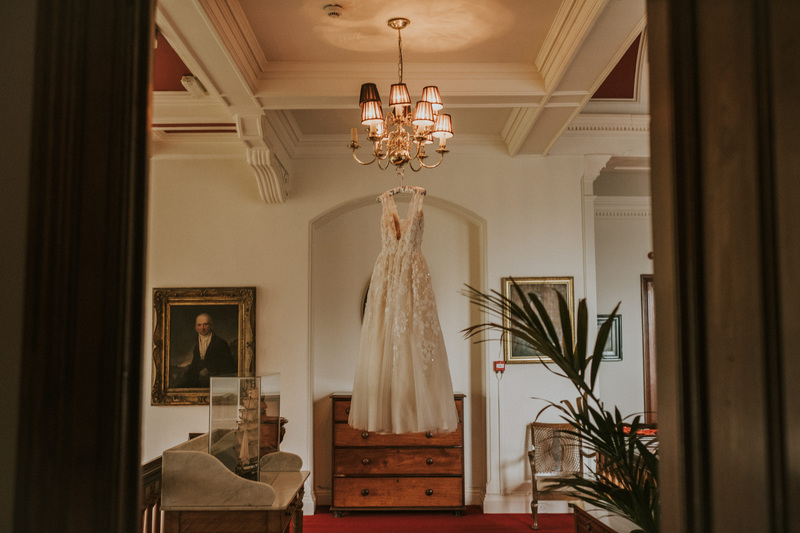 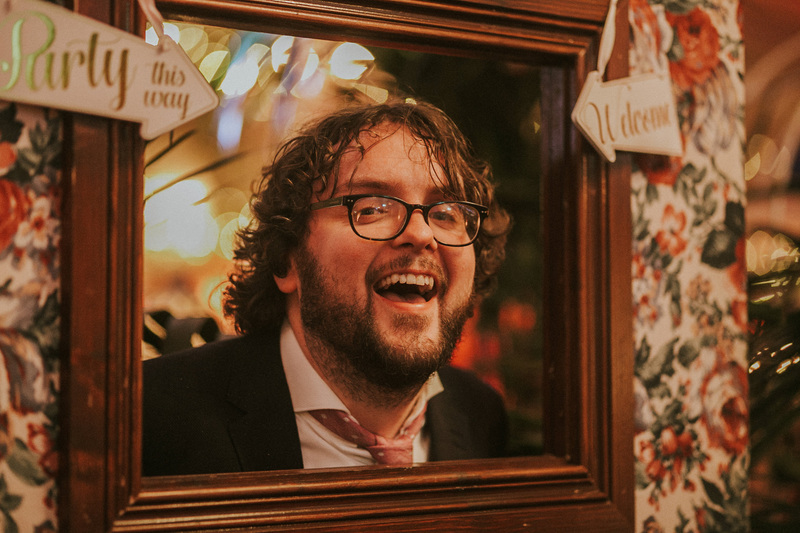 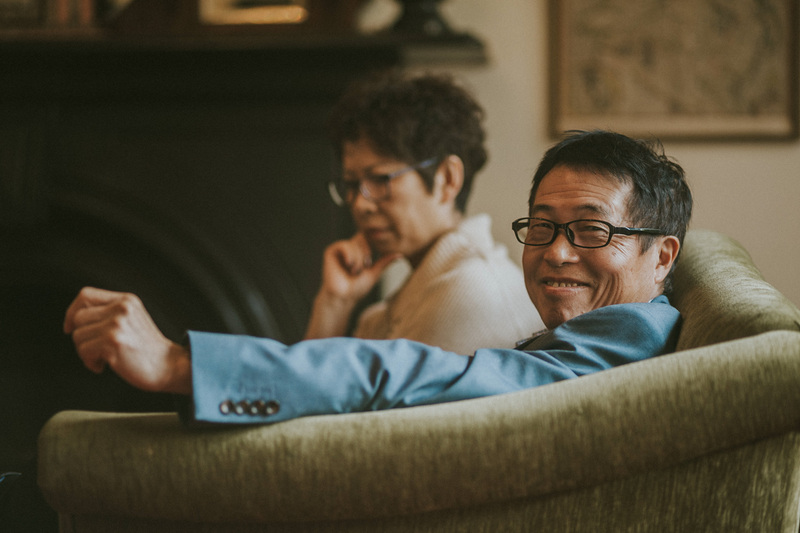 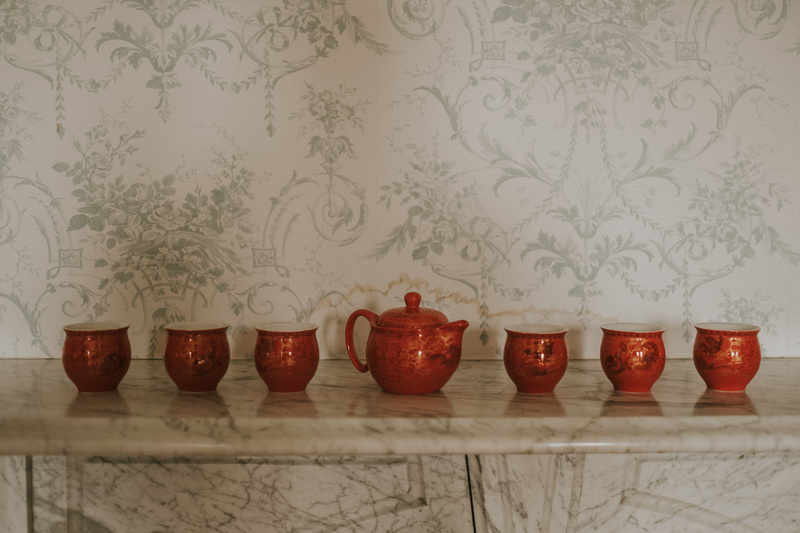 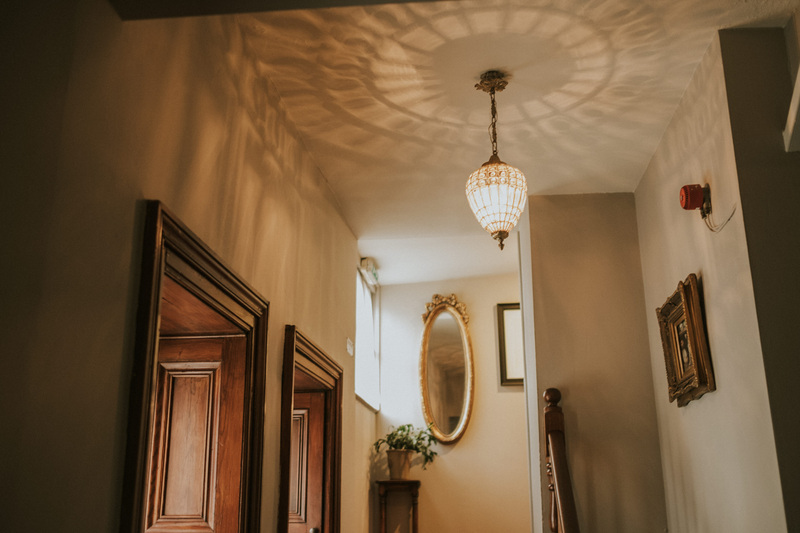 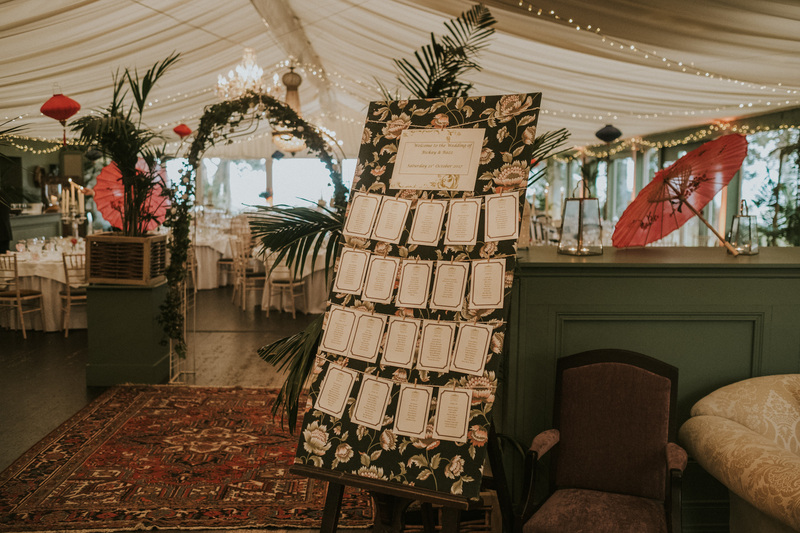 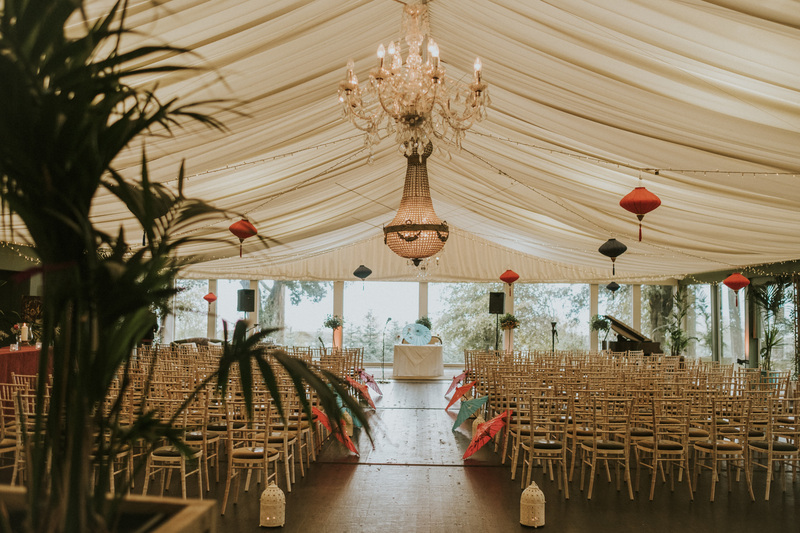 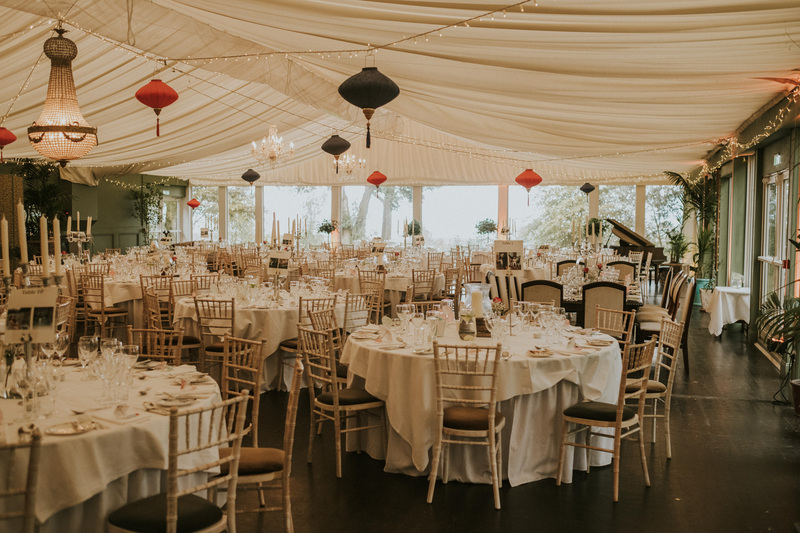 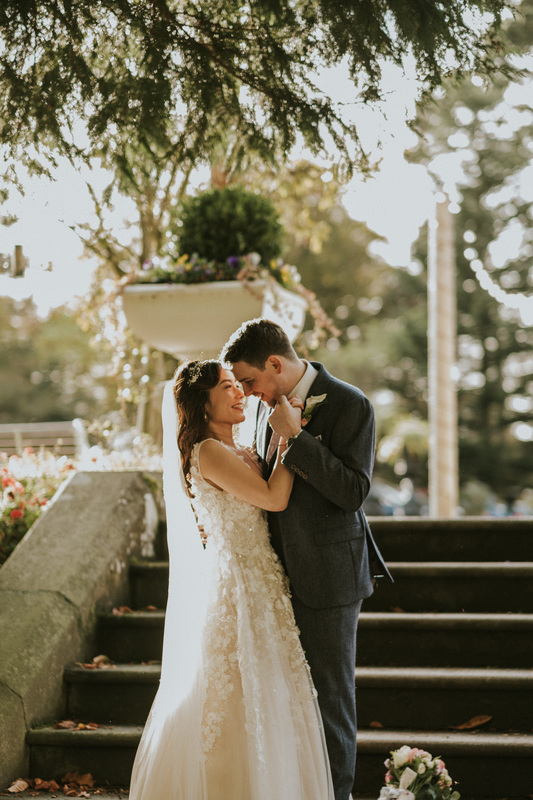 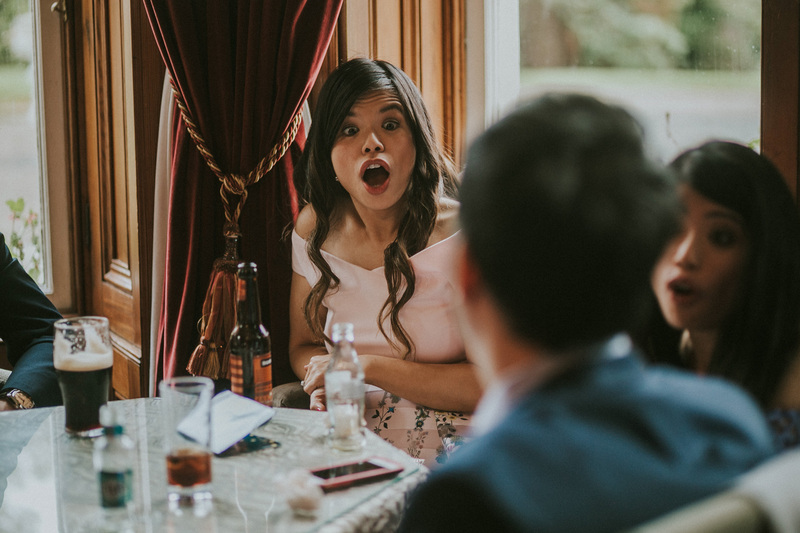 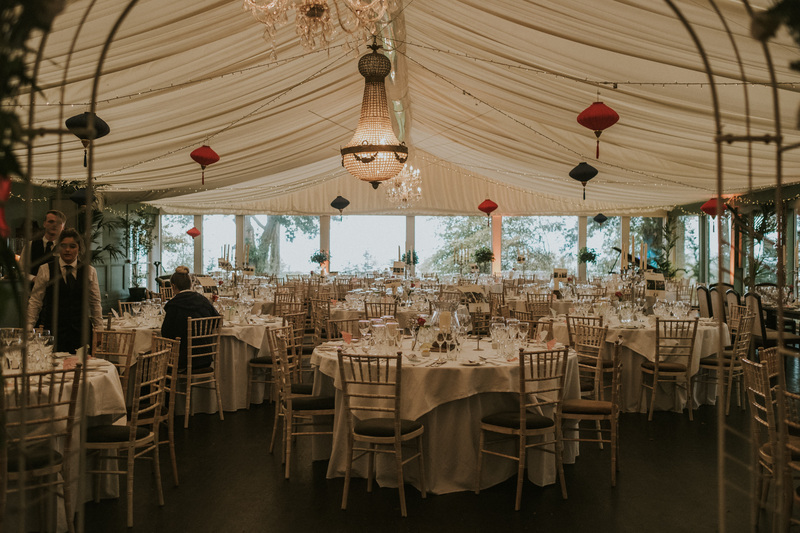 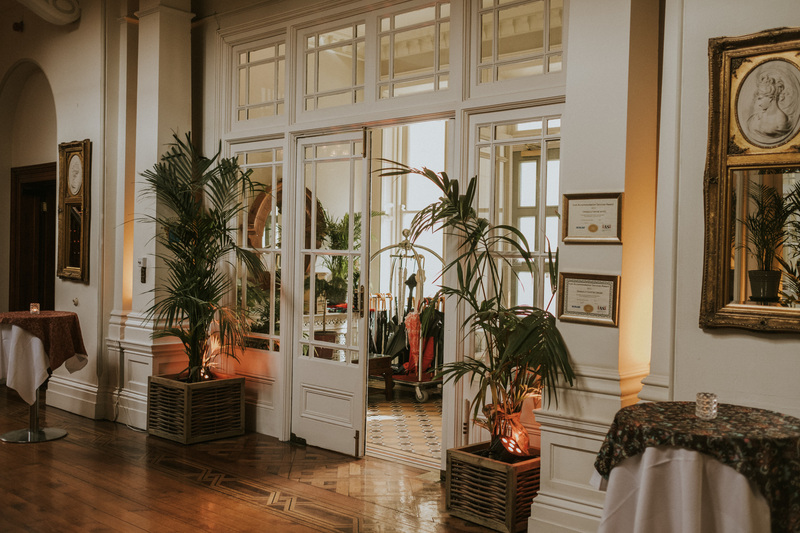 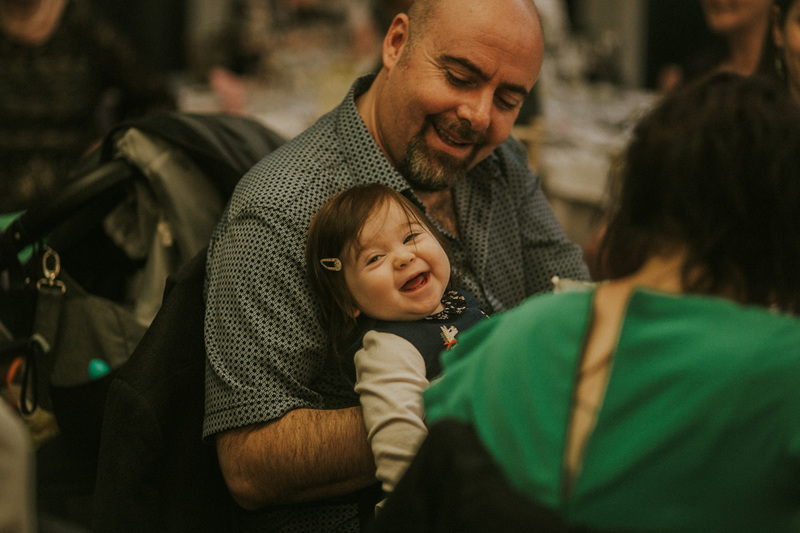 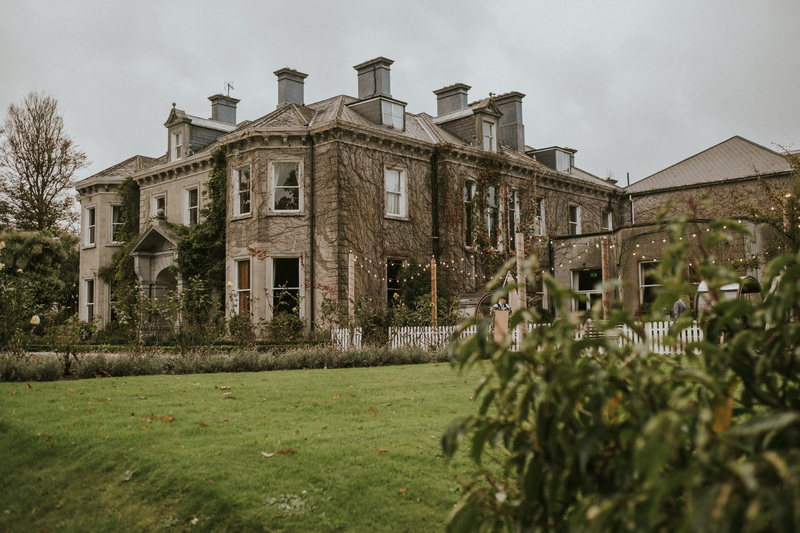 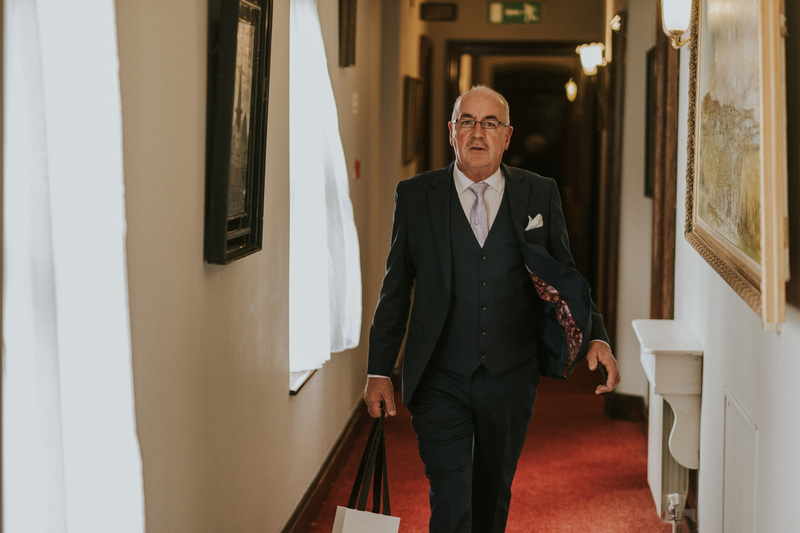 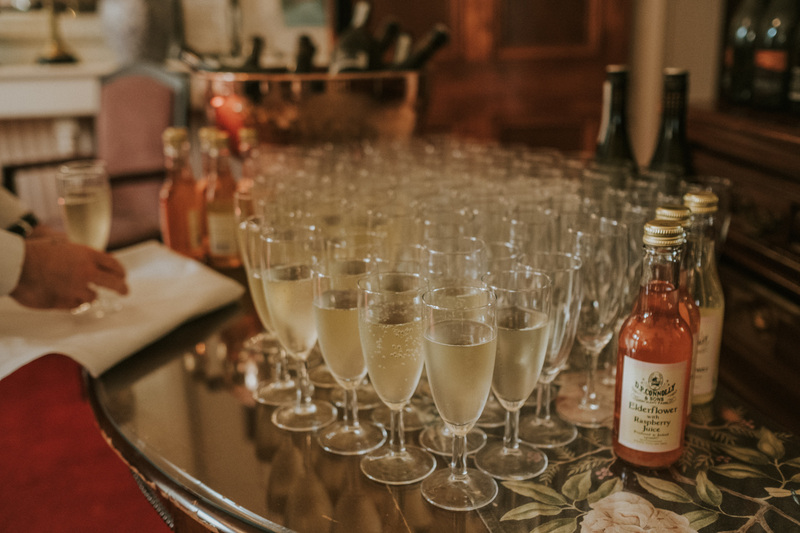 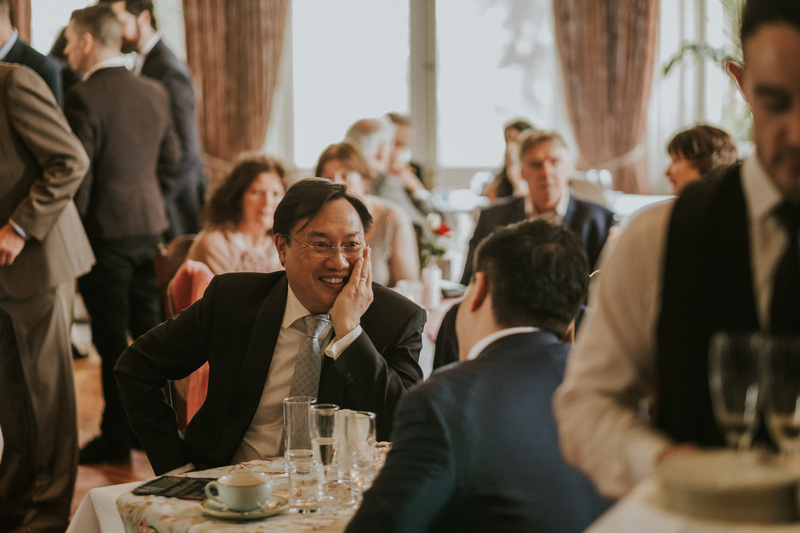 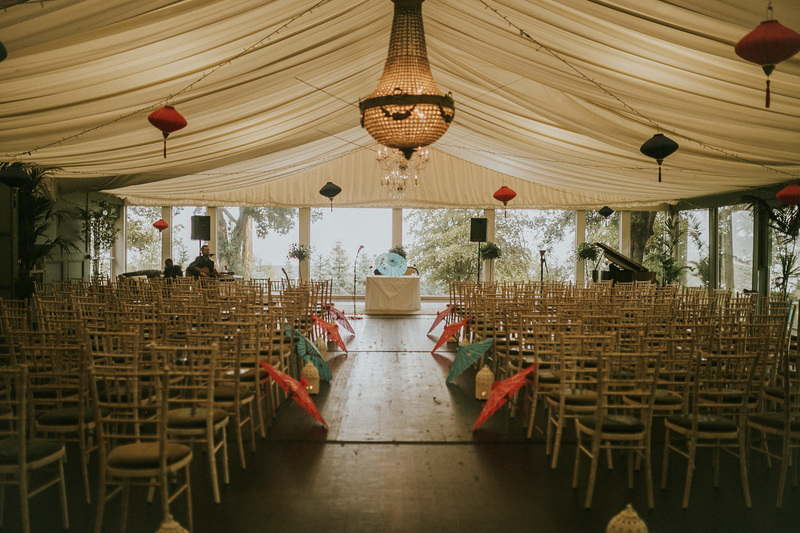 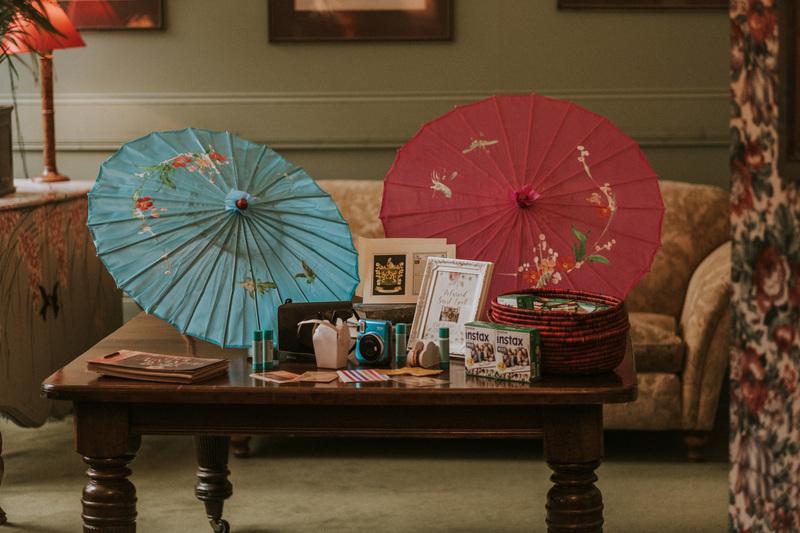 The merging of two cultures, in a Victorian Mansion by the sea, combined with Bicky and Bazz’s wonderful lighthearted nature, Bickay’s fantastic shoes, live music, Irish banter, and Chinese tea ceremonies and you’re destined for a fantastic day. 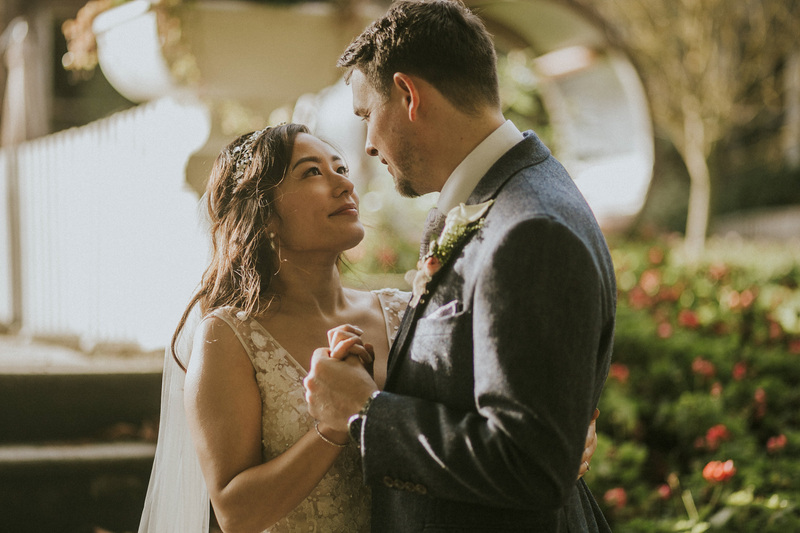 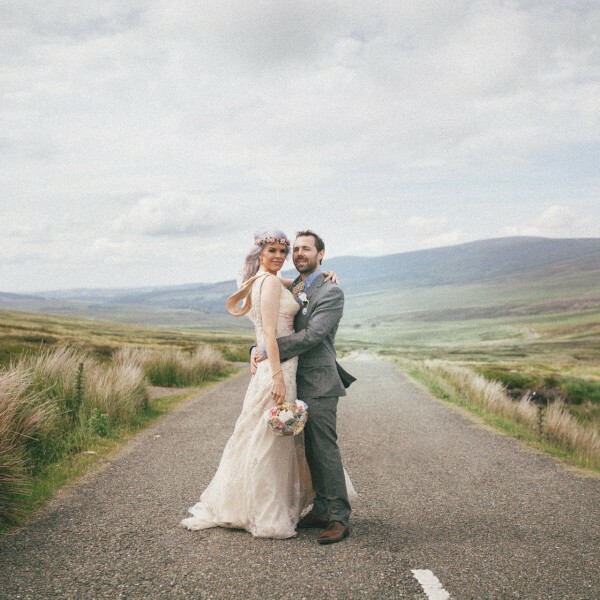 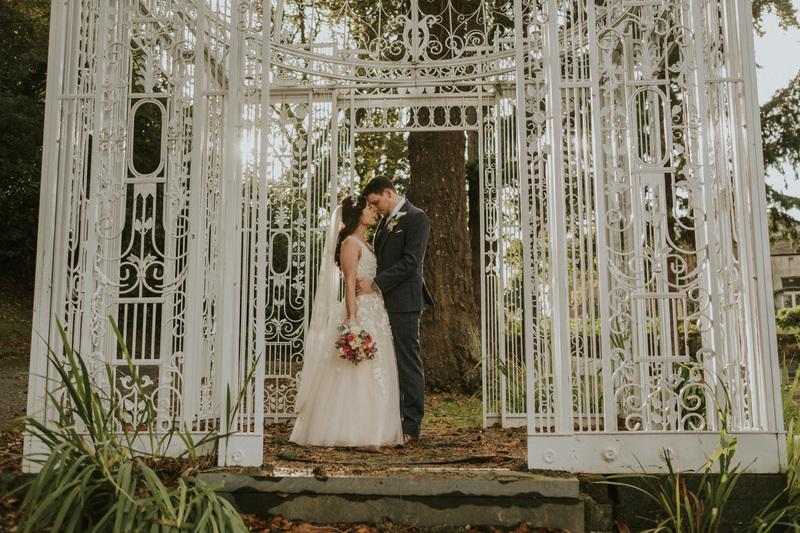 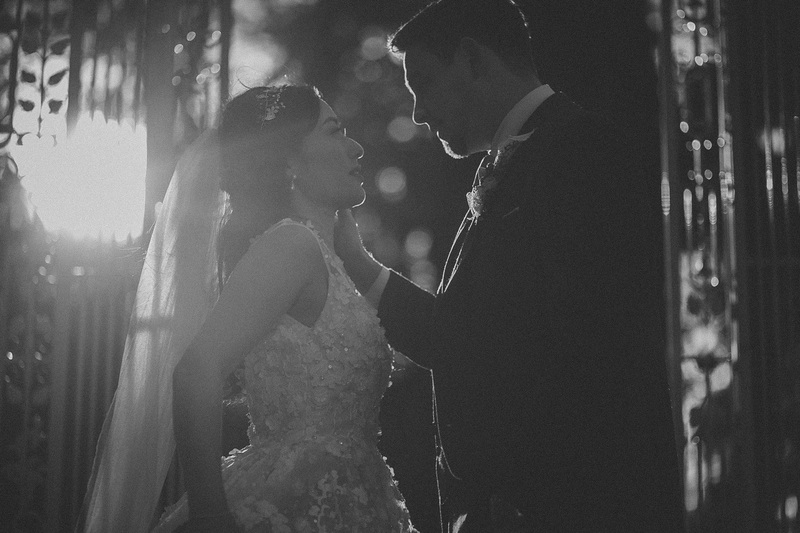 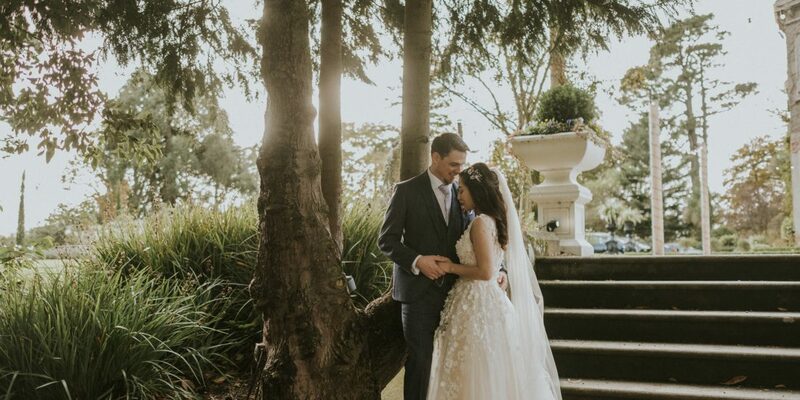 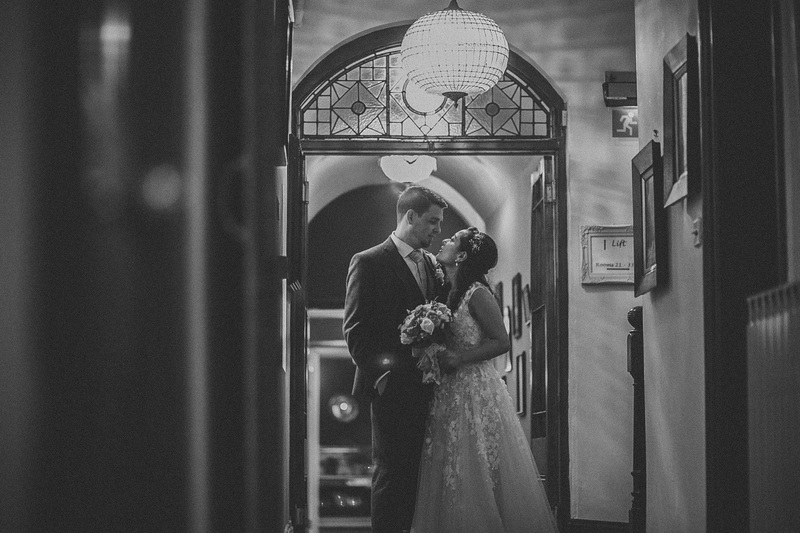 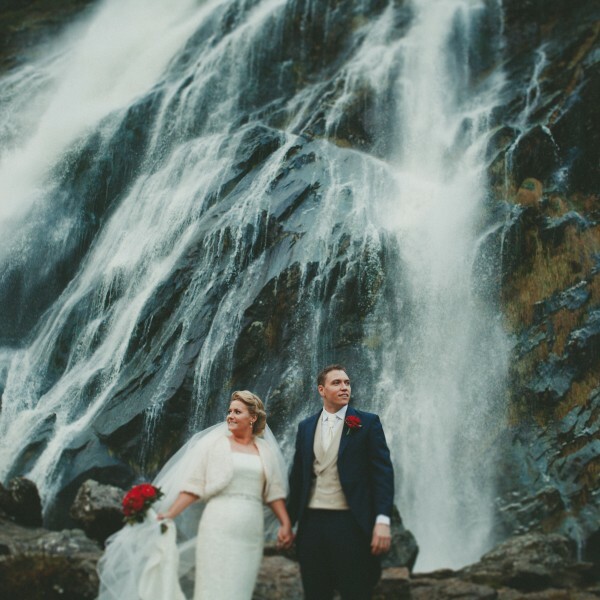 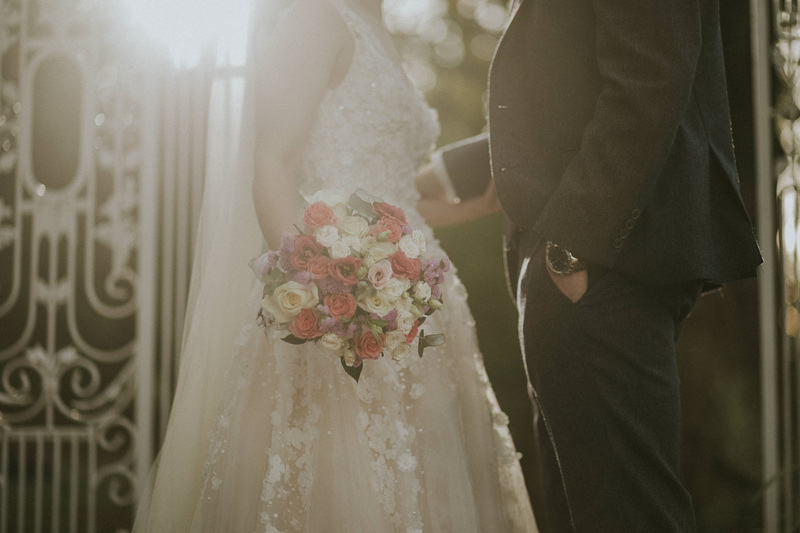 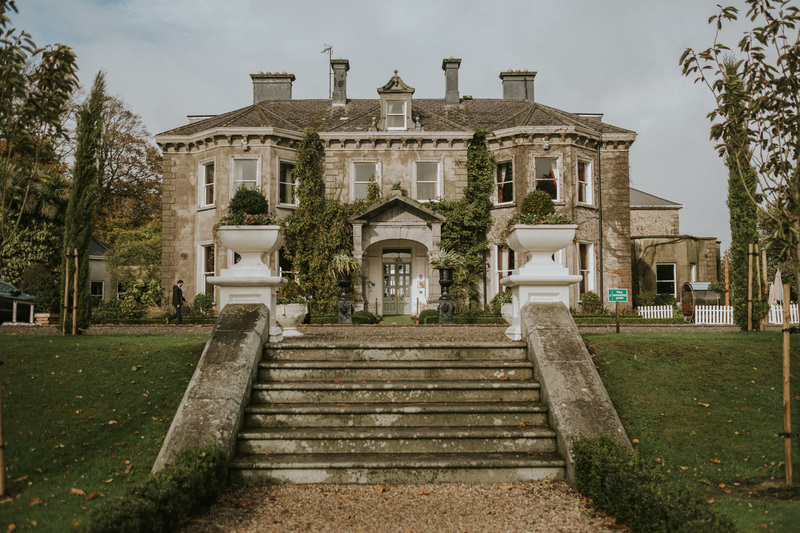 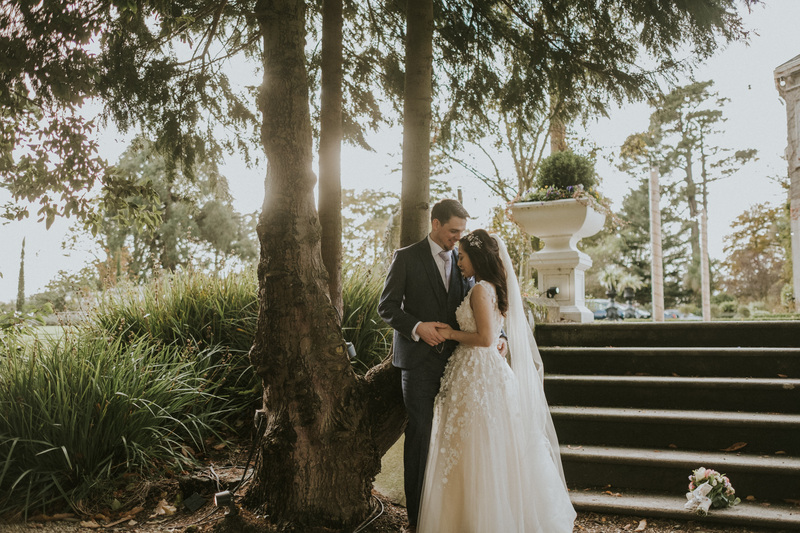 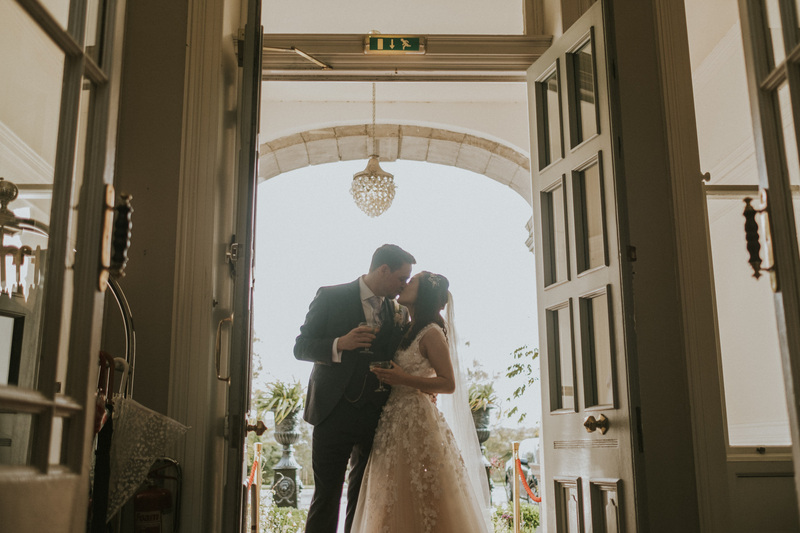 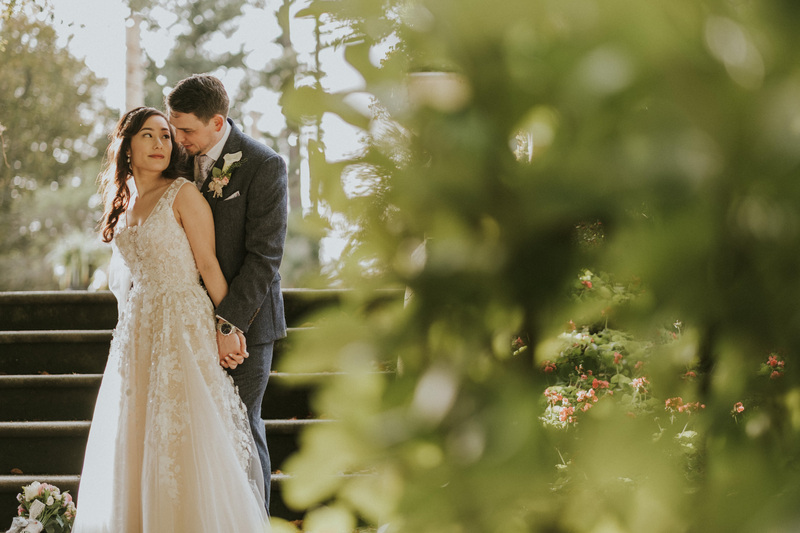 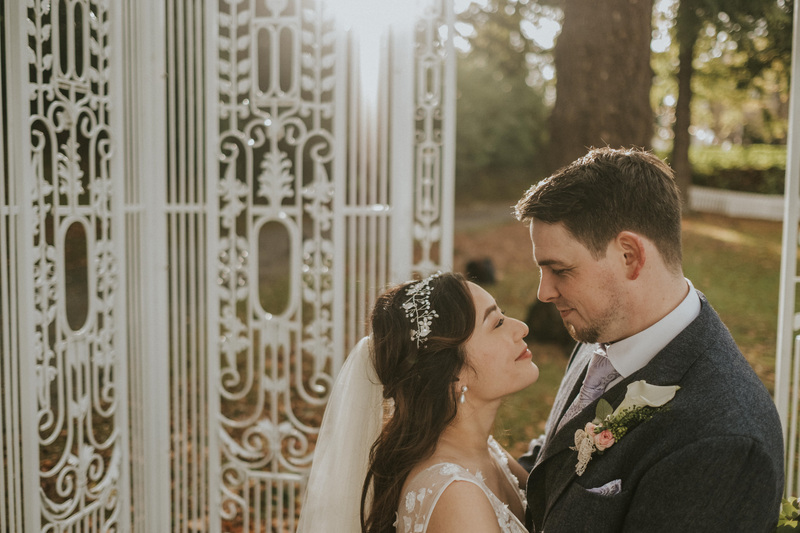 Tinakilly House made a beautiful venue for this Wedding from start to finish. 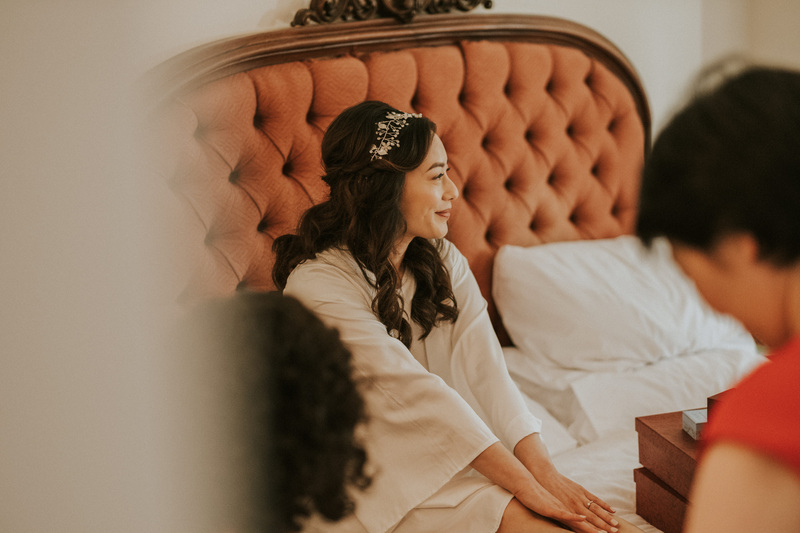 Bickay and her bridesmaids began morning preparations in Tinakilly’s bridal suite. 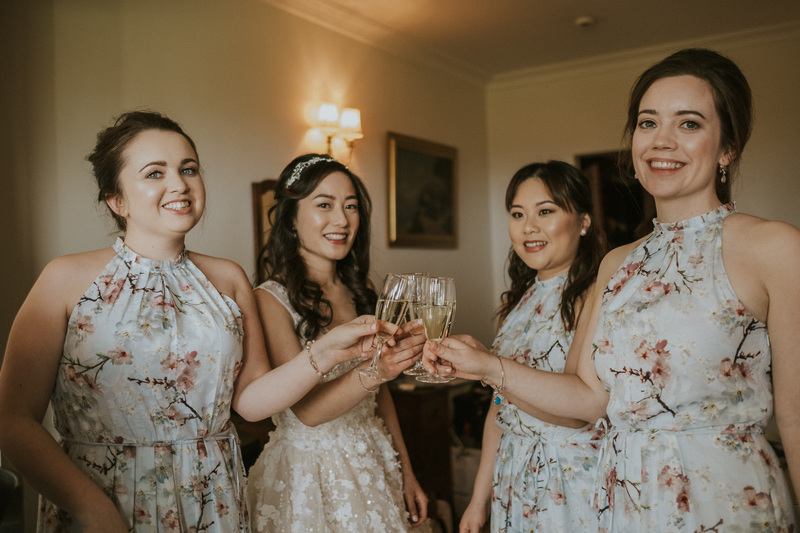 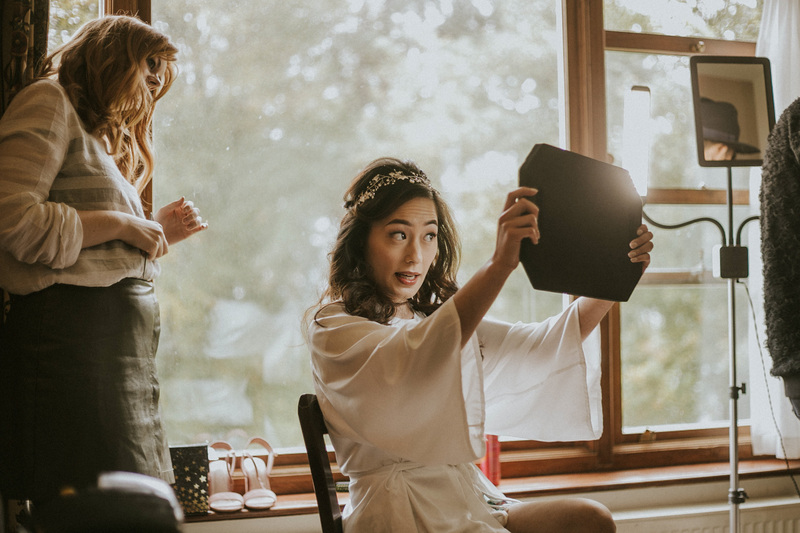 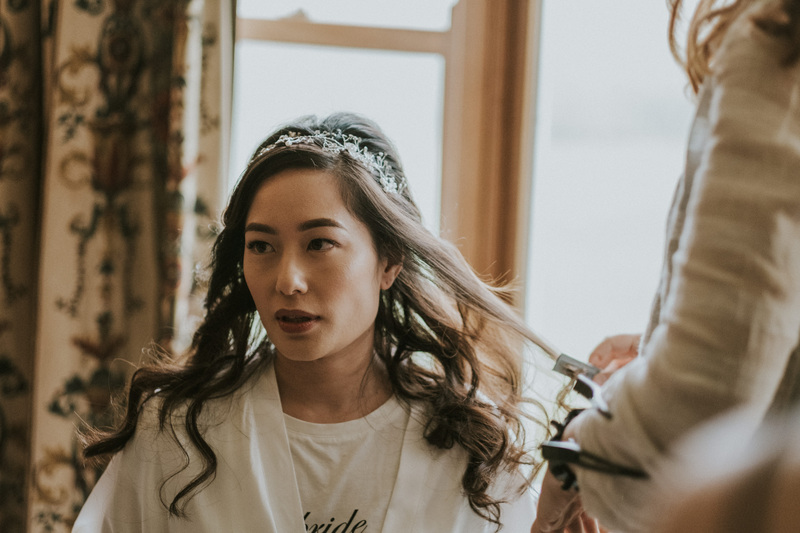 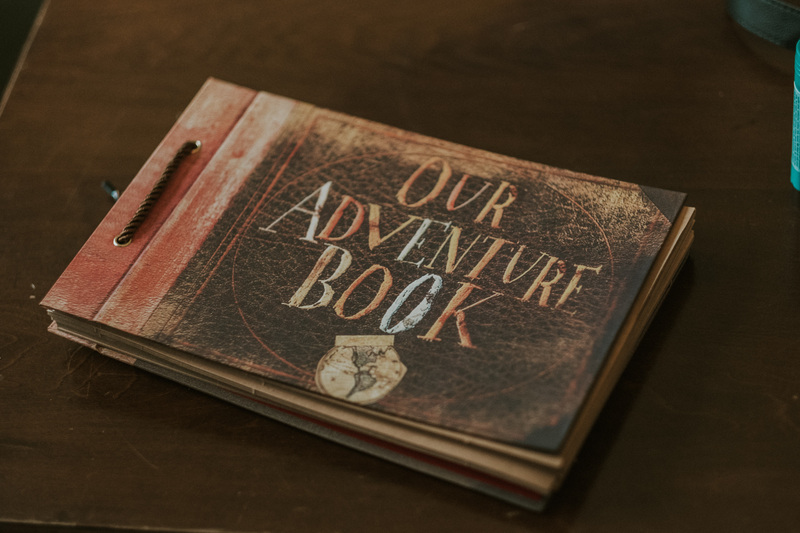 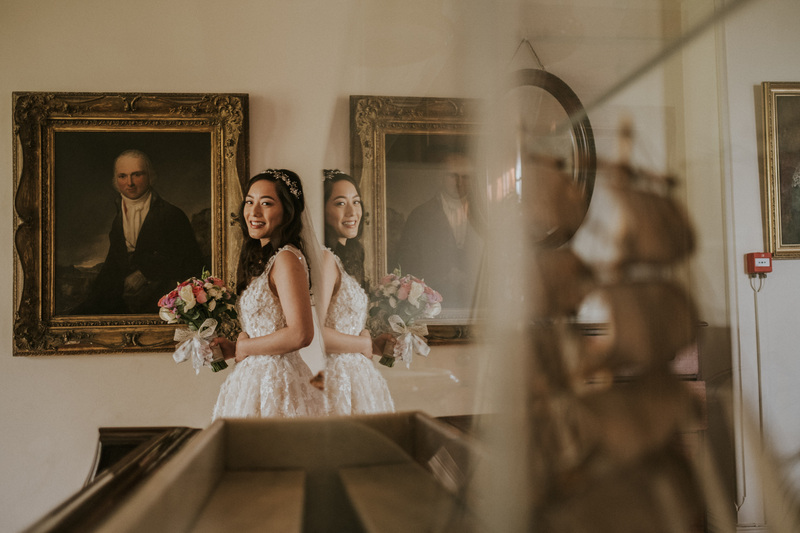 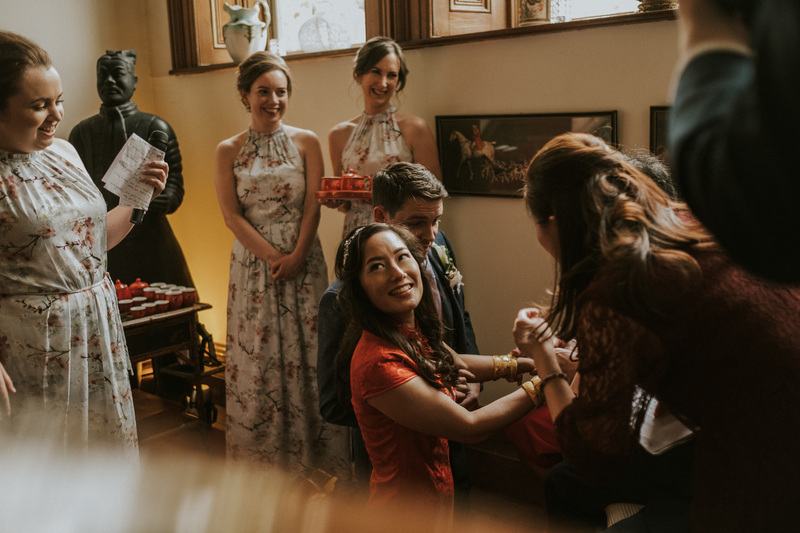 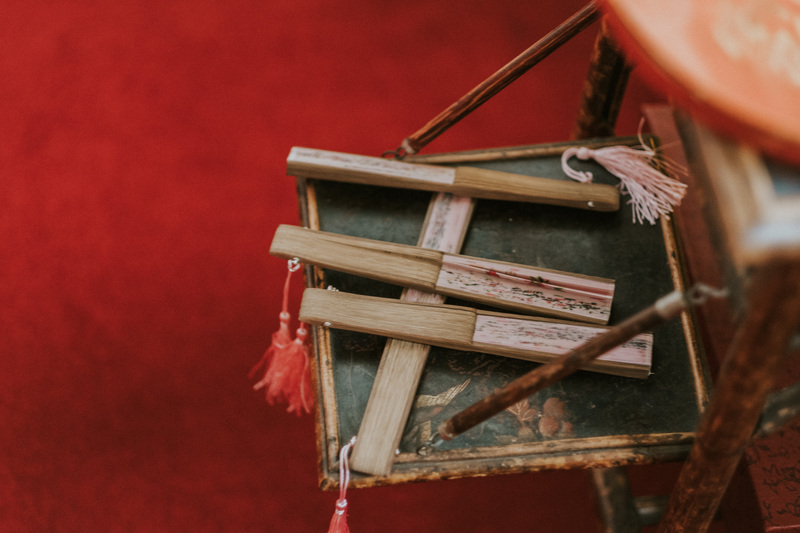 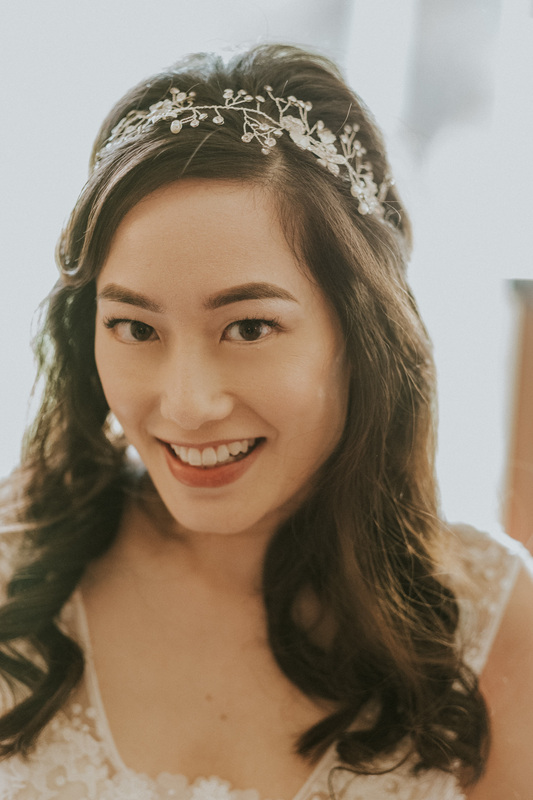 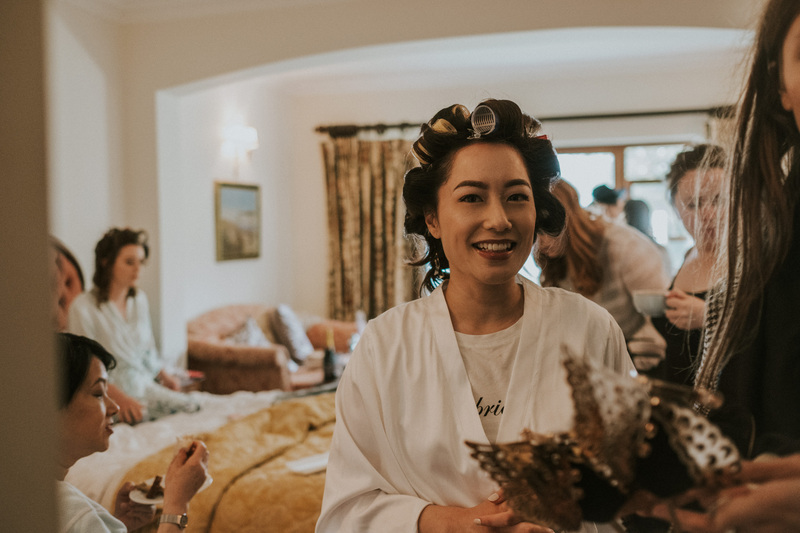 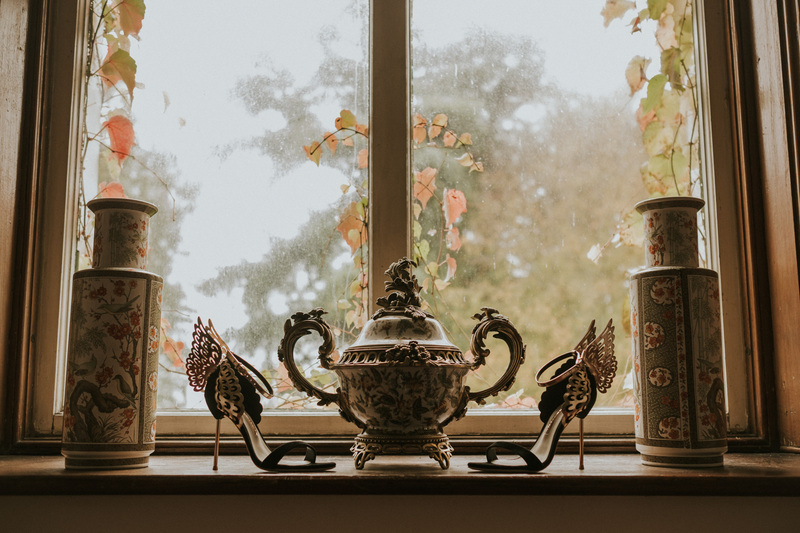 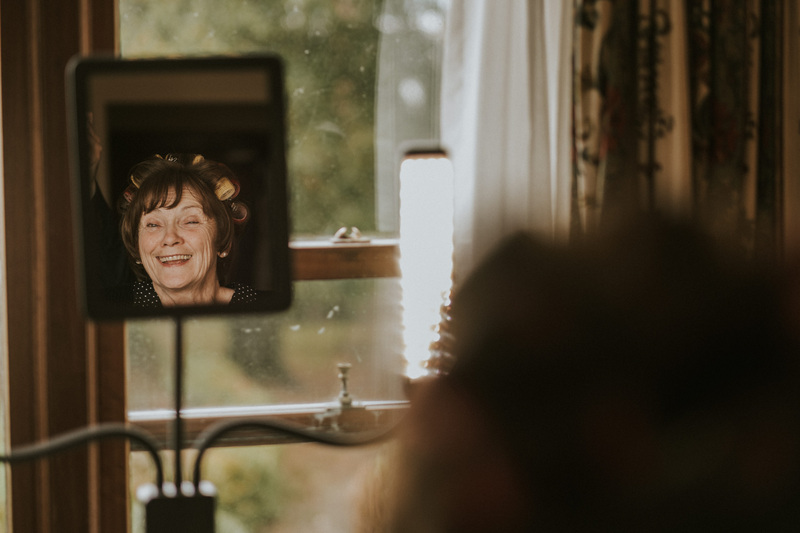 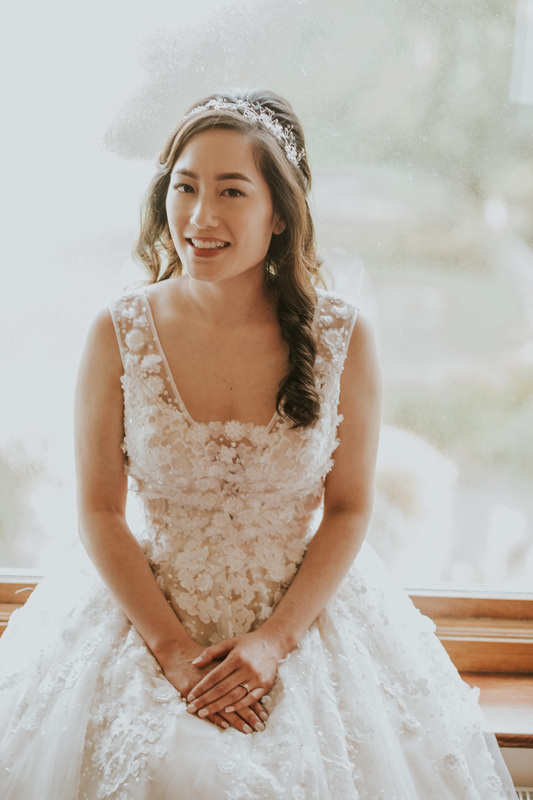 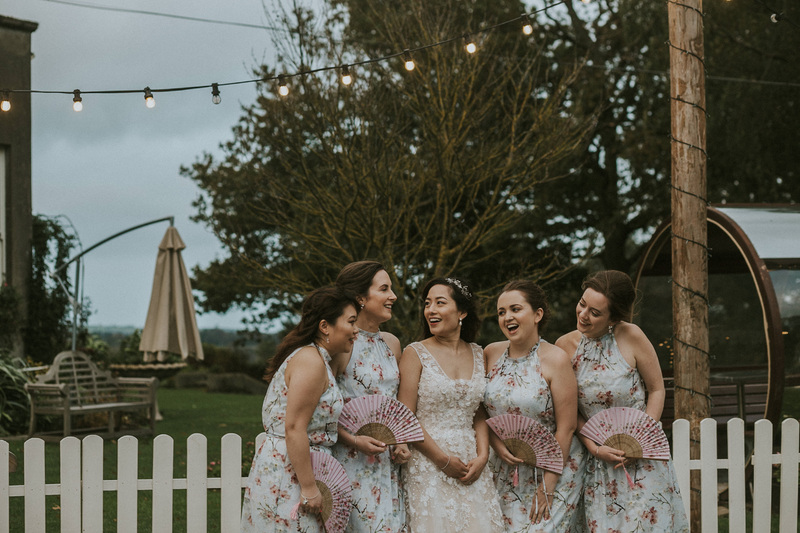 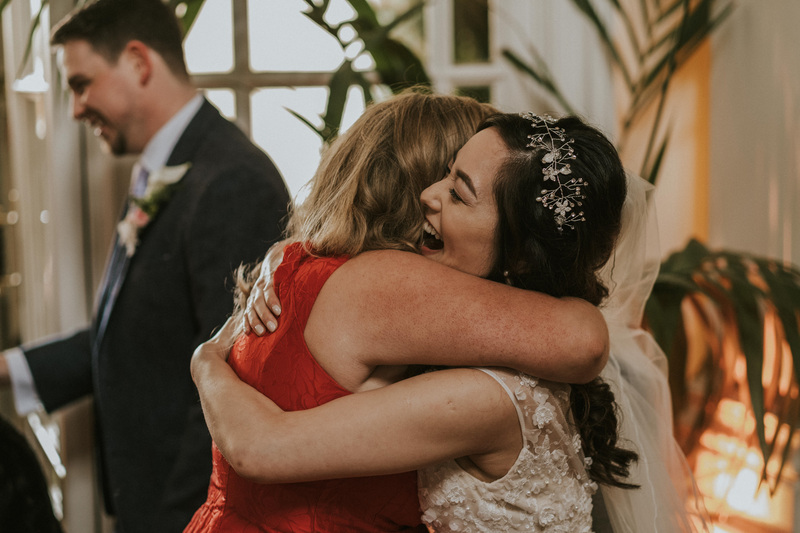 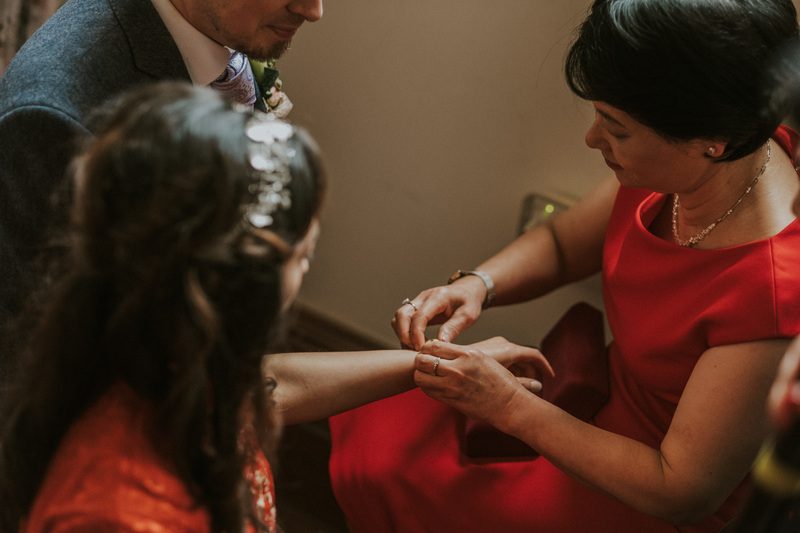 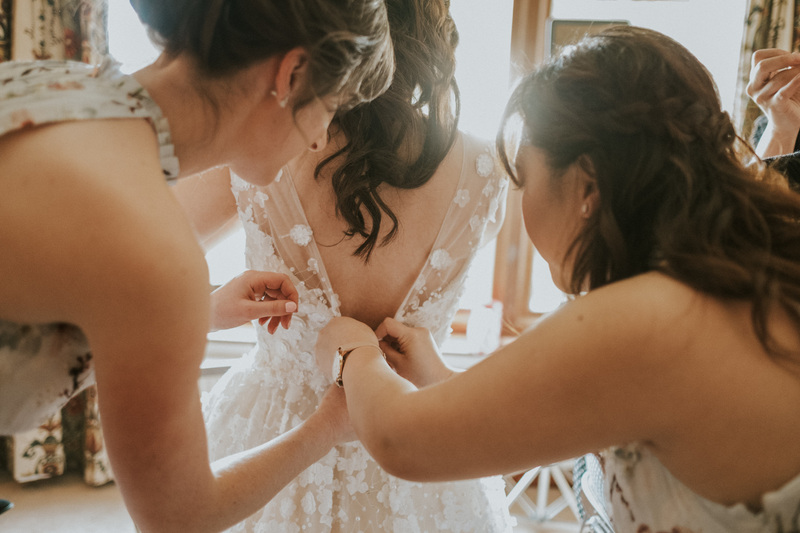 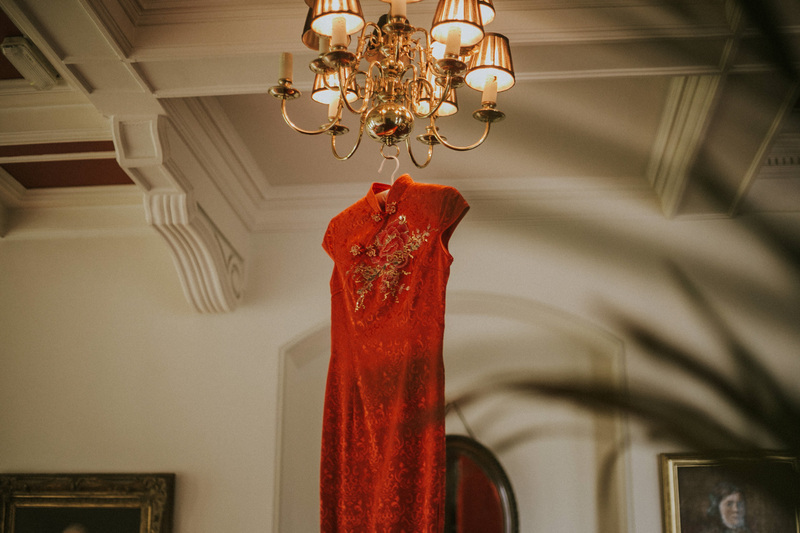 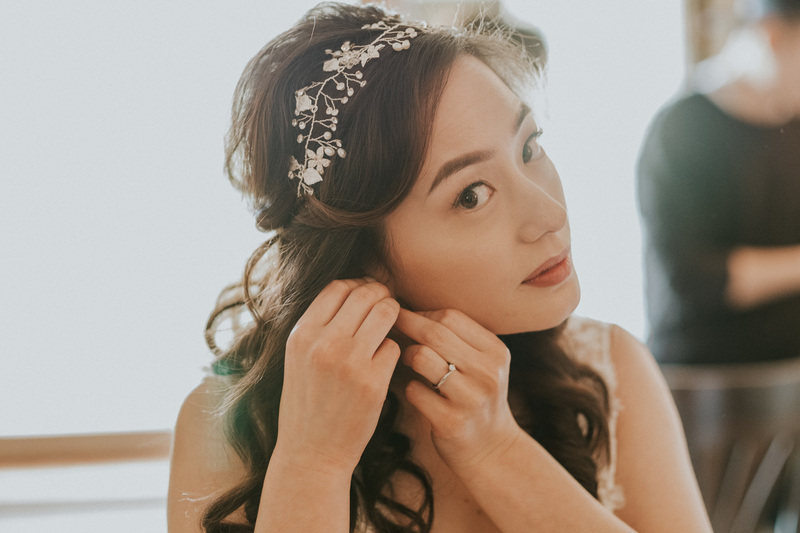 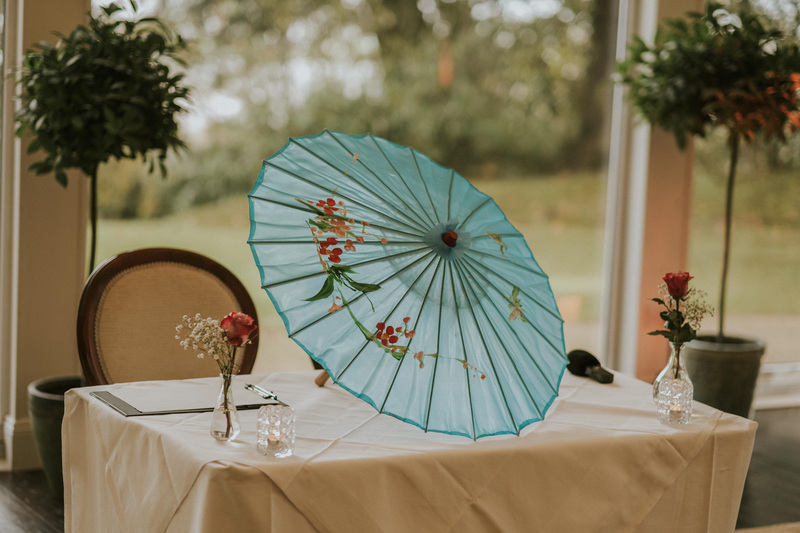 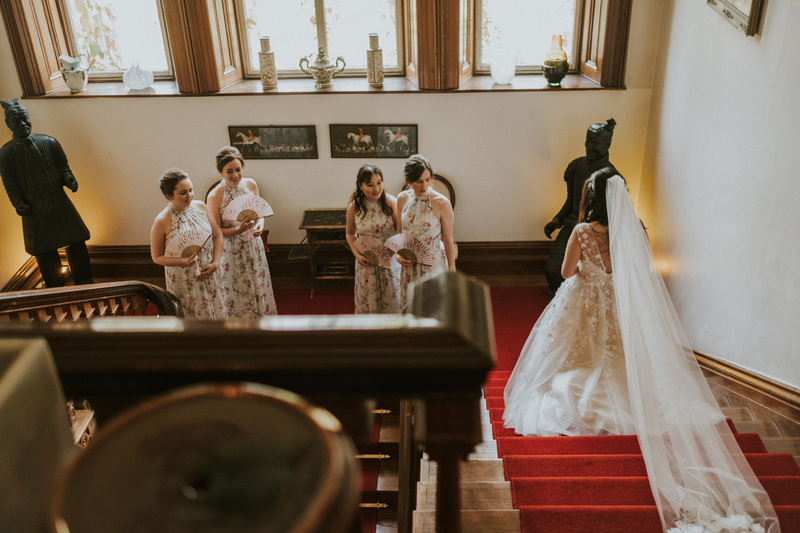 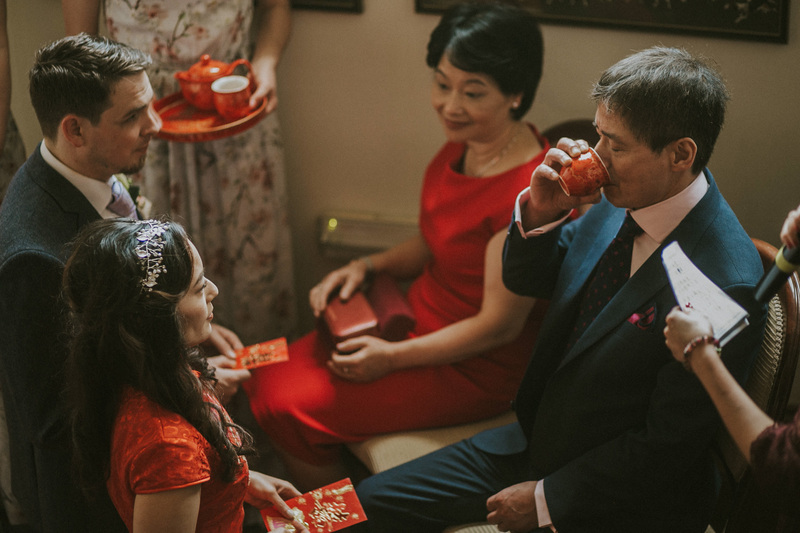 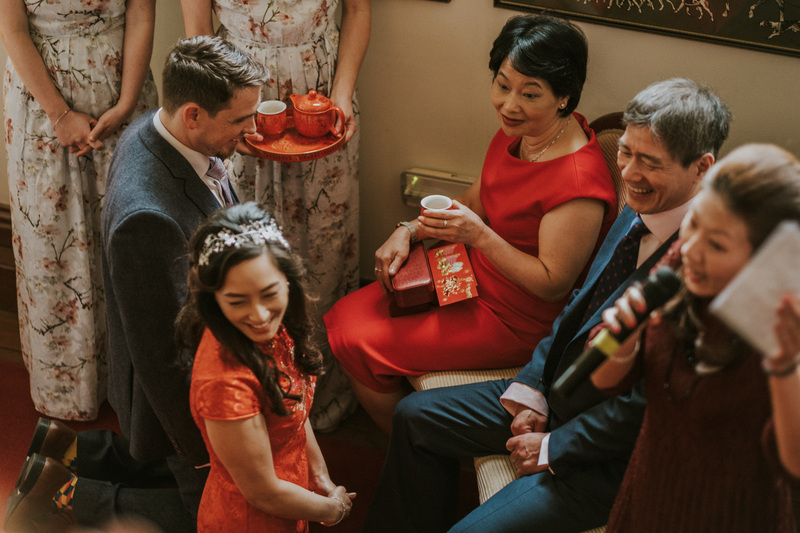 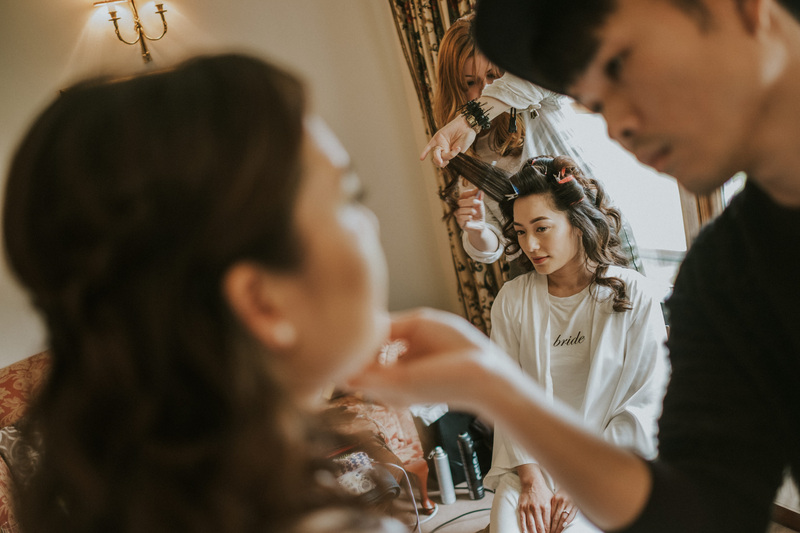 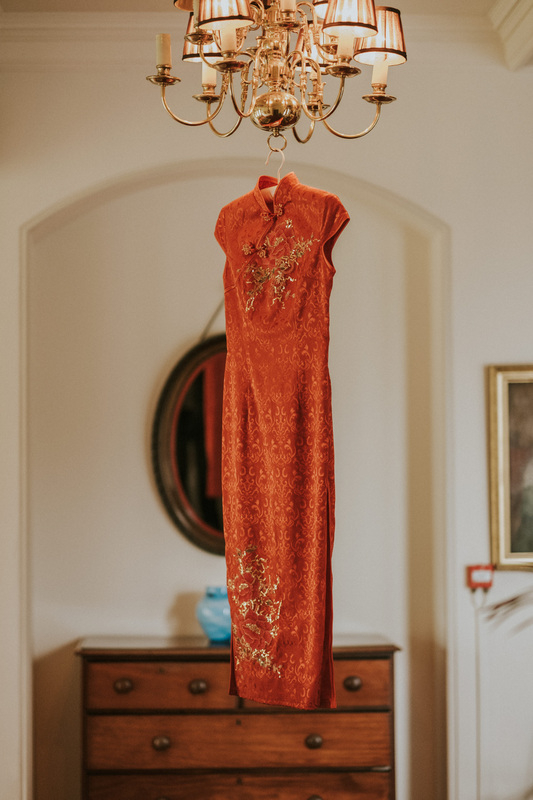 Her bridesmaids held floral Chinese fans in place of traditional wedding bouquets, and Bickay’s plentiful Chinese Gold bracelets, symbolic red tea pot and cups held a significanet place, amongst the morning preparations and final wedding images. 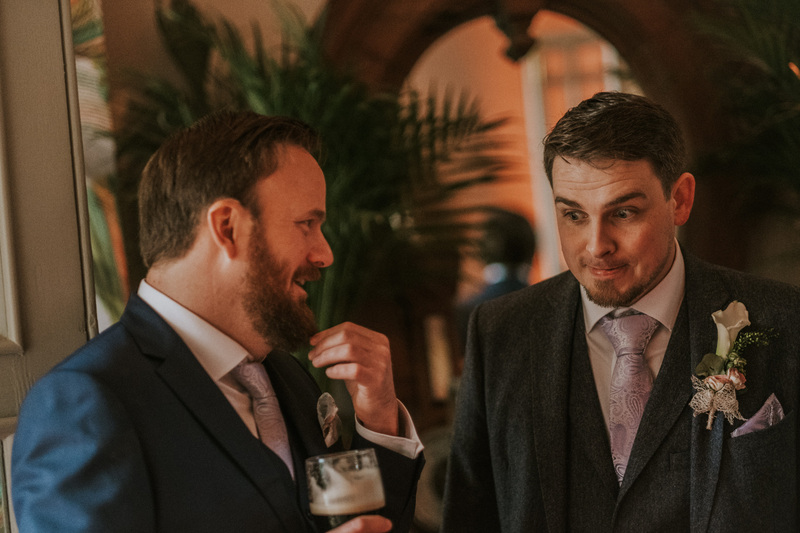 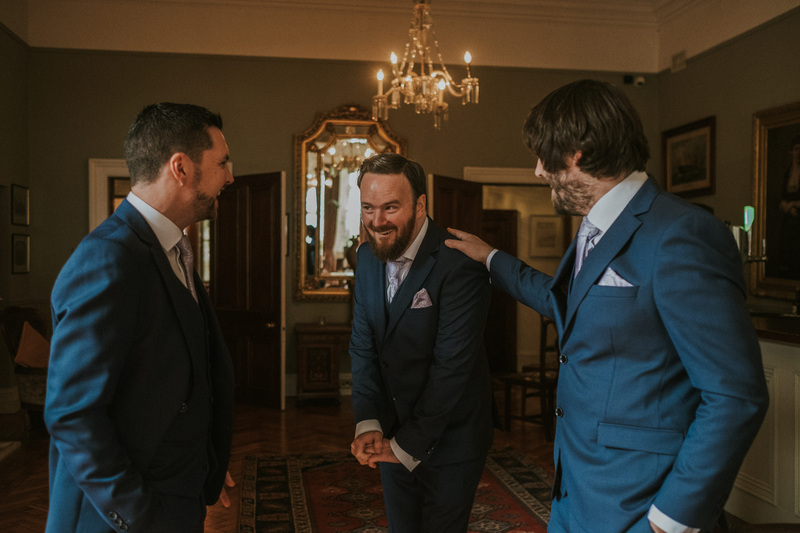 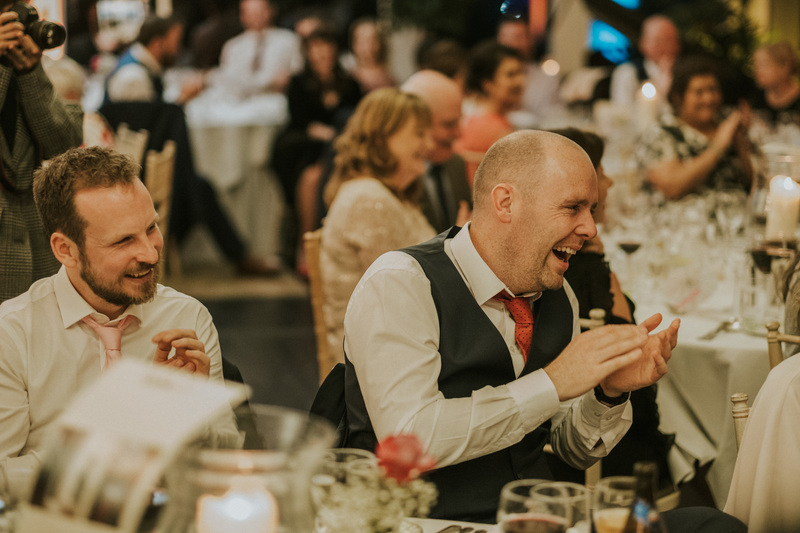 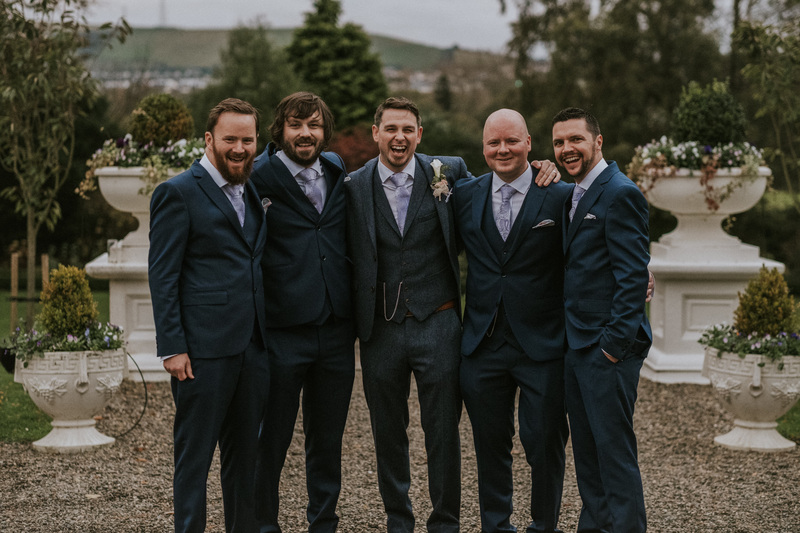 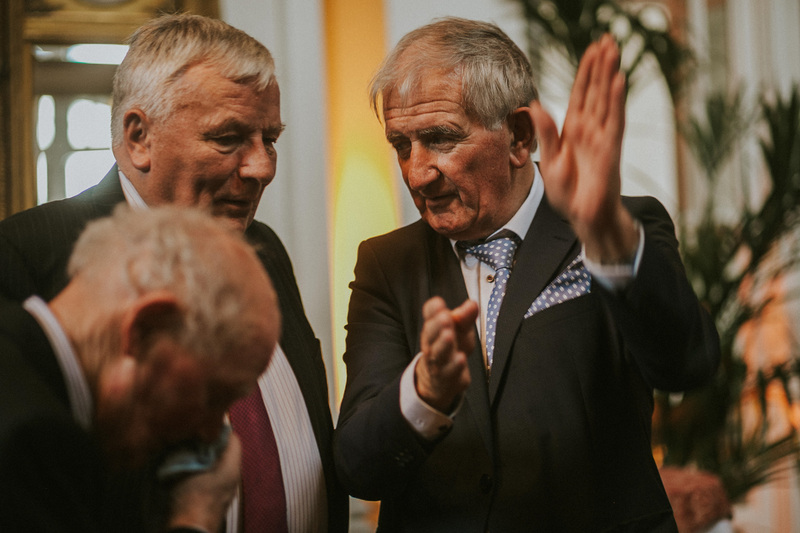 The lads were a floor over, enjoying the morning with some classic Irish banter, a few sips of Whiskey, and making sure Lucky Red Envelopes were safe in jacket pockets. 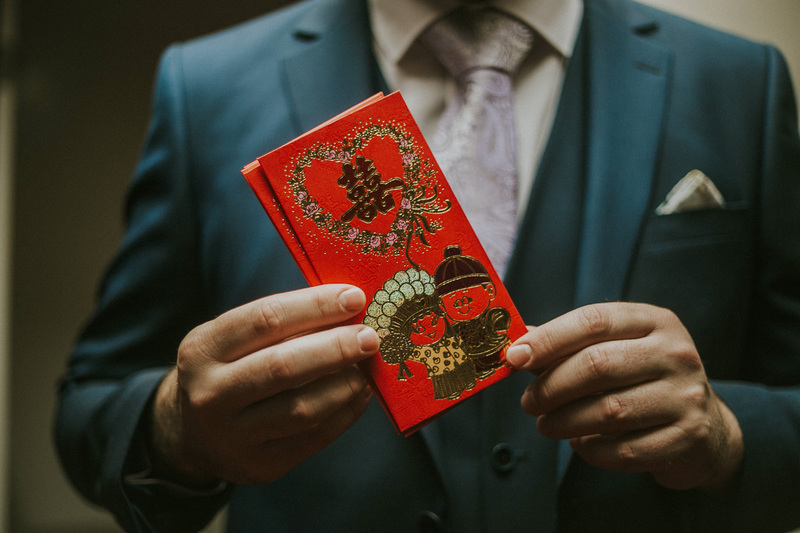 The Lucky Red Envelope, or Red Envelope, is traditionally called a Hongbao, and its symbolism lay not in the monetary value inside, but the red envelope itself, as in China red symbolises good luck and prosperity. 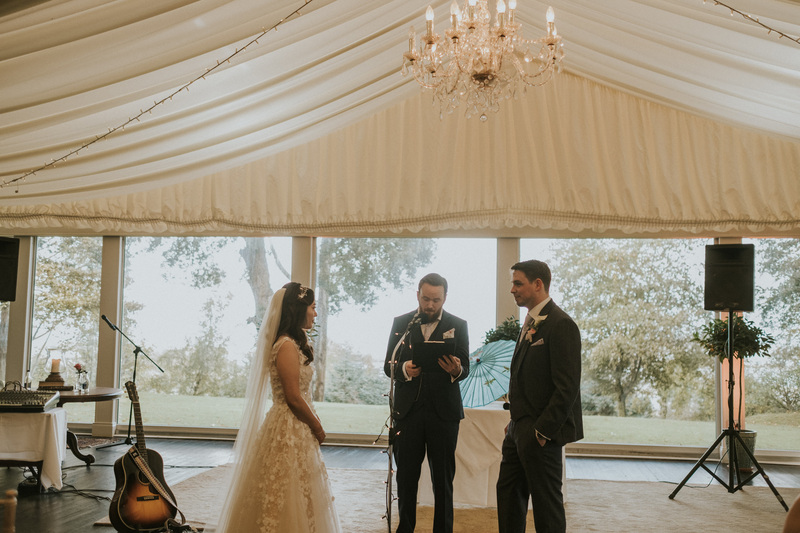 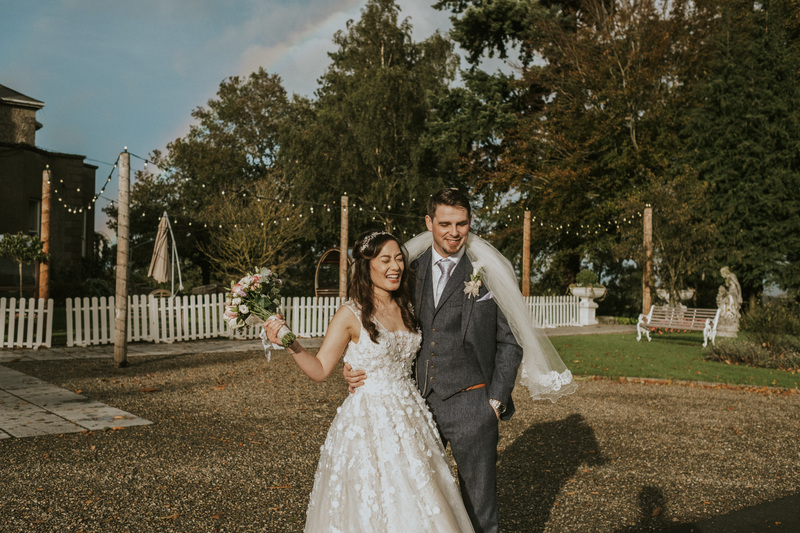 Accompanying the rainbow in the sky at this Tinakilly House Wedding, was the musically talented Groom Bazz, who serenaded his beautiful Bride as she walked up their uniquely decorated aisle, in her classic first dress of the day. 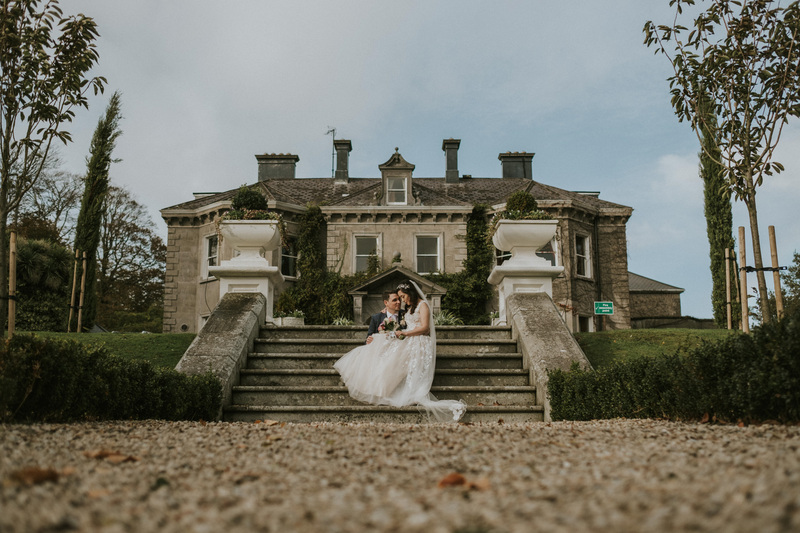 Their Tinalkilly House Wedding service was made complete with music from friends, and post service we took some time out for some bridal portraits on Tinakilly’s fantastic grounds. 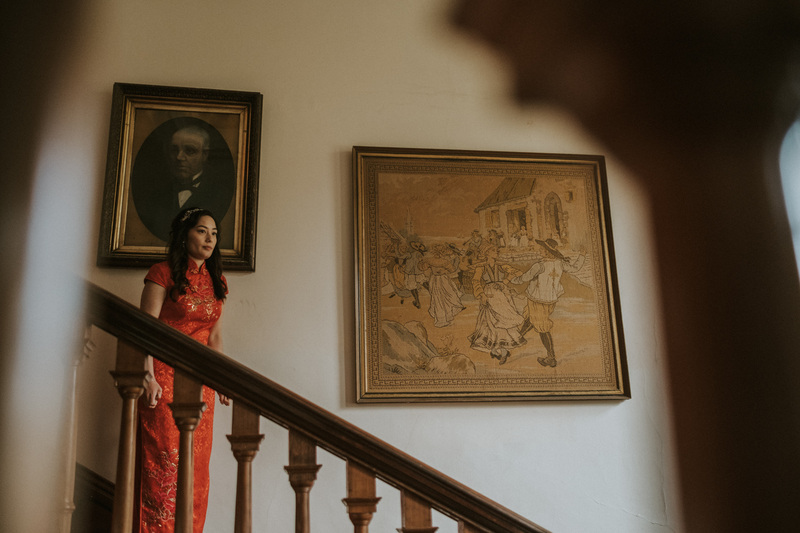 Bickay then headed back to their suite for a quick dress change, re-emerging moments later on Tinakilly’s Grand Staircase in a traditional red dress for their Chinese Tea Ceremony. 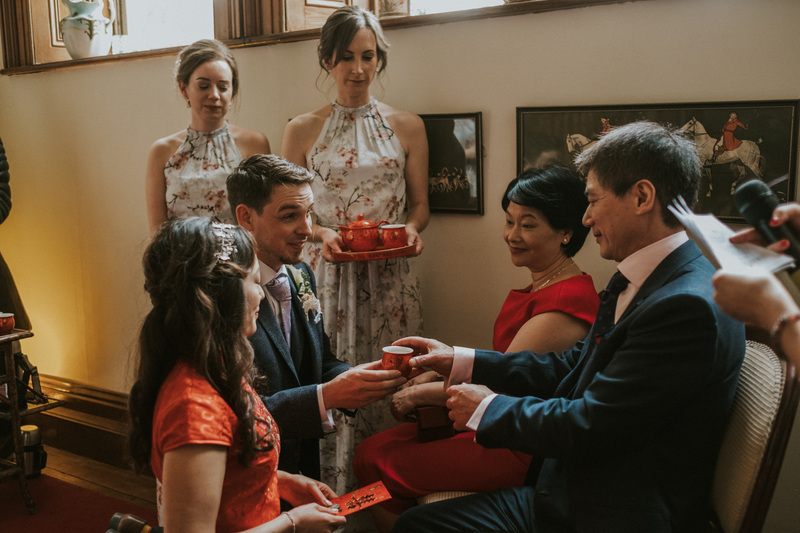 Here, various members of both sides of the families present the couple with wishes for their future while sharing cups of tea. 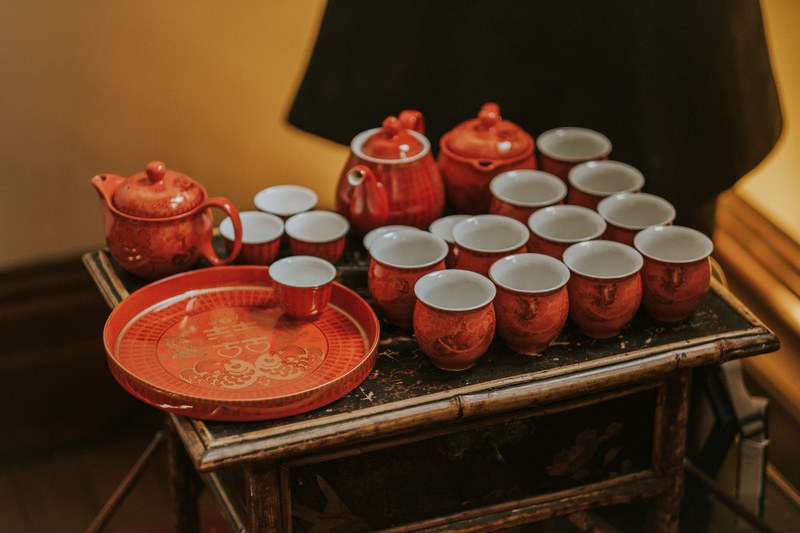 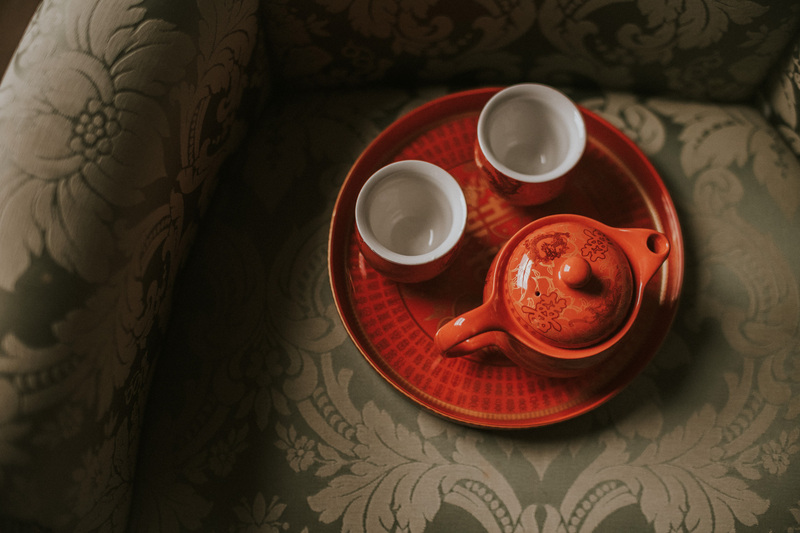 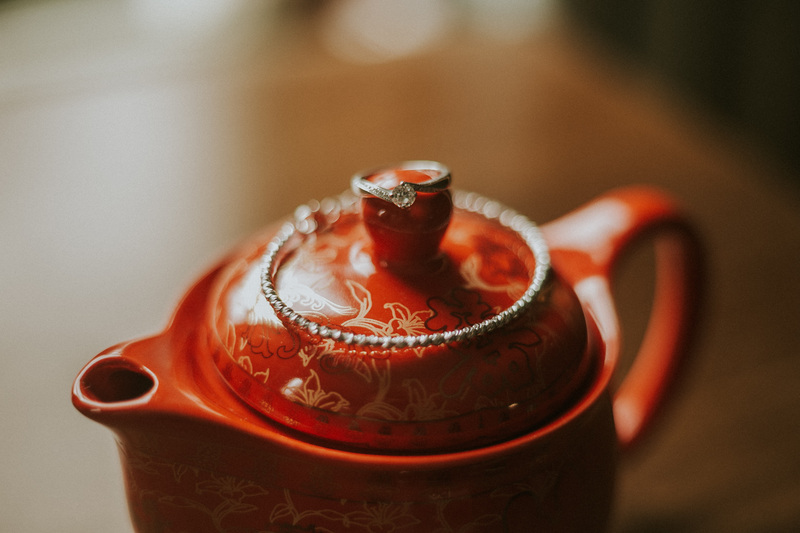 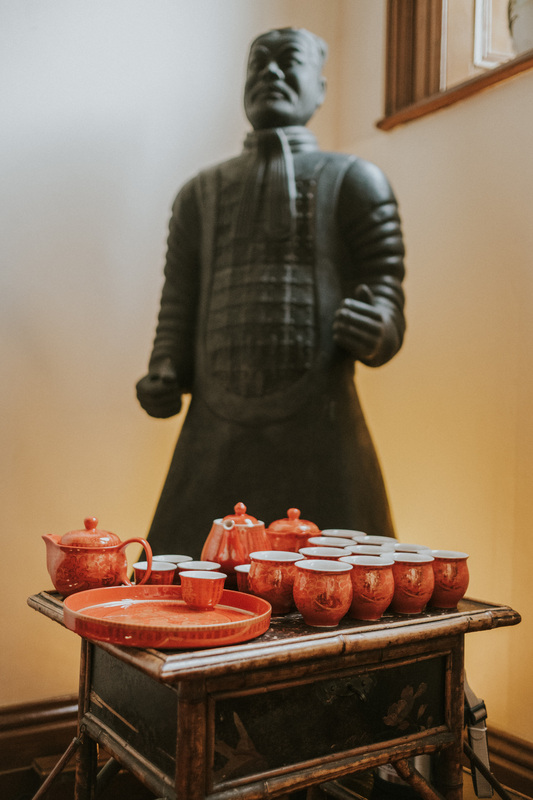 The earliest records of tea ceremonies were during the Tang Dynasty over 1200 years ago, today it still holds great prominence and importance in Chinese culture. 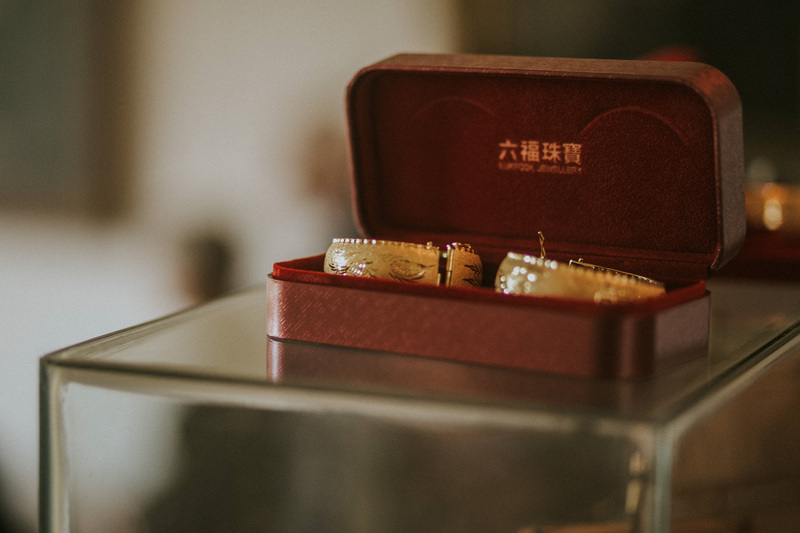 The ceremony remains a symbol of purity, stability, fertility. 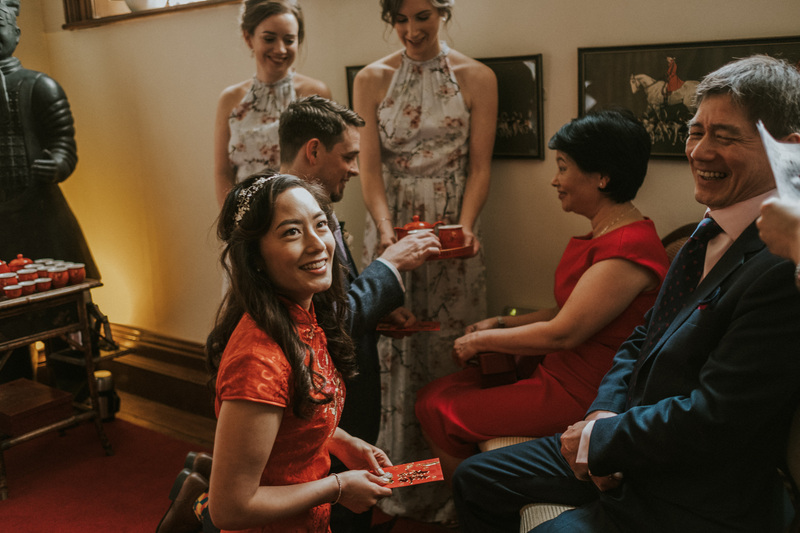 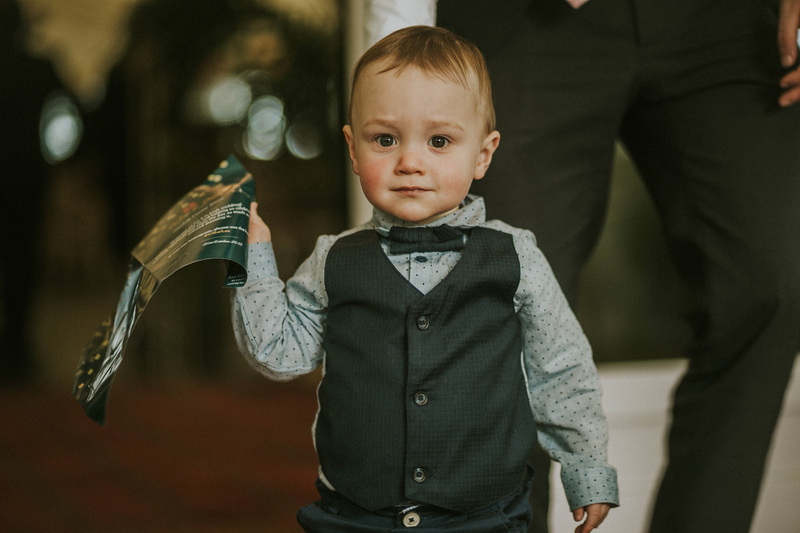 It also gives the families a chance to formally introduce the couple, and show respect to the both sides of the families. 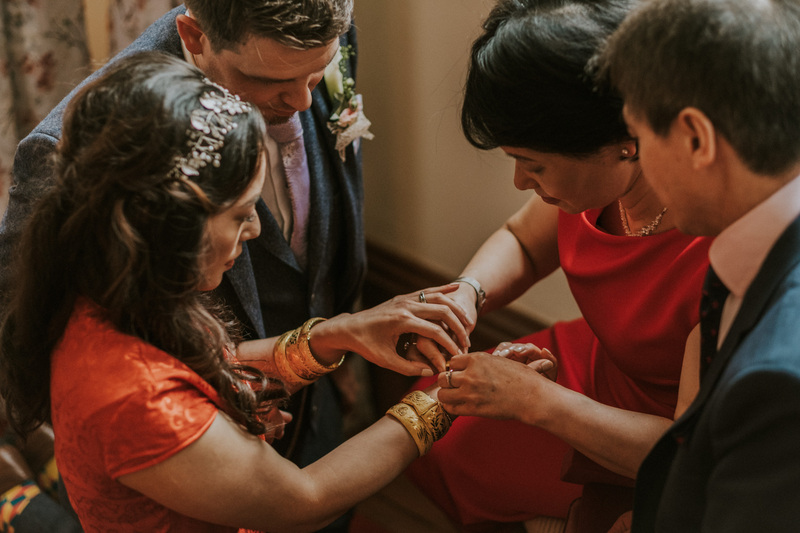 Along with the well wishes gifted to the couple, Bickay is also adorned on both her wrists with gold bracelets from family members. 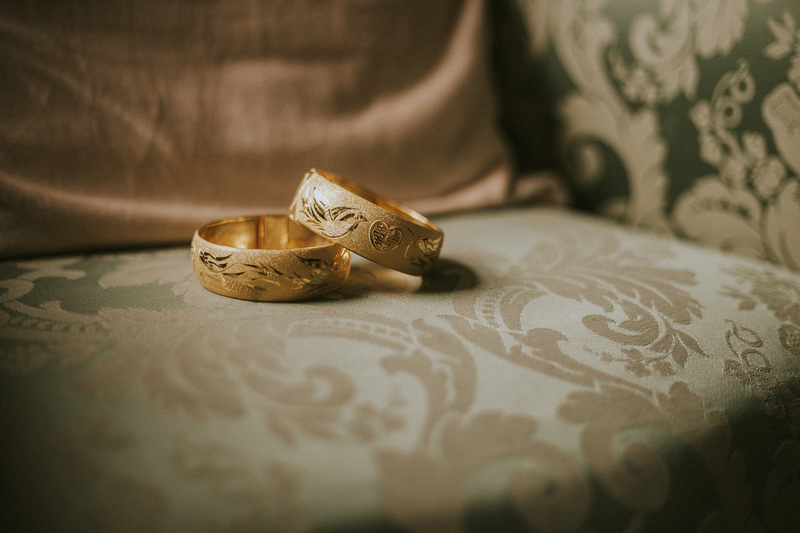 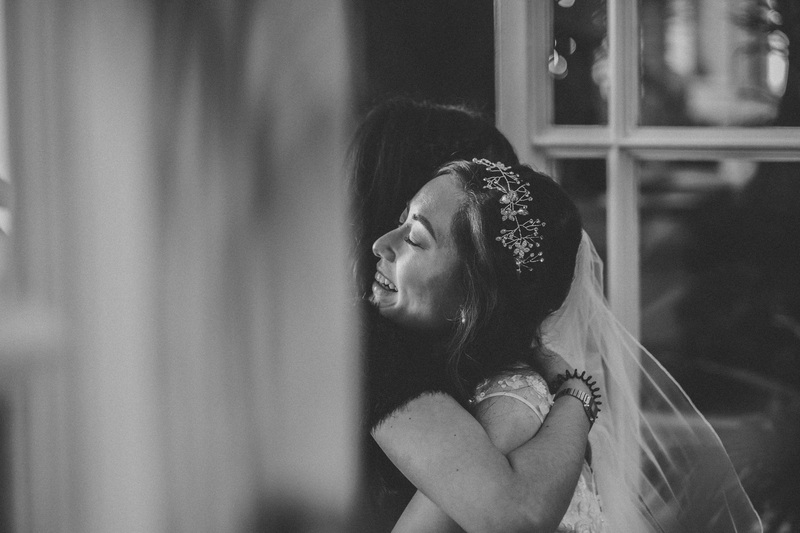 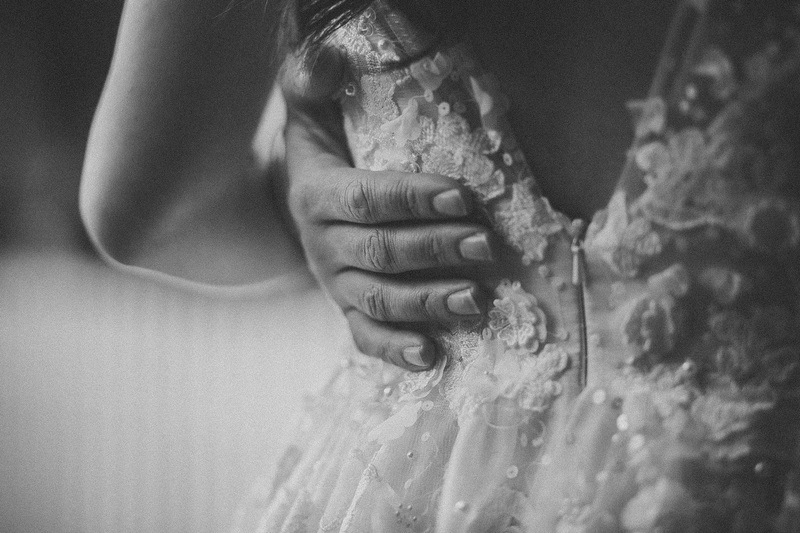 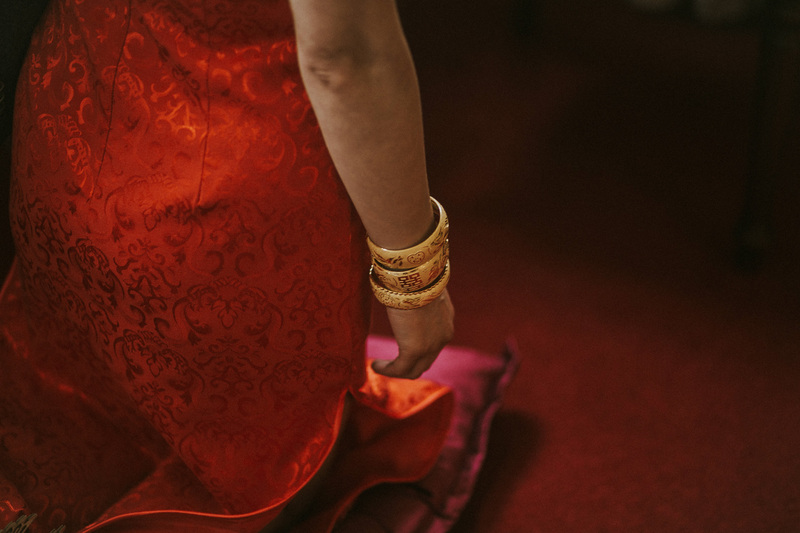 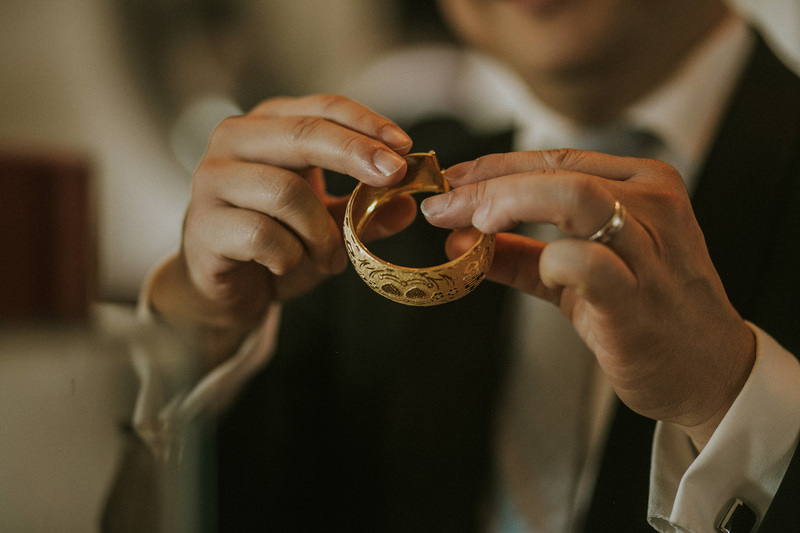 By the time the ceremony concluded, Bickay had gold bangles almost up to her elbows on both sides of her arms. 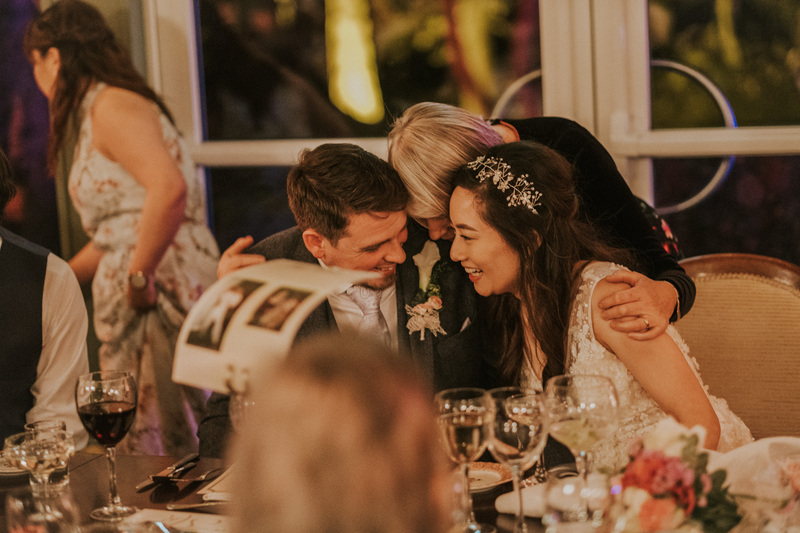 A very symbolic gesture of the amount of love and support shown to the couple. 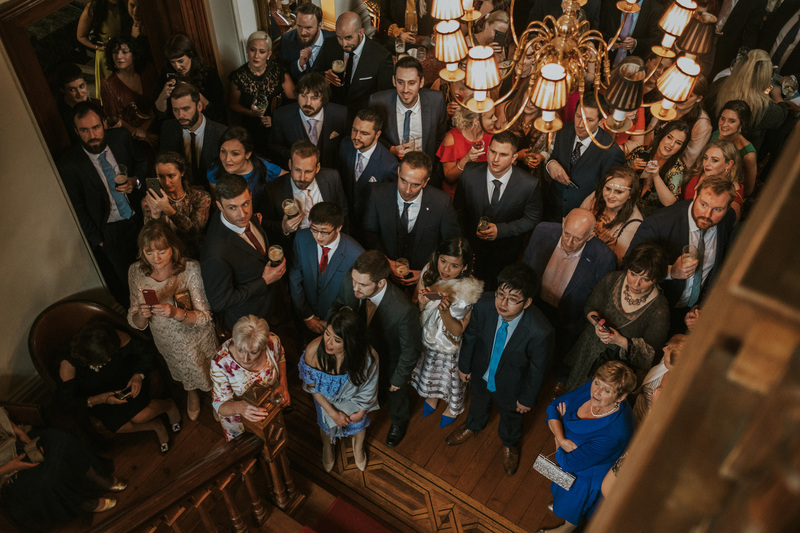 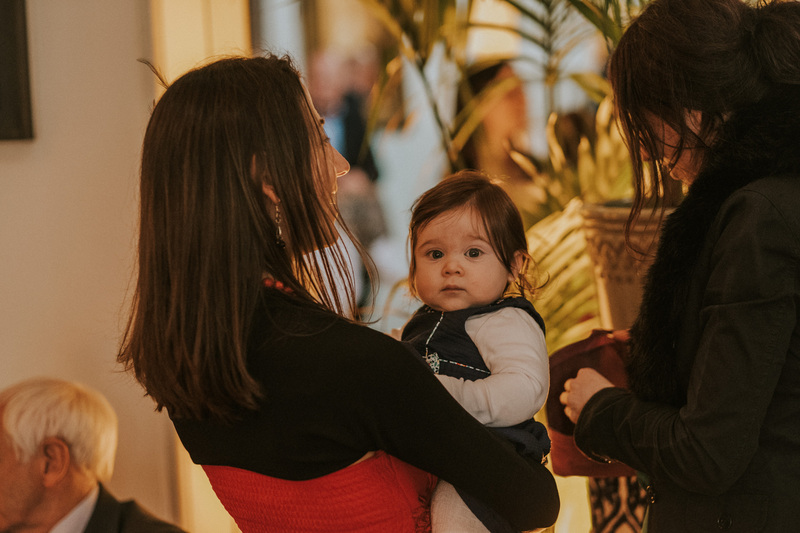 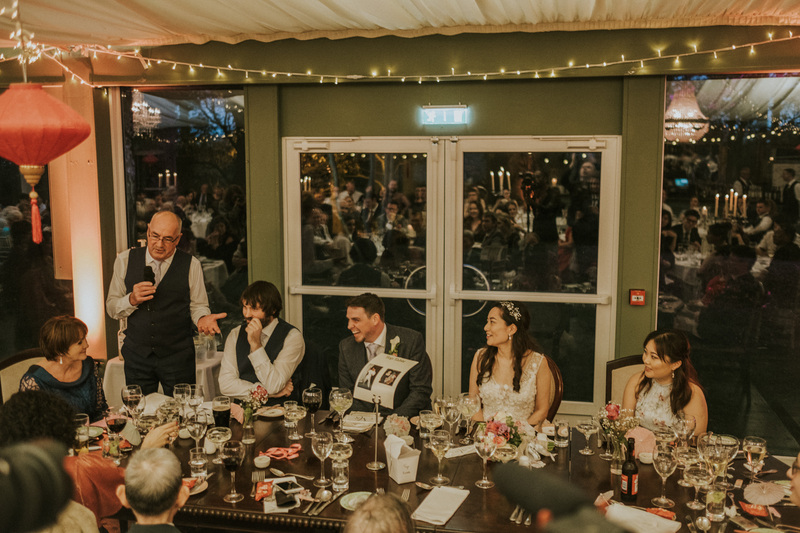 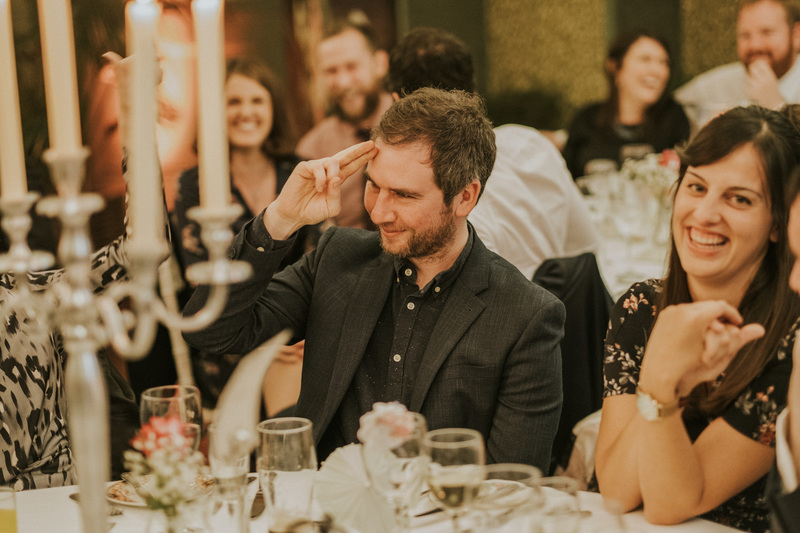 It was a remarkably unique experience for those in attendance and their wedding guests gathered in the Tinakilly House foyer to watch the proceedings commence. 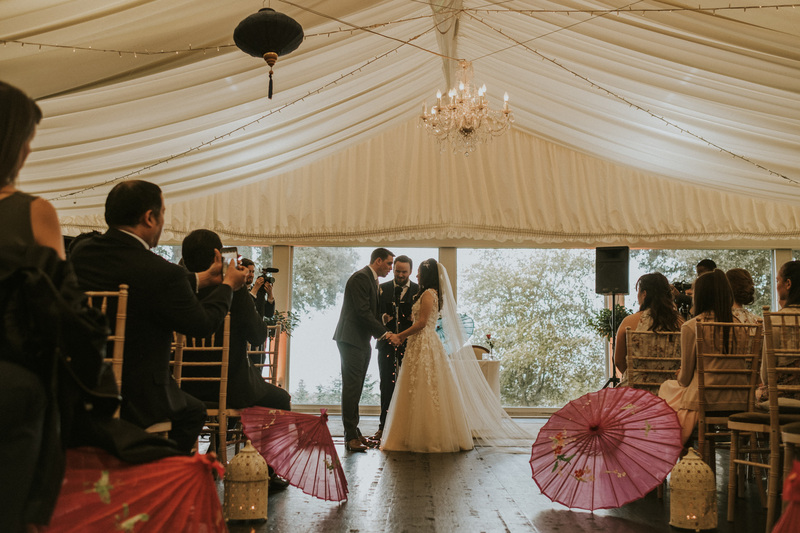 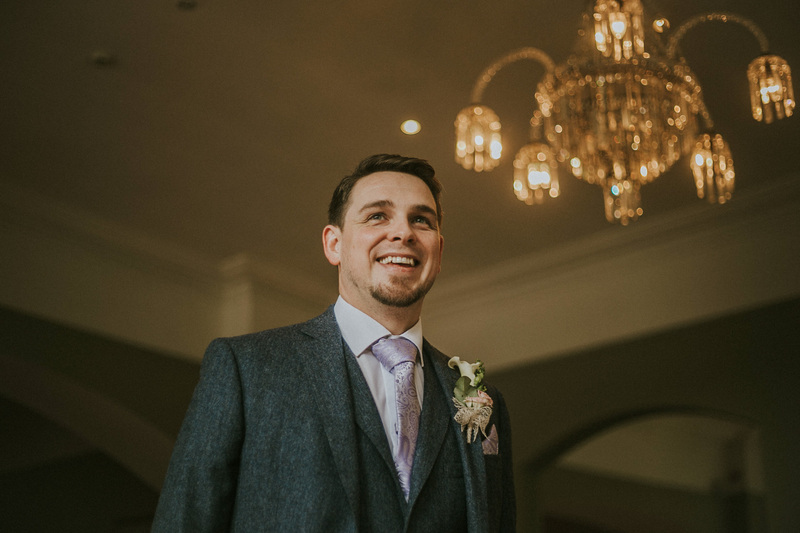 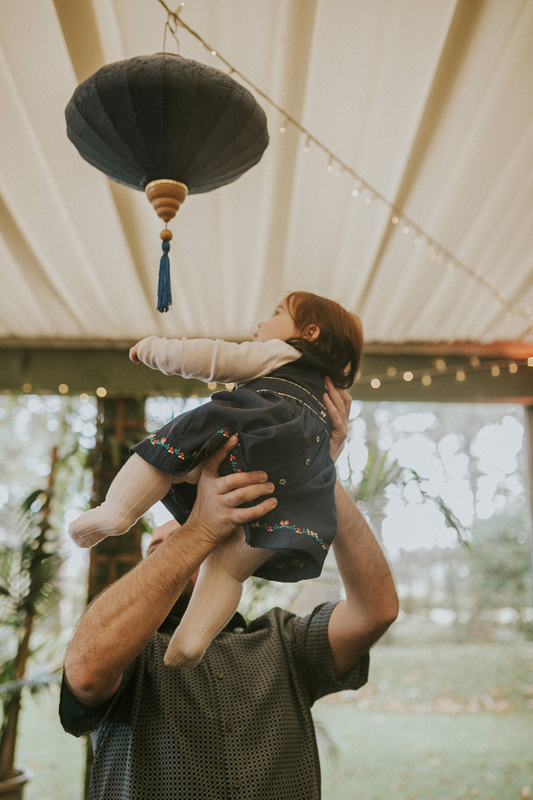 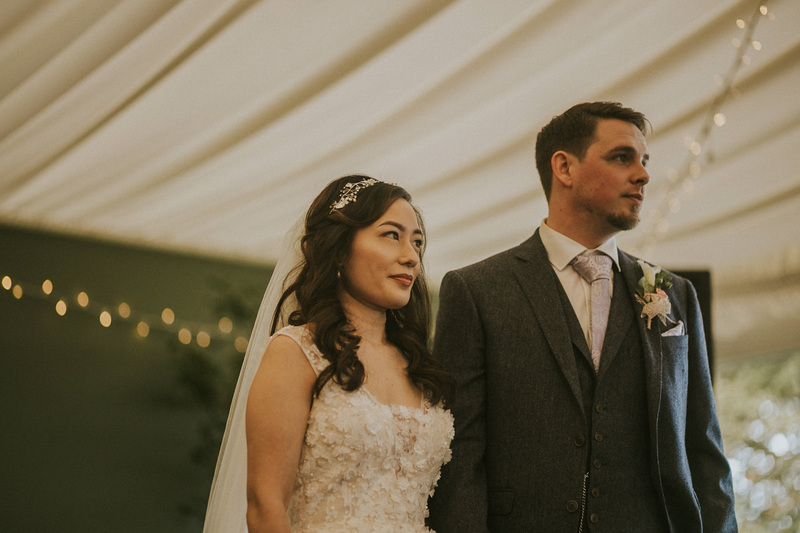 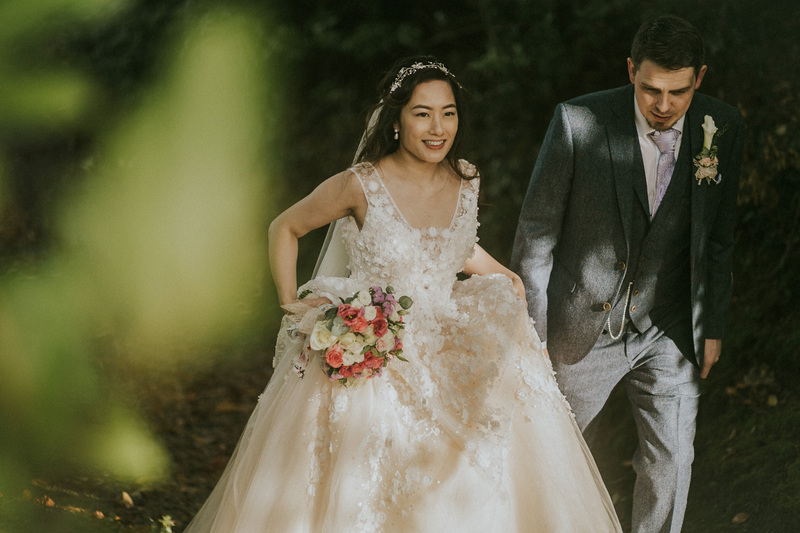 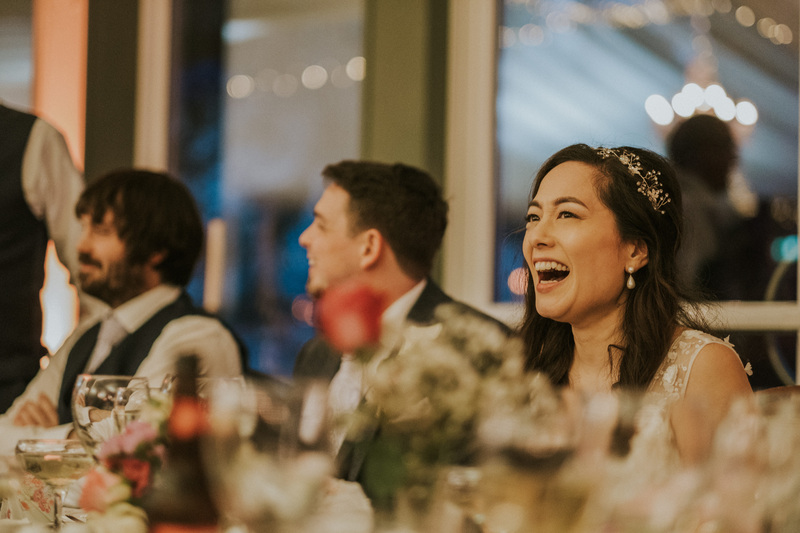 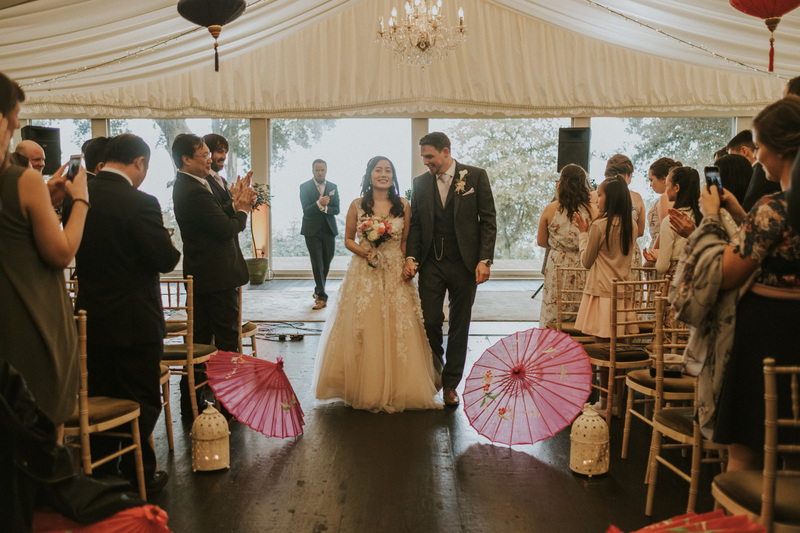 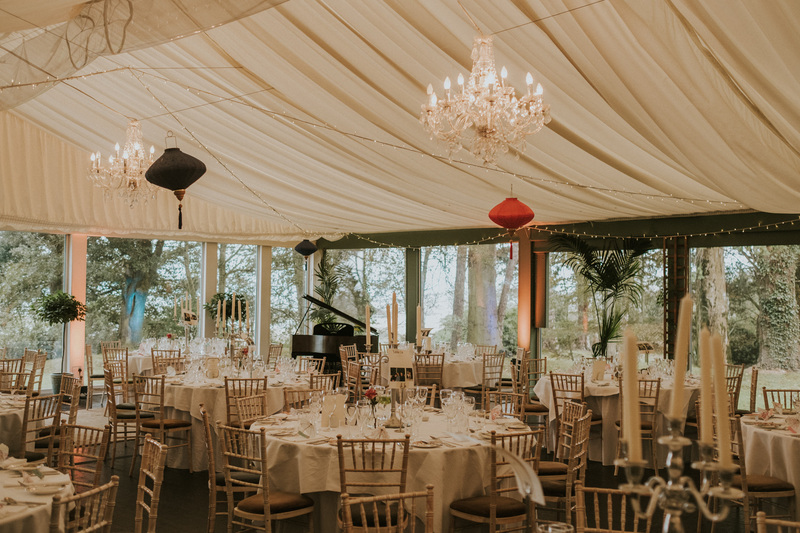 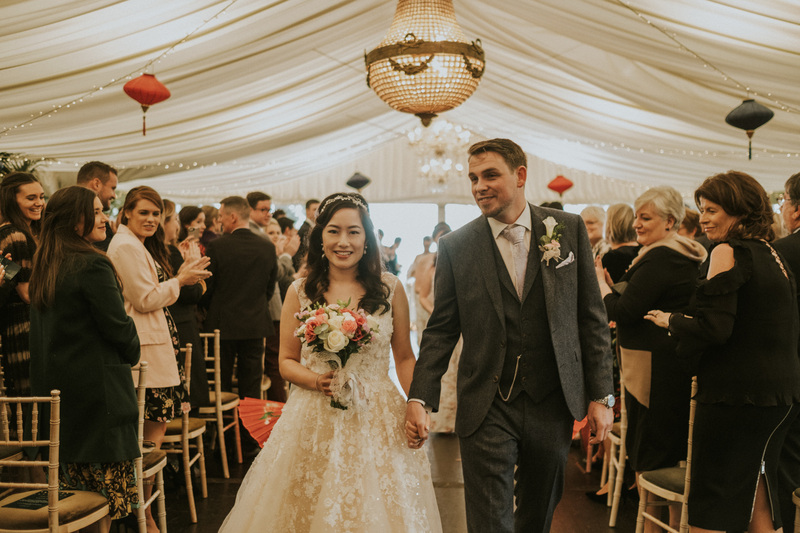 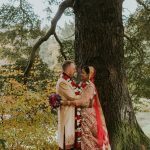 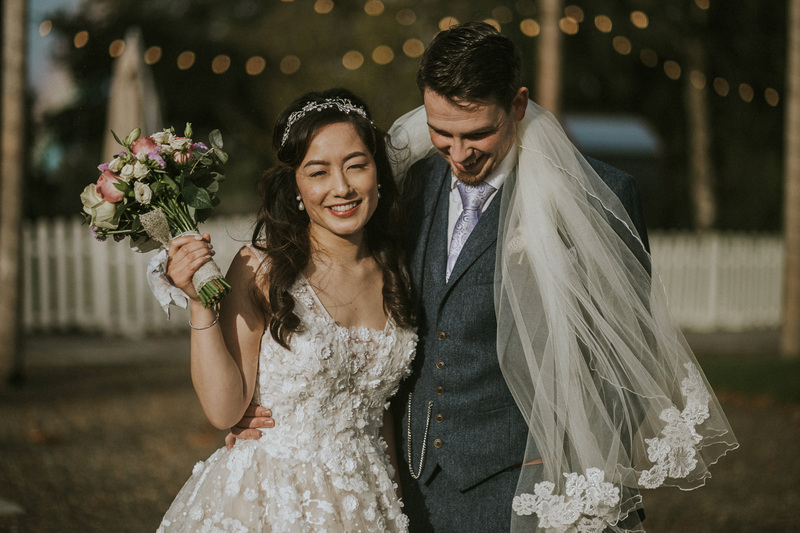 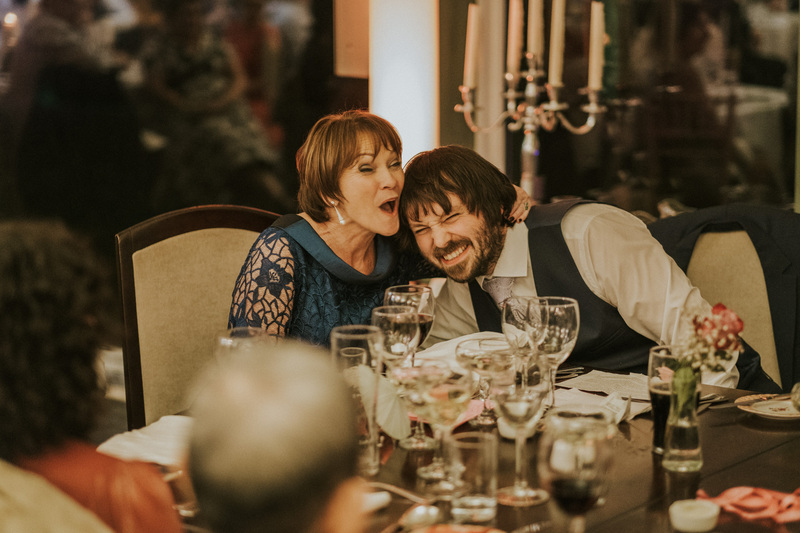 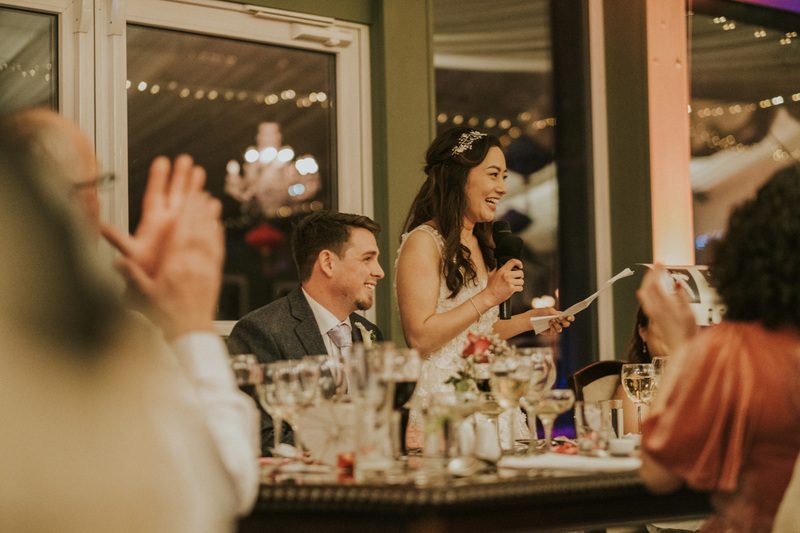 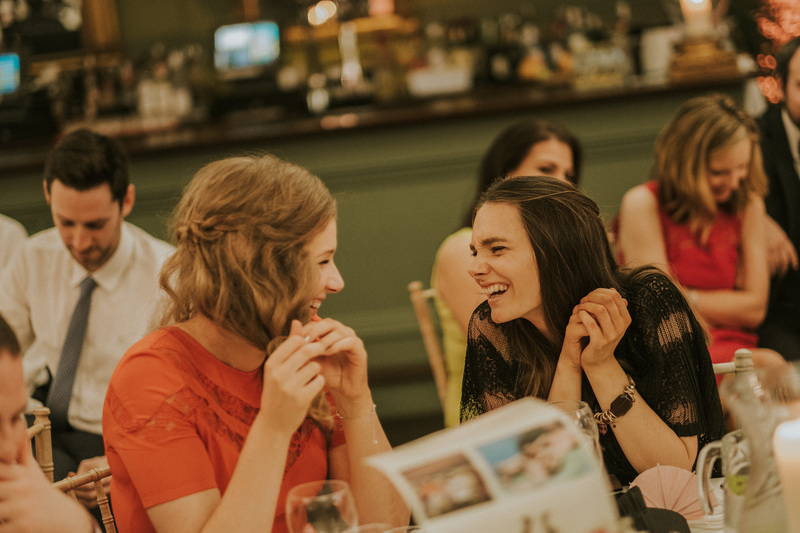 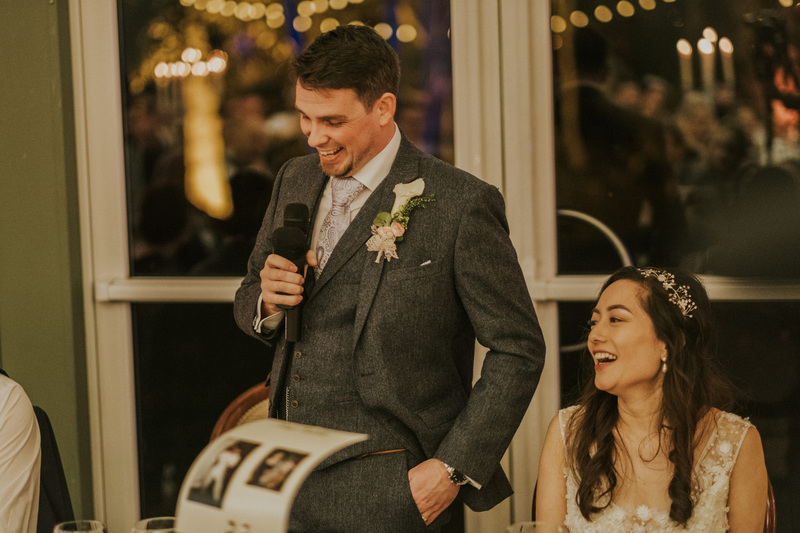 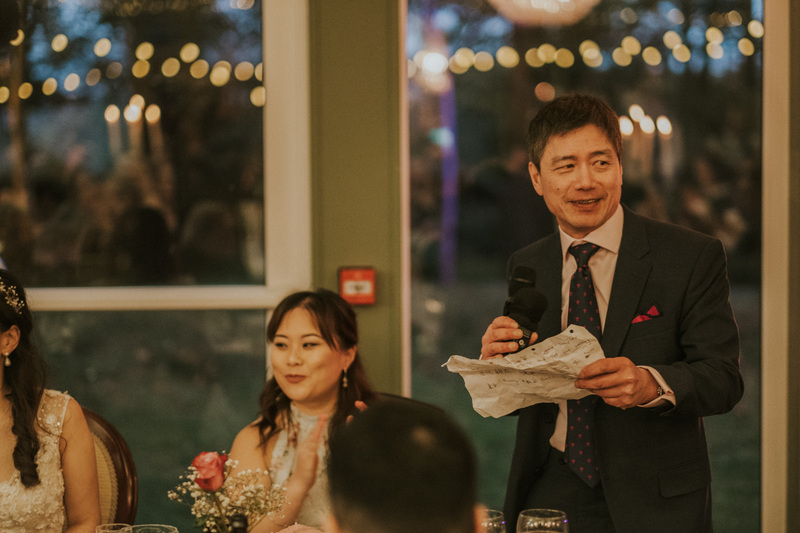 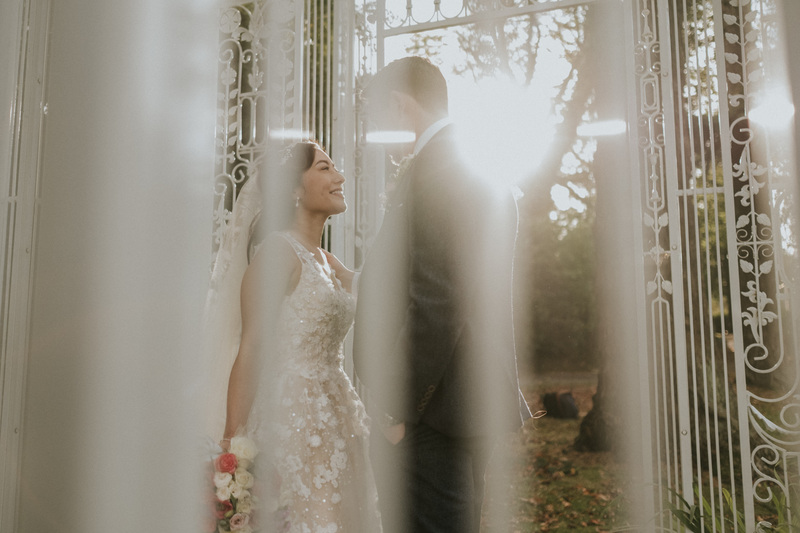 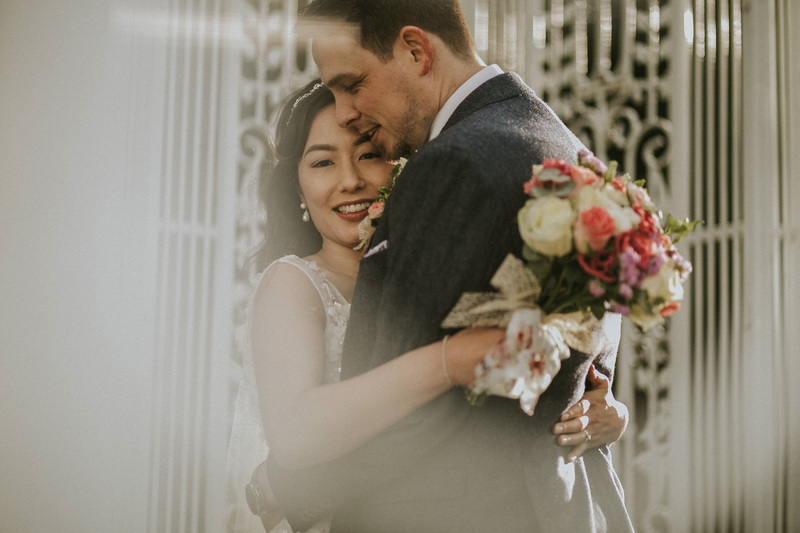 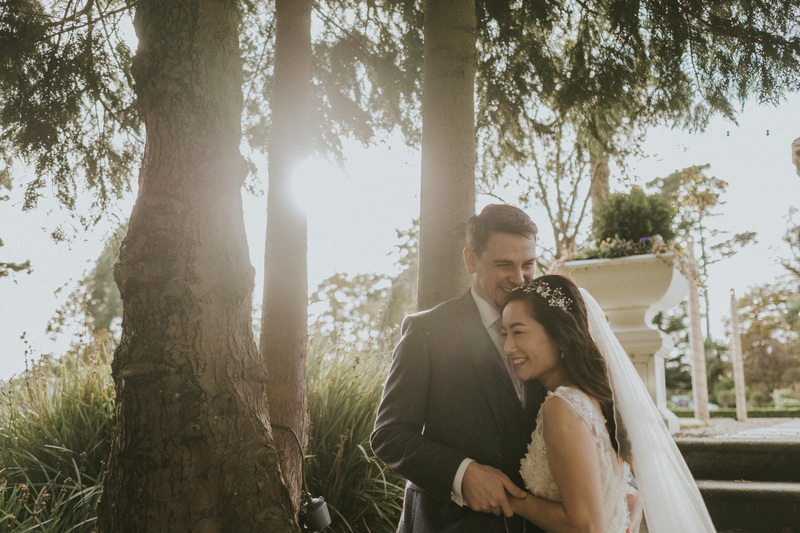 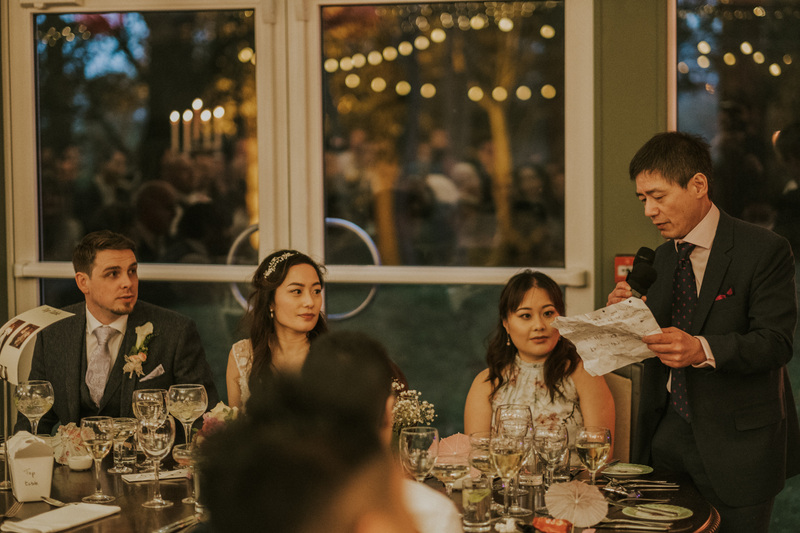 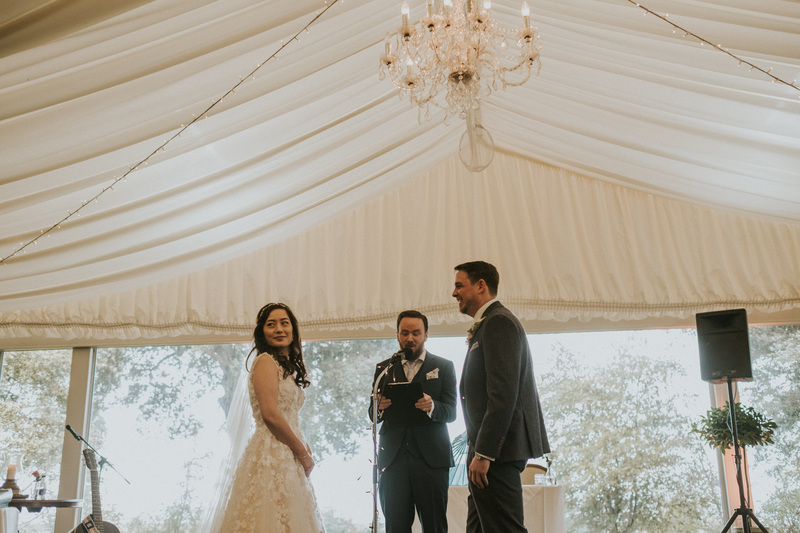 Their reception was decorated with Chinese Lanterns, and their wedding speeches decorated with humour matching the day’s pace. 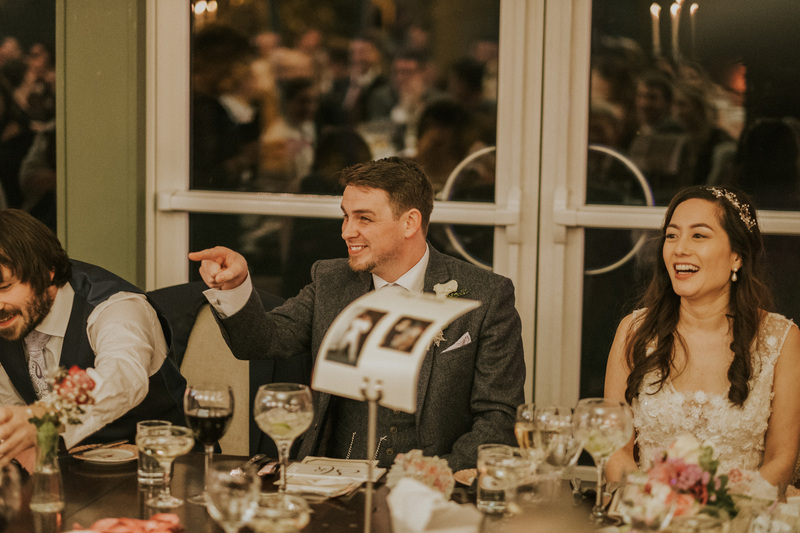 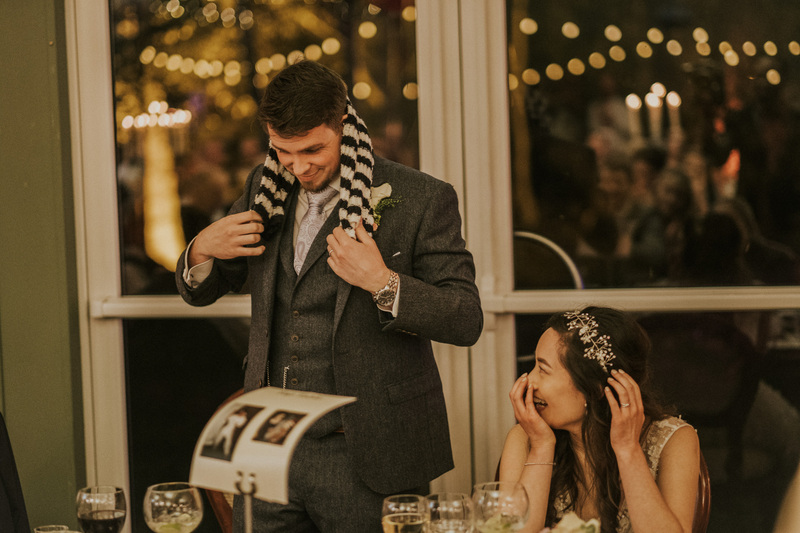 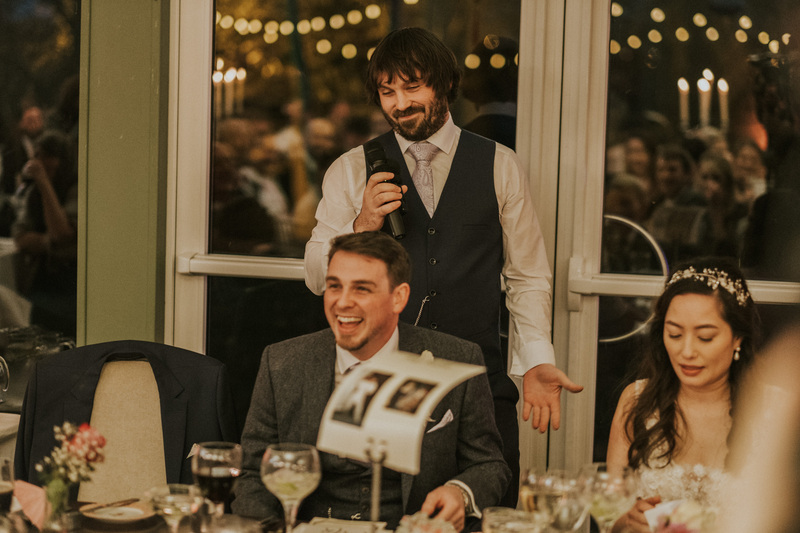 From the Best Man/Best Brother speech, too Bazz’s own recounting of a scarf Bickay once knitted him that was far too small. 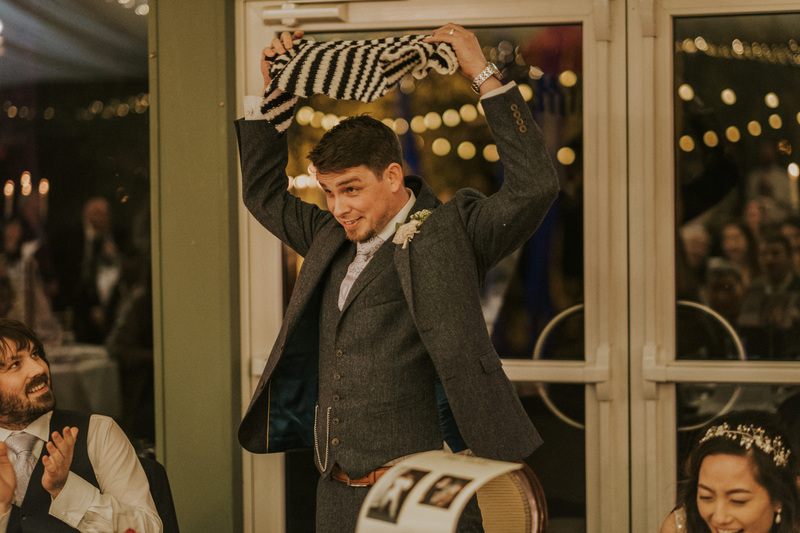 He even brought it along for visual proof. 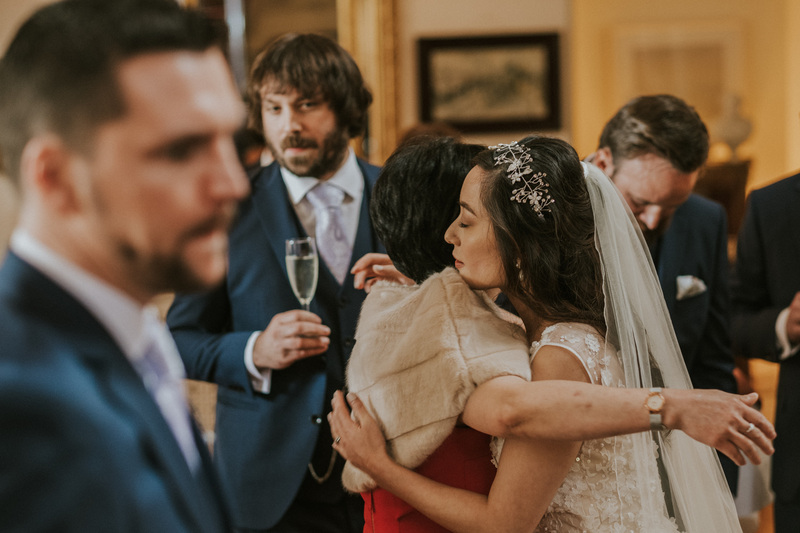 There wasn’t a dry eye in the house. 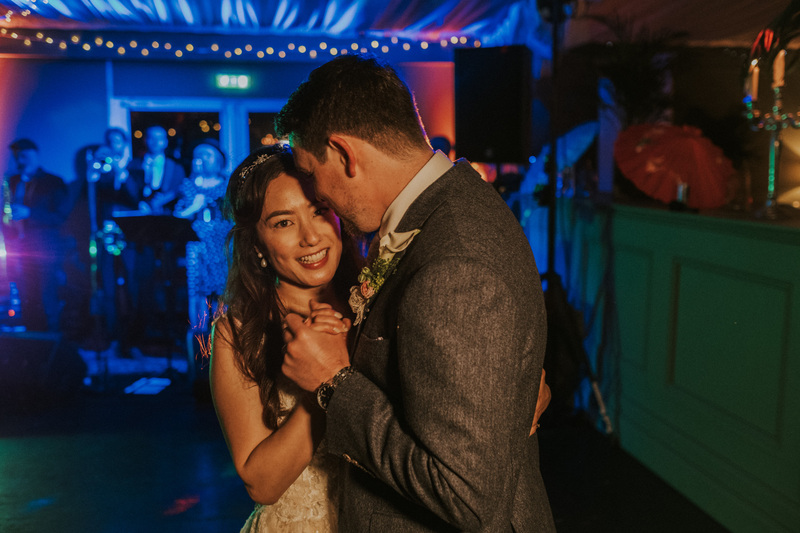 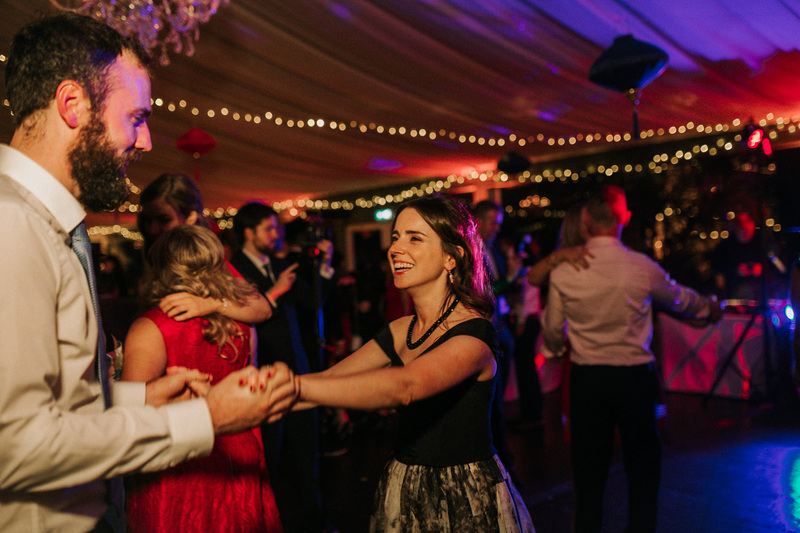 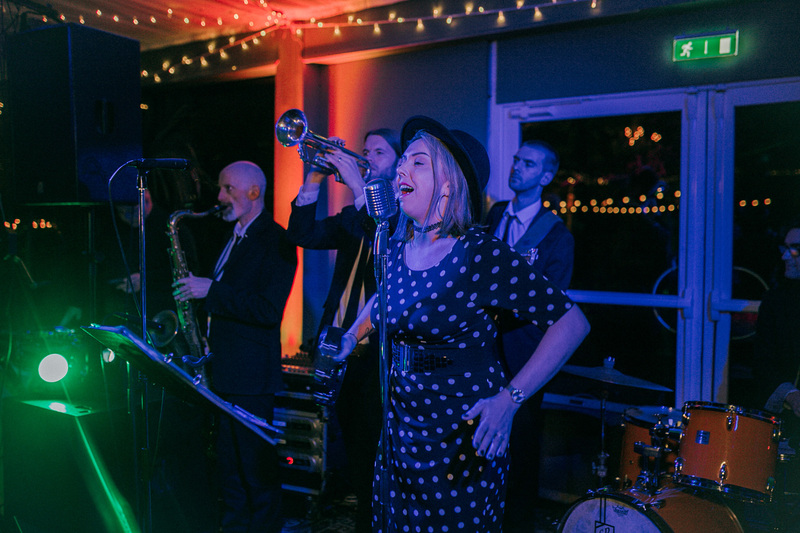 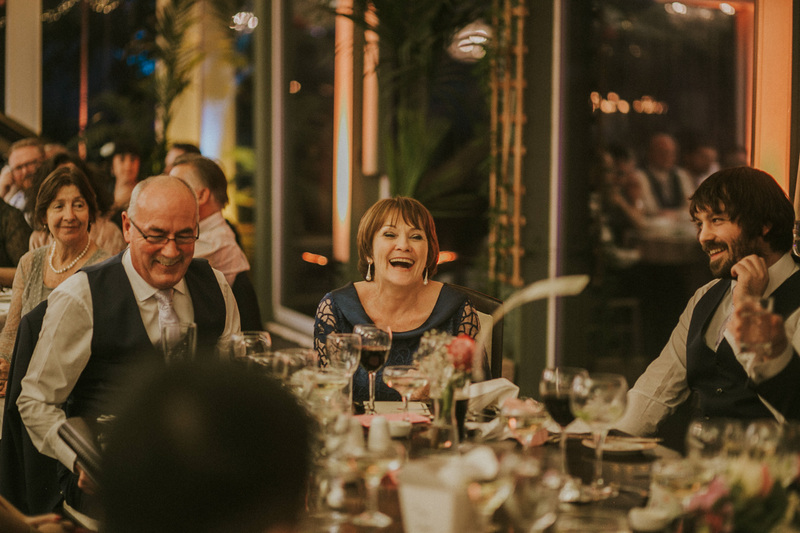 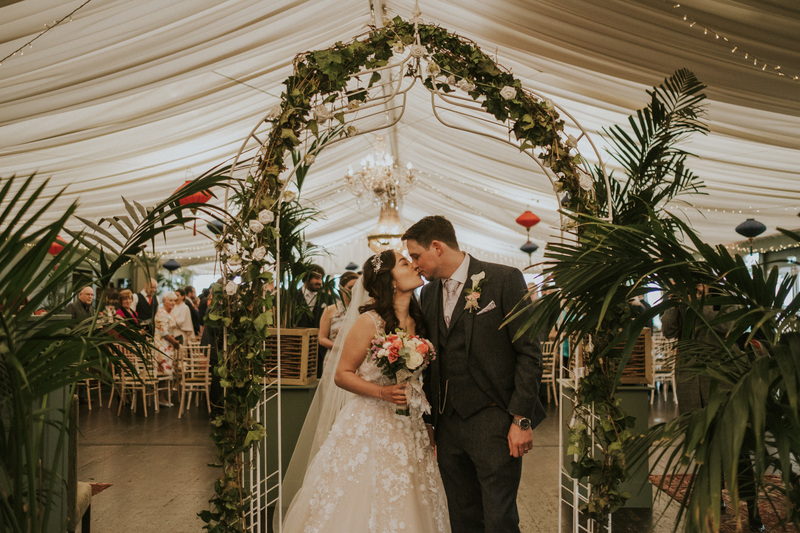 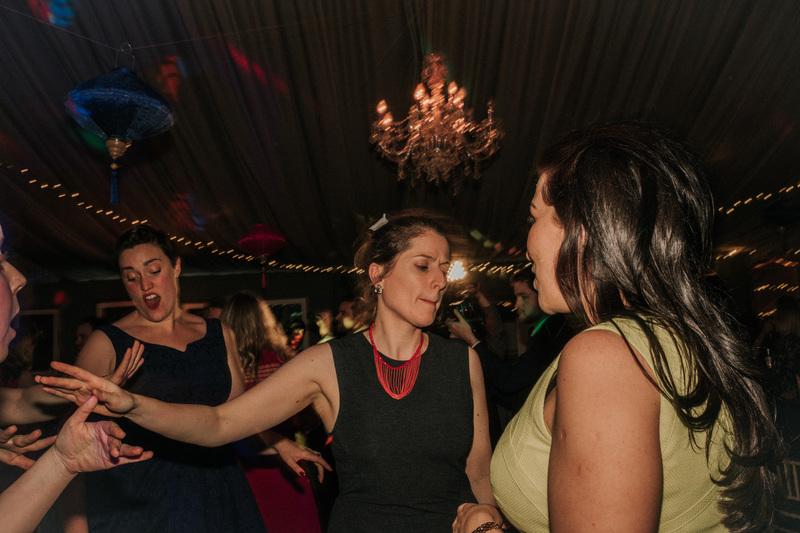 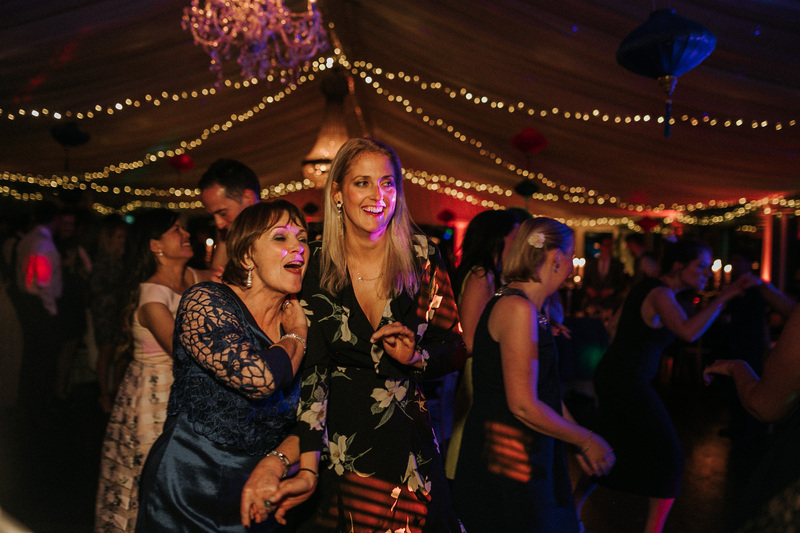 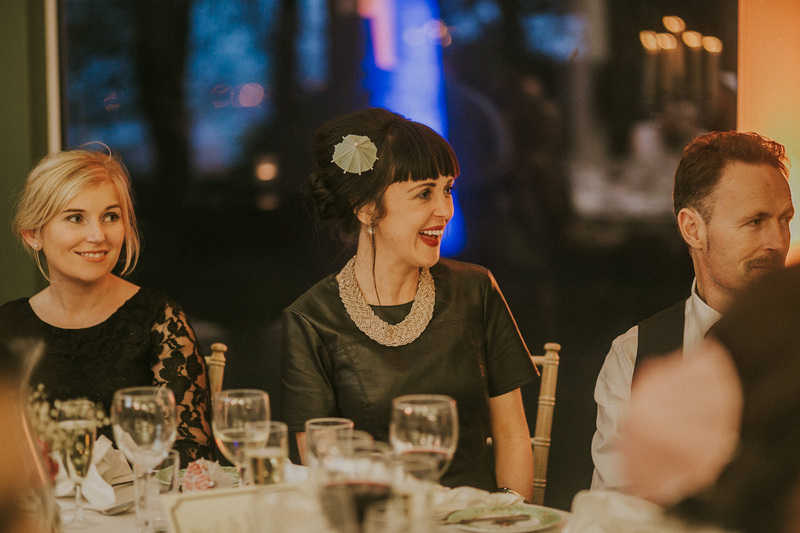 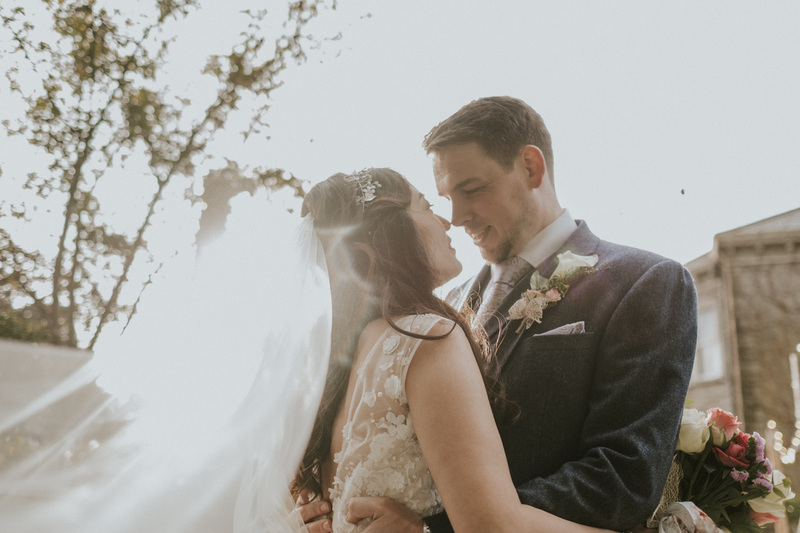 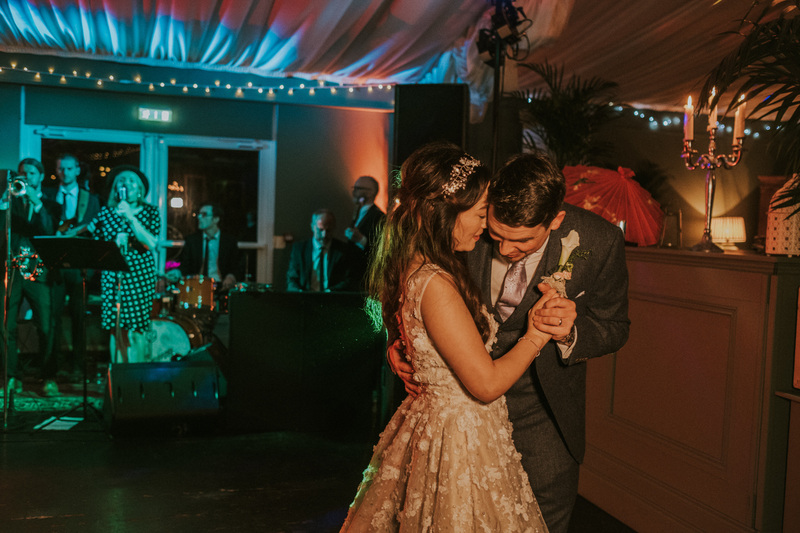 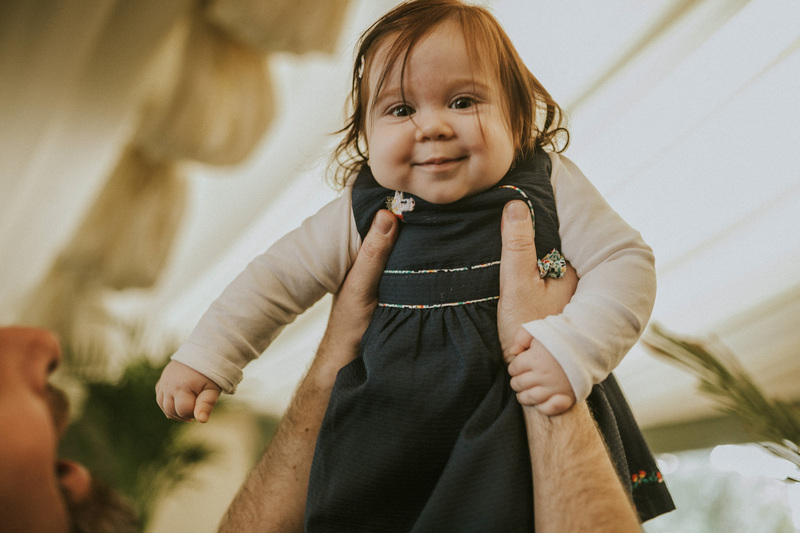 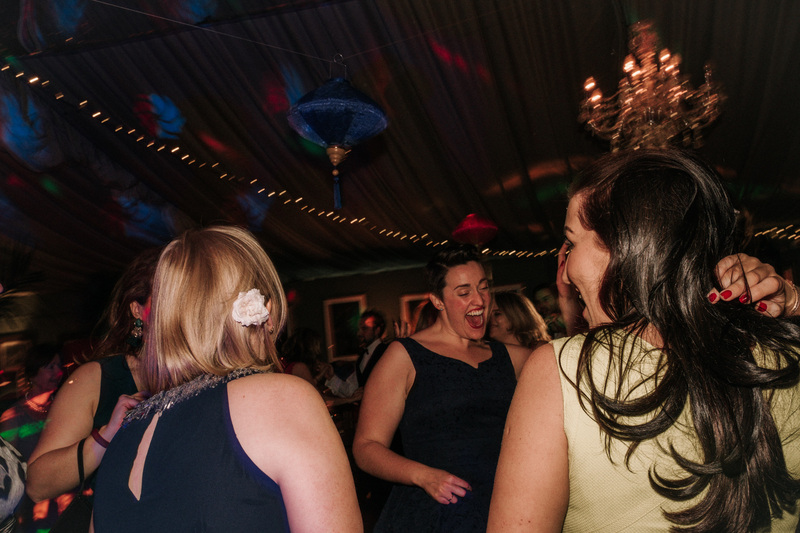 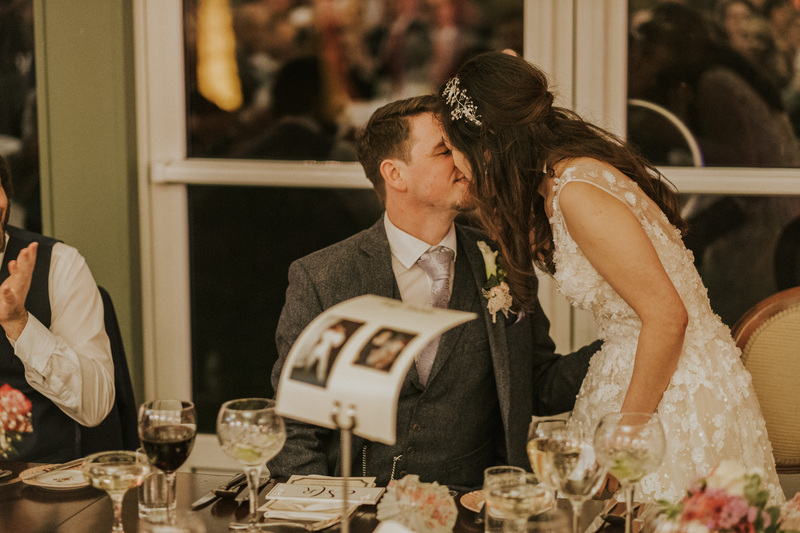 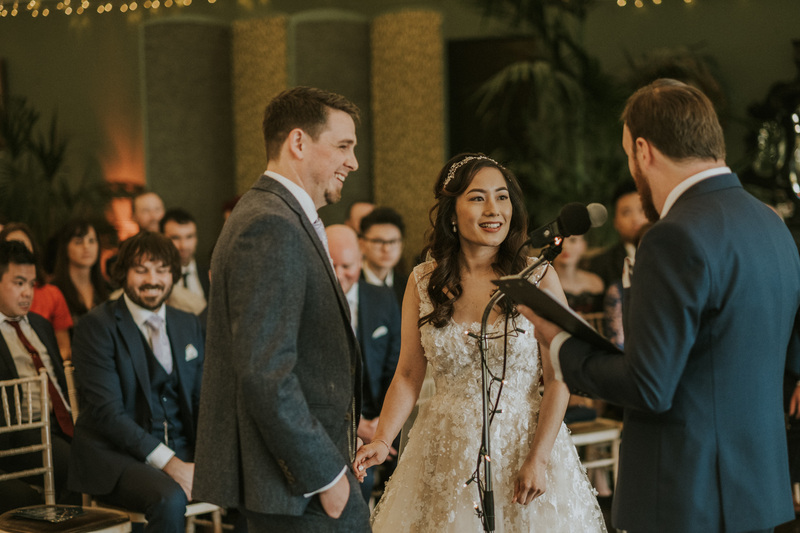 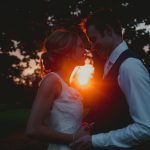 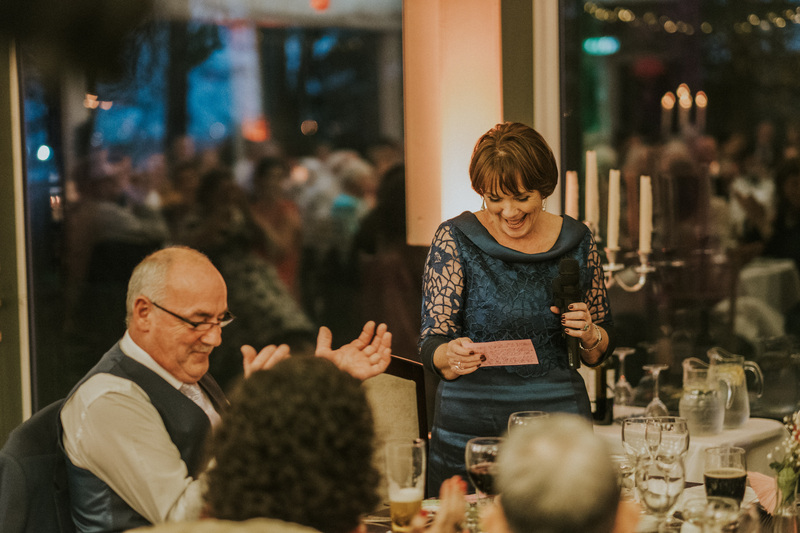 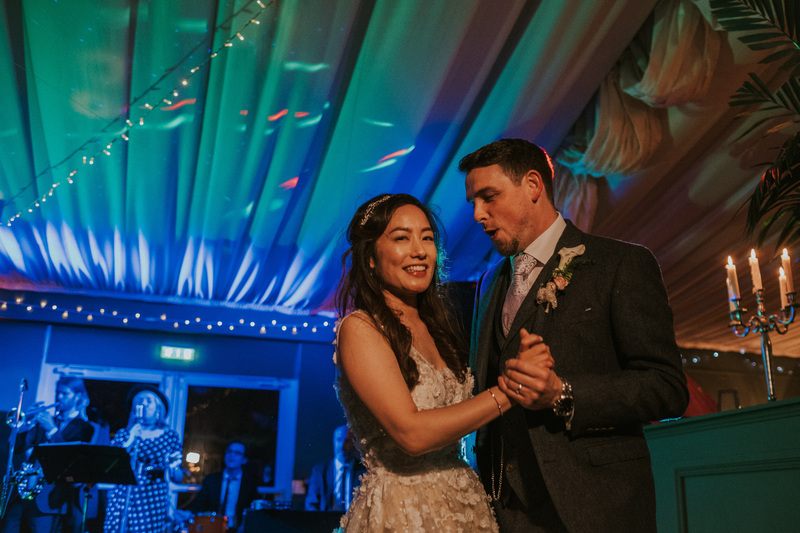 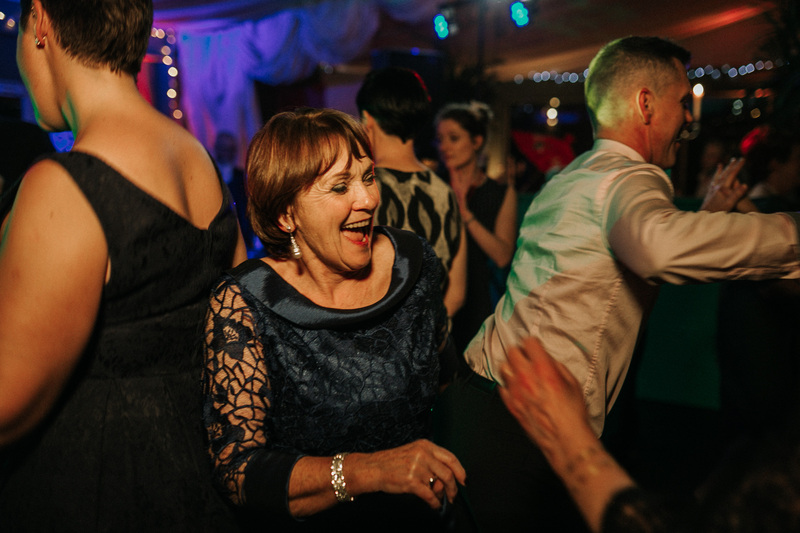 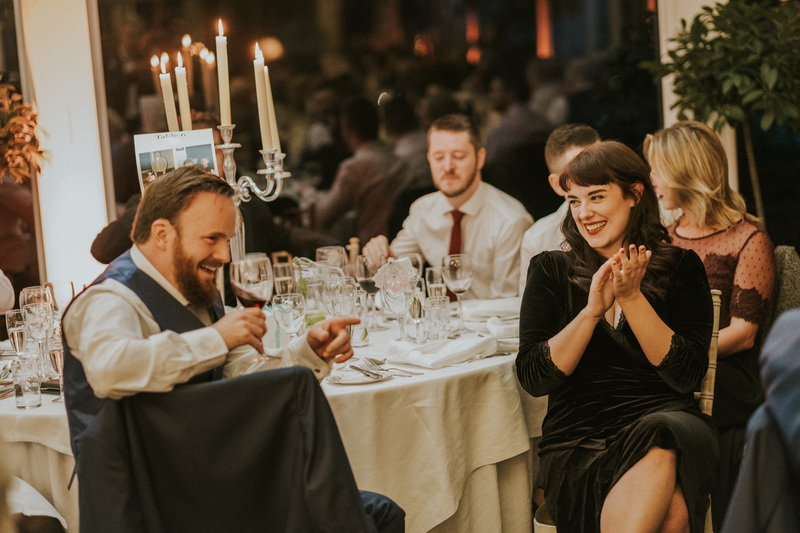 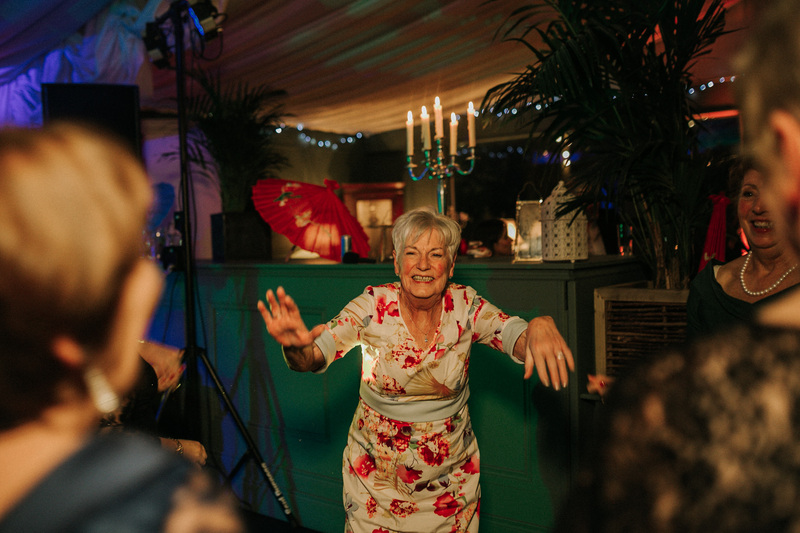 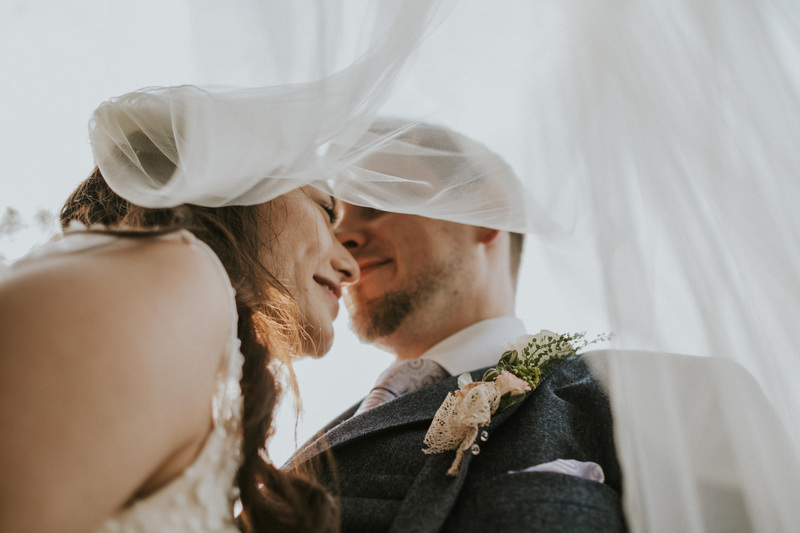 It was the perfect start for their lively evening full of dancing and celebrations. 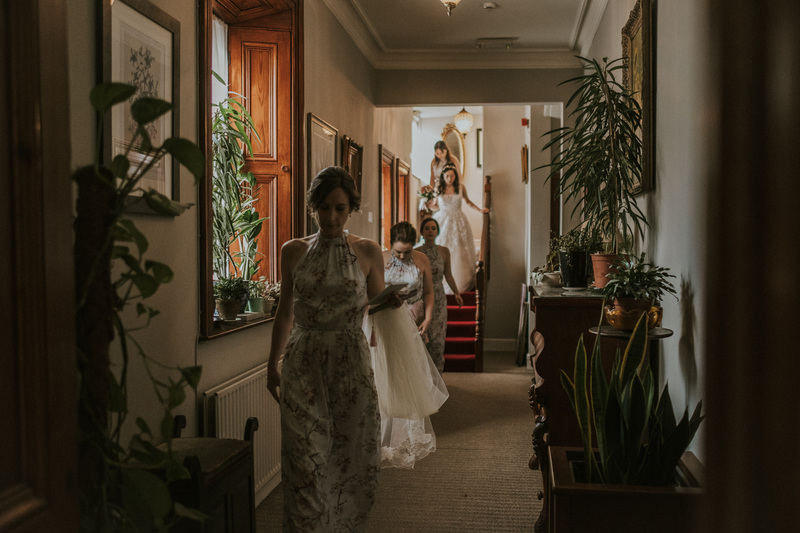 But not before quickly heading out for some evening Bridal portraits. 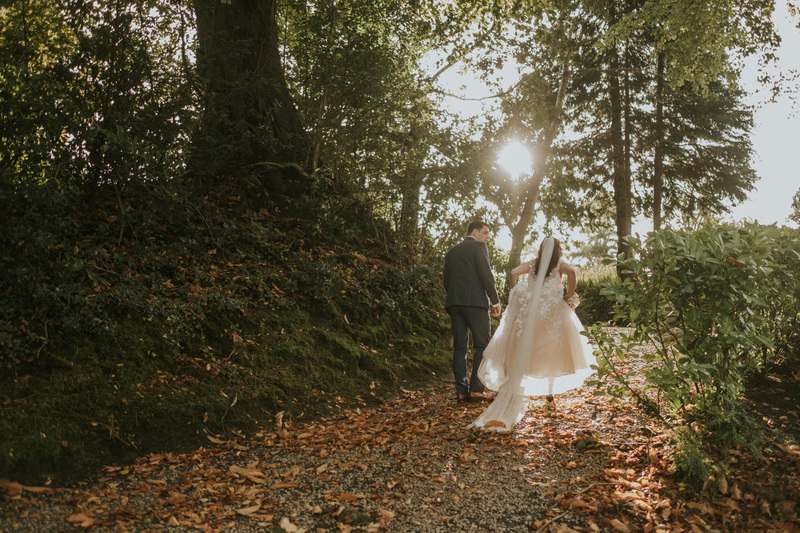 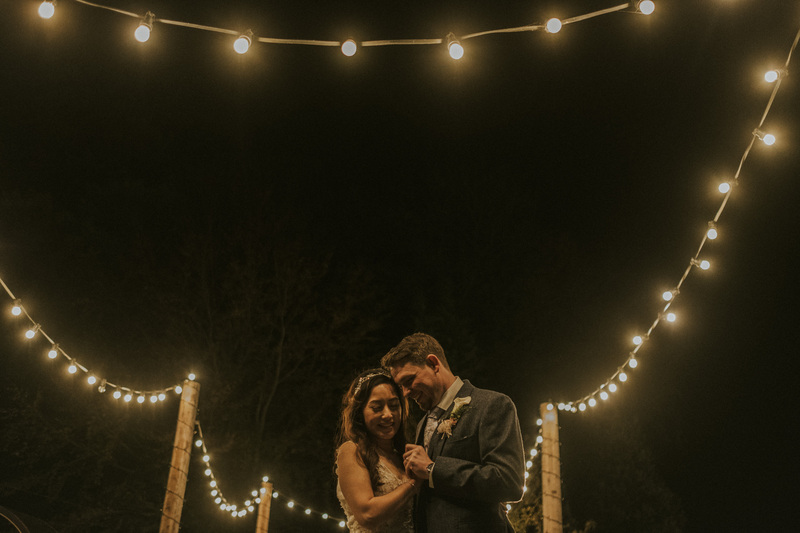 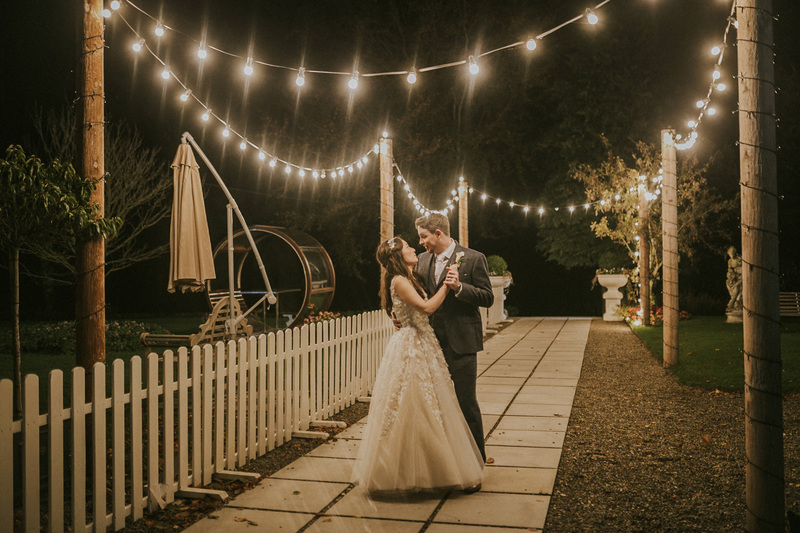 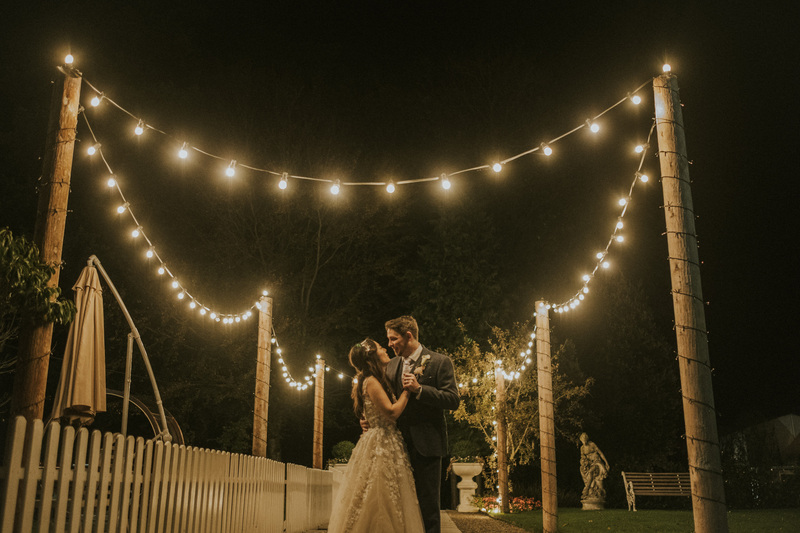 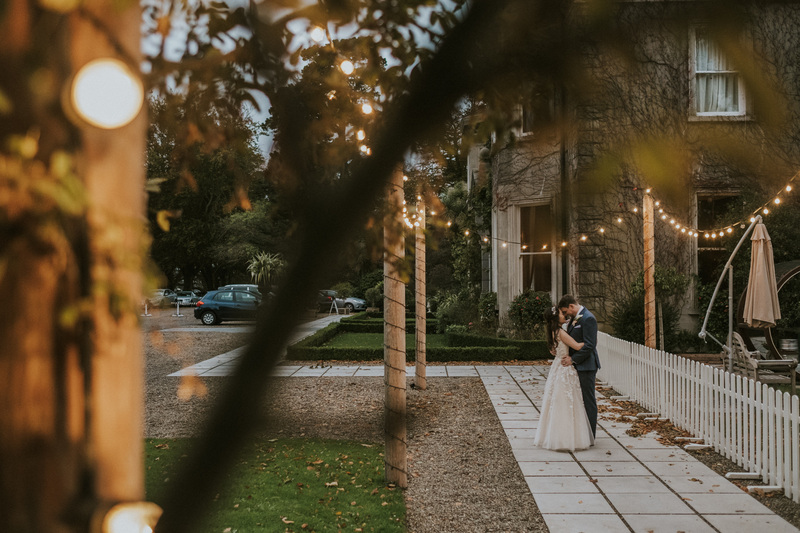 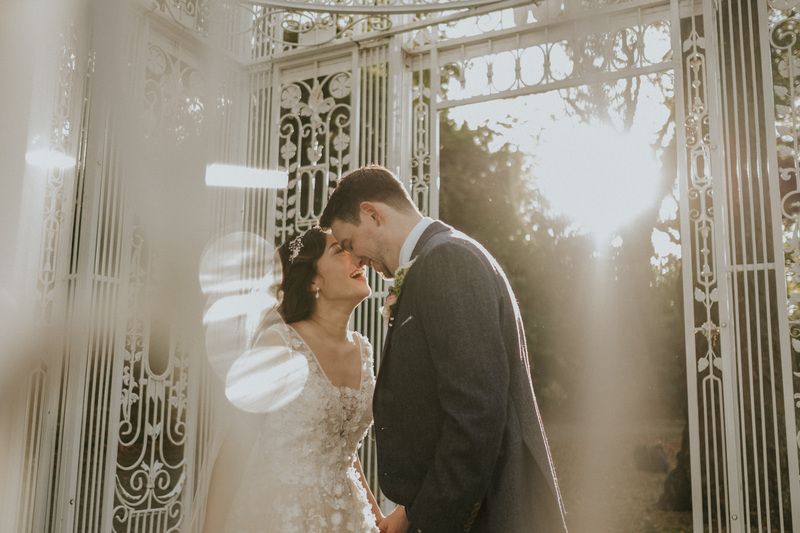 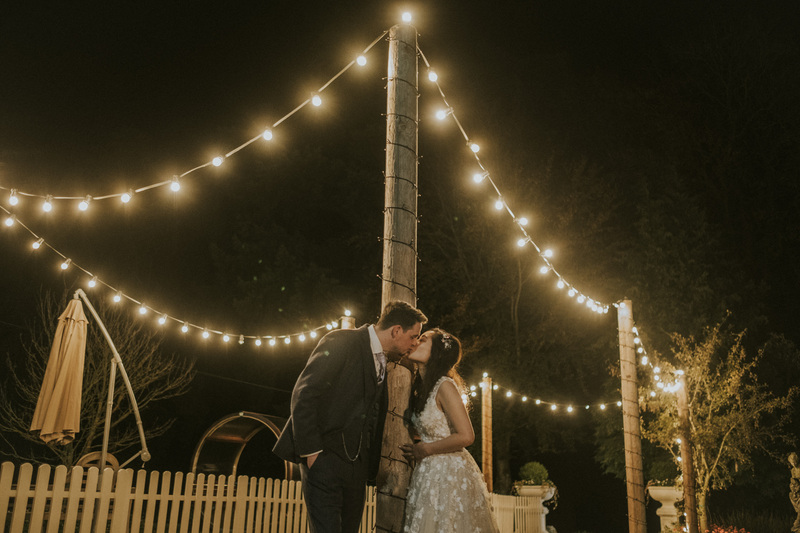 We found the perfect hanging lights brightening up a path equally as bright as this couples future. 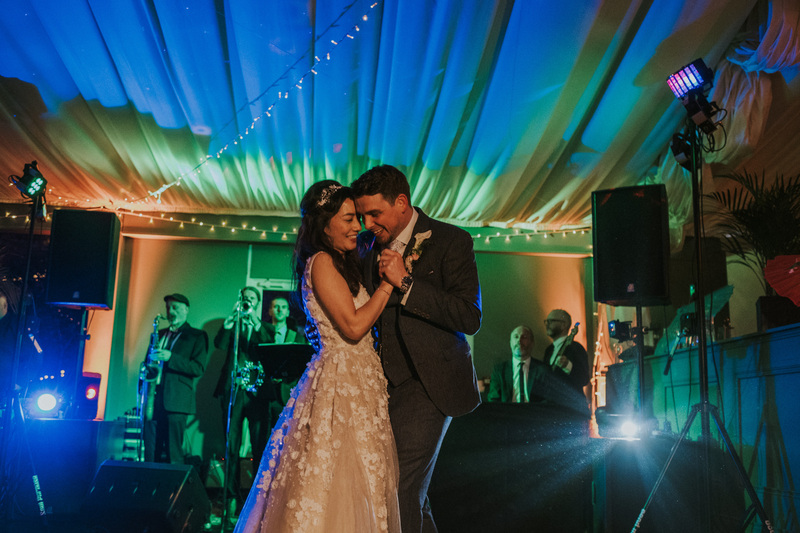 A wonderful finish to this Tinakilly House Wedding. 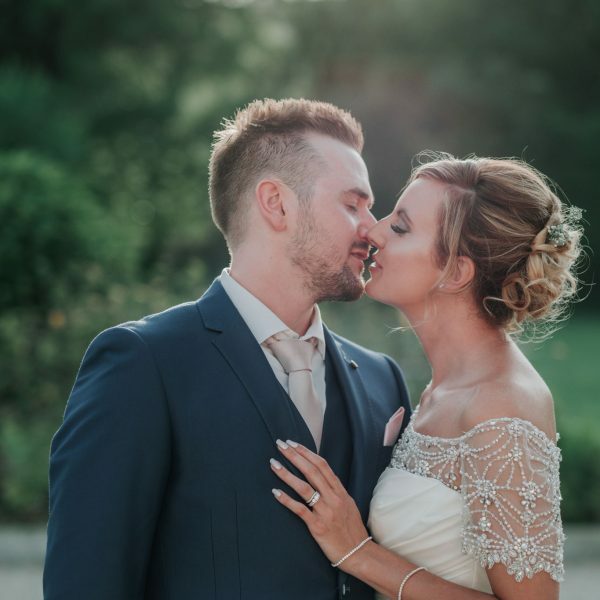 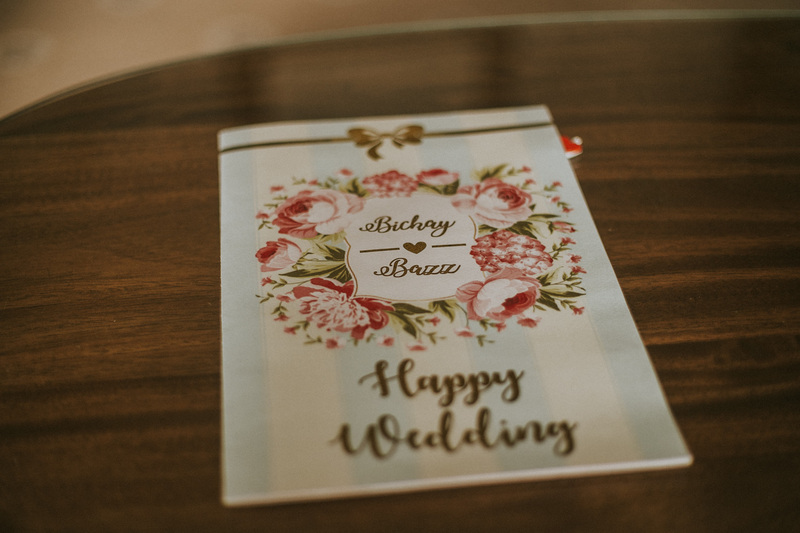 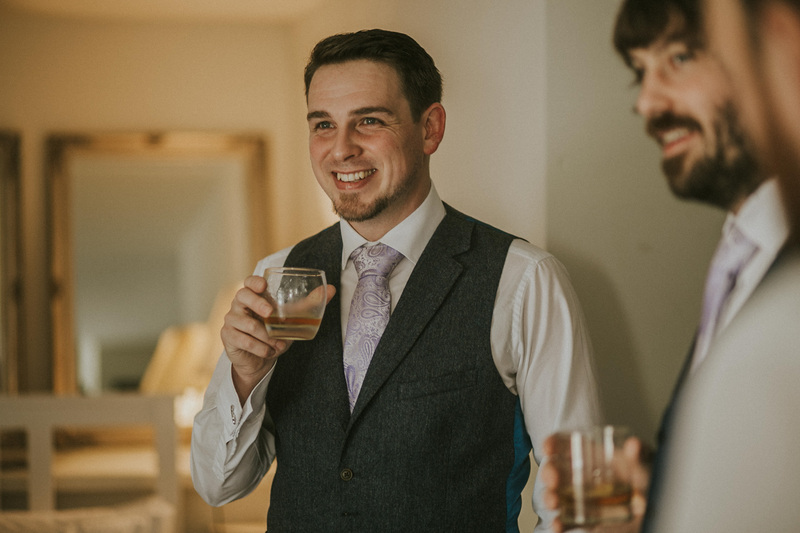 Congratulations again Bickay & Bazz – it was really Great to be part of your big day!